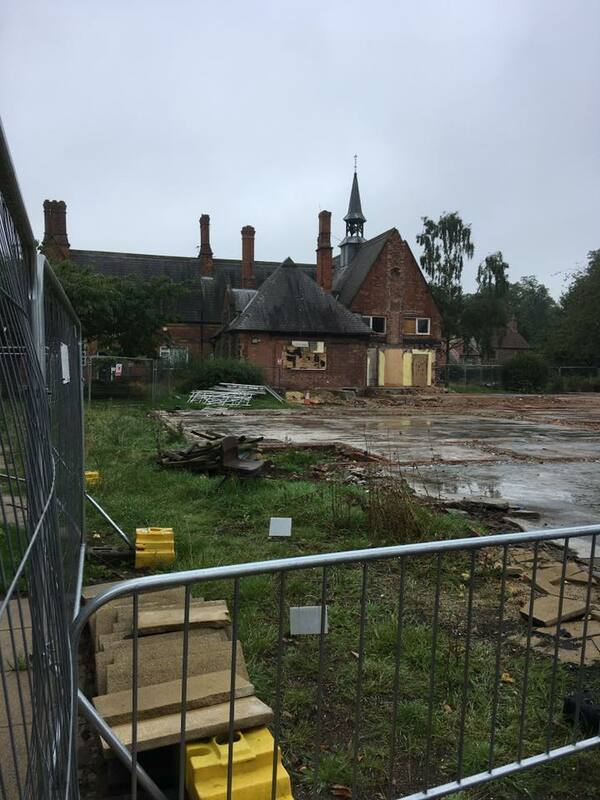 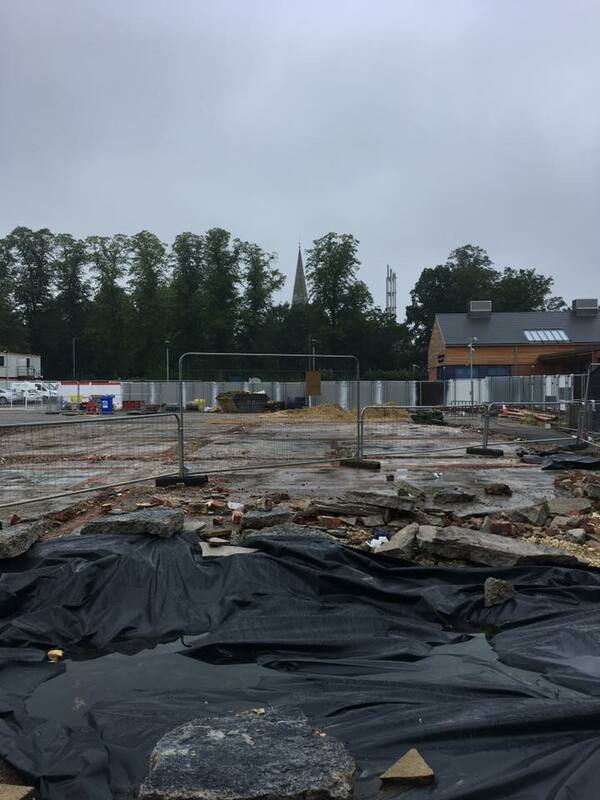 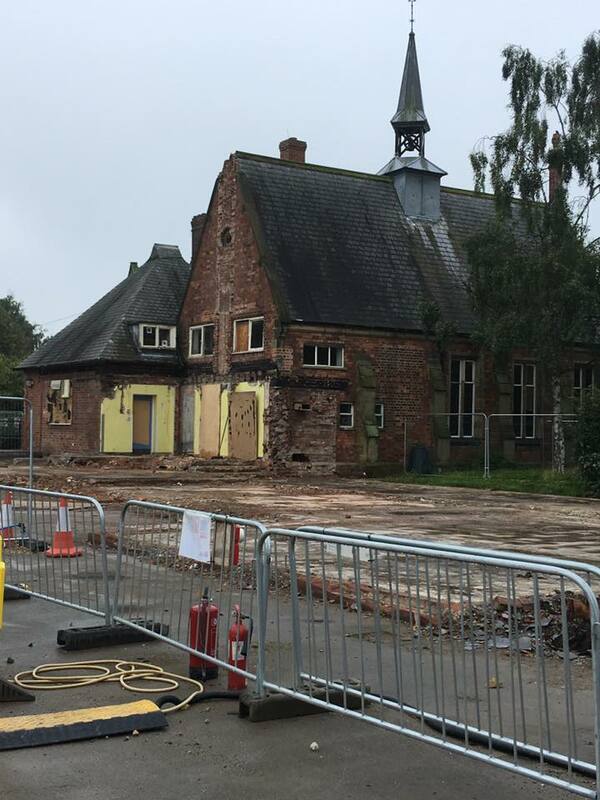 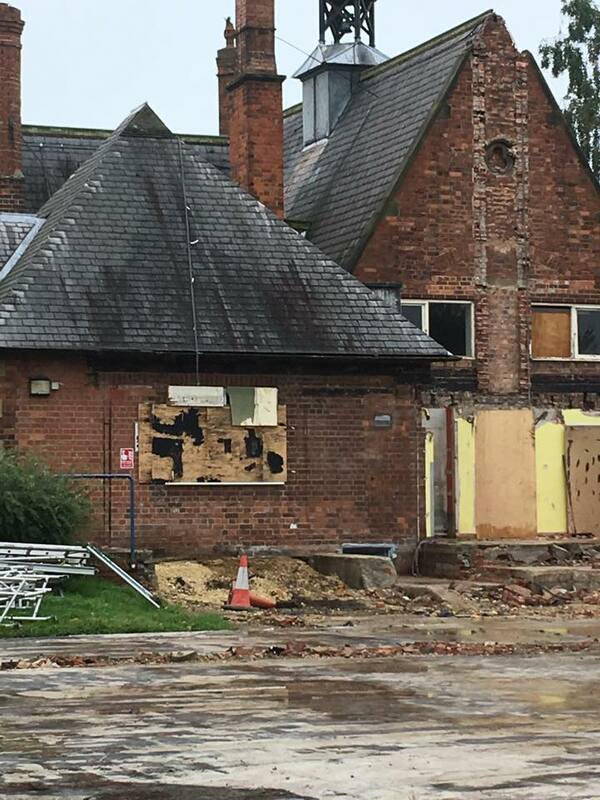 New School Build, Summer 2017, What's Happening in School? 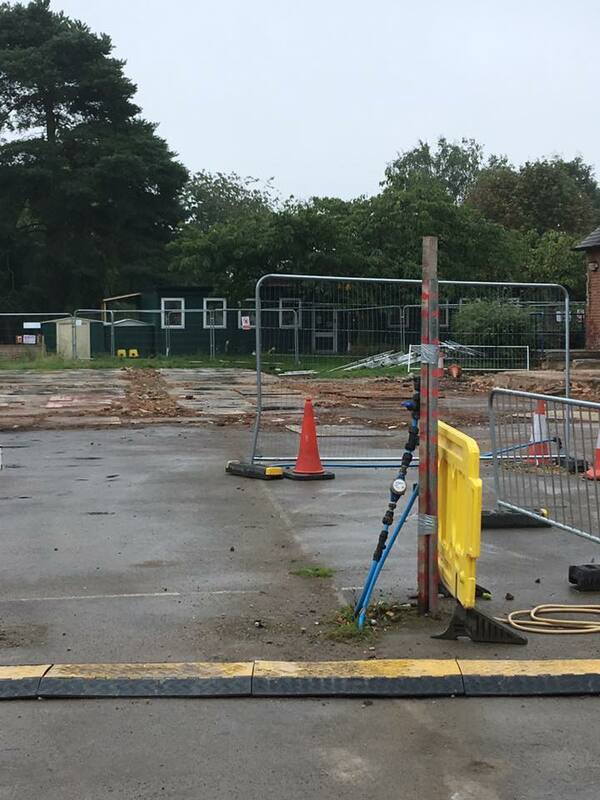 The view will be very different from out new school building when we return to school this September. 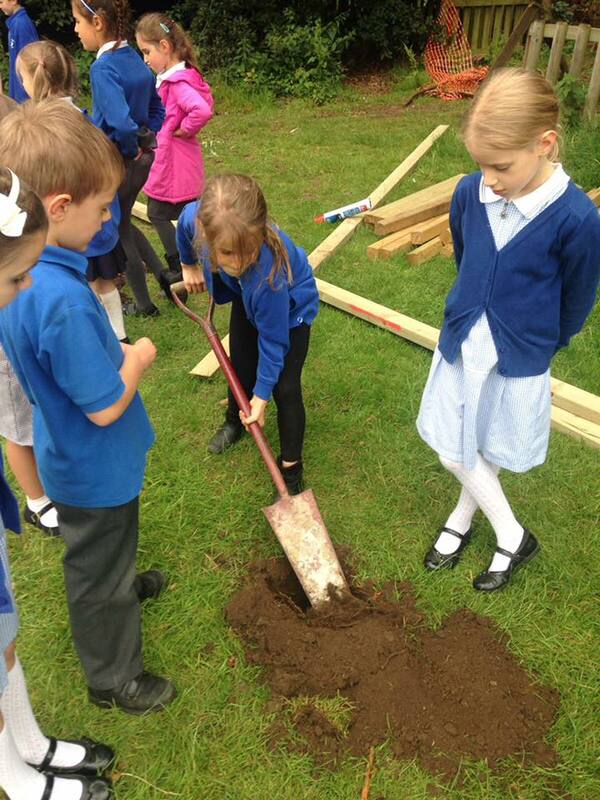 We are looking forward to having a new playground. 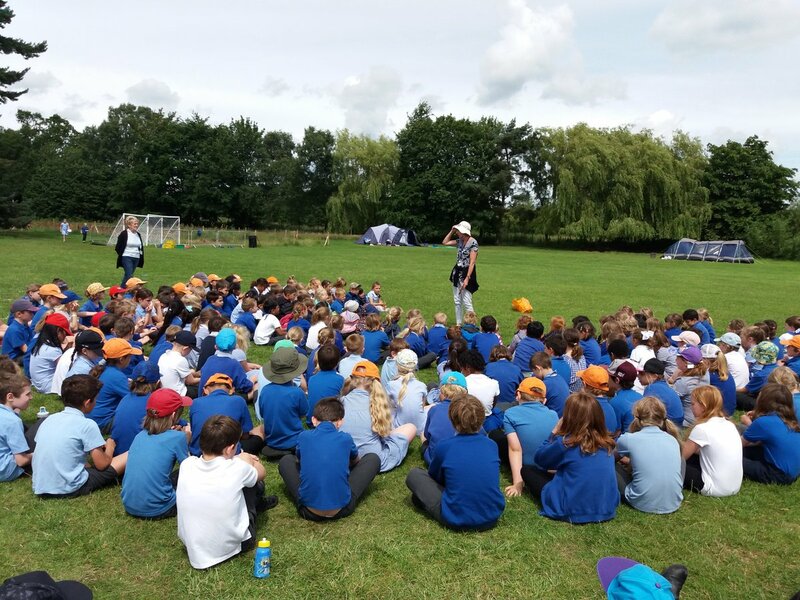 PE & Sport, Sports Day, Summer 2017, What's Happening in School? 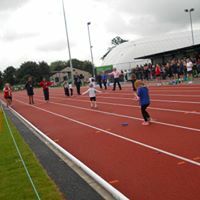 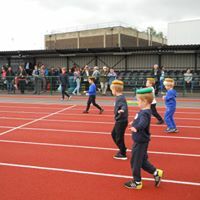 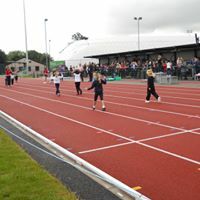 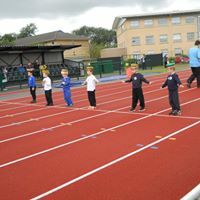 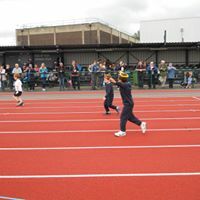 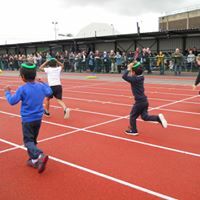 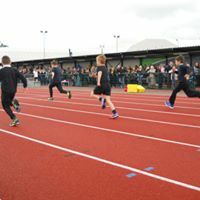 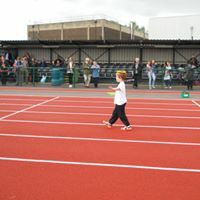 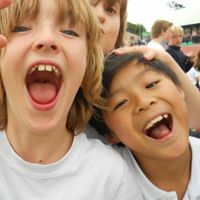 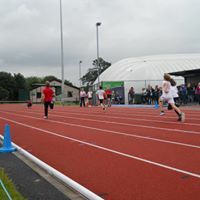 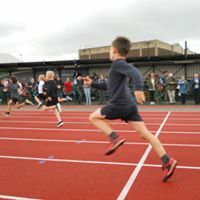 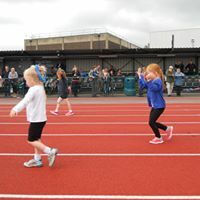 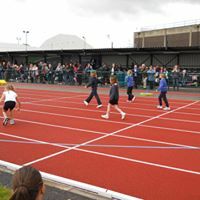 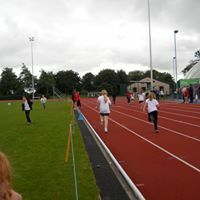 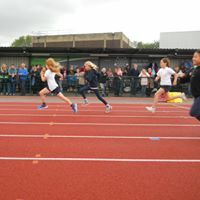 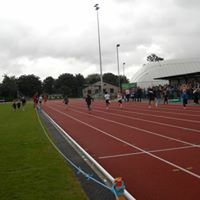 This July we held our competitive sports at the University of York all weather track again as our new school grounds are still being landscaped. 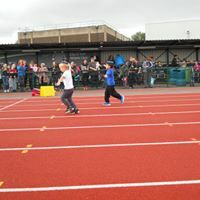 We had a great time, with many of our parents and grandparents supporting us. 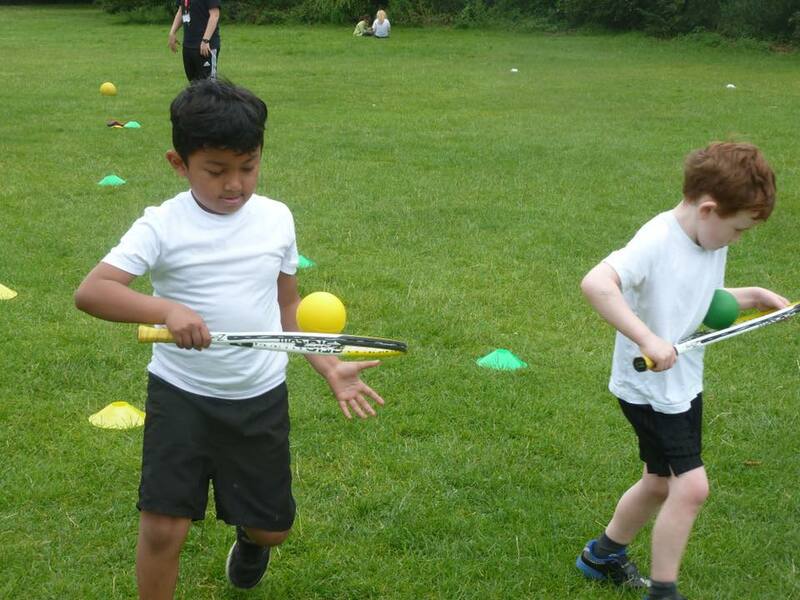 Unfortunately, our Fun Sports morning had to be cancelled this year due to the weather. 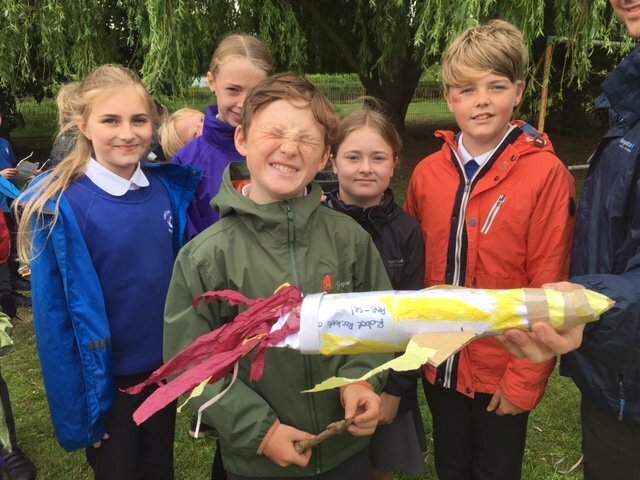 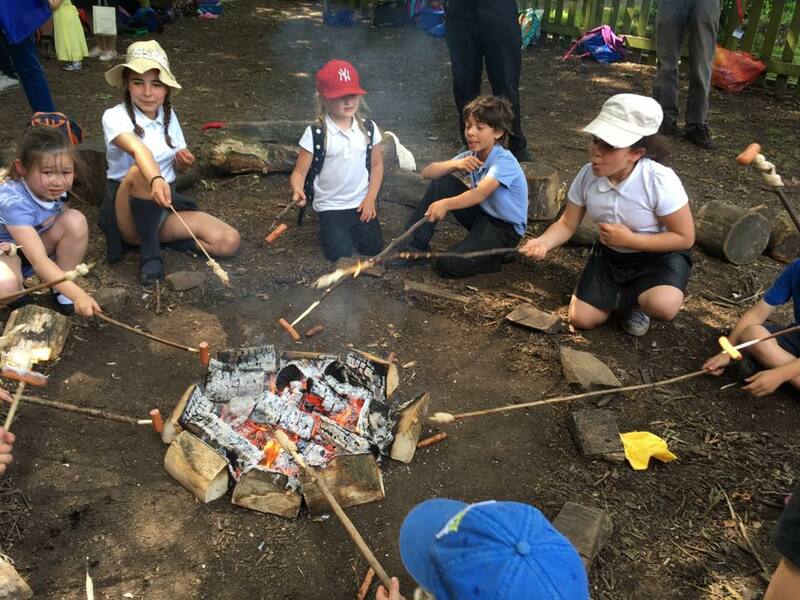 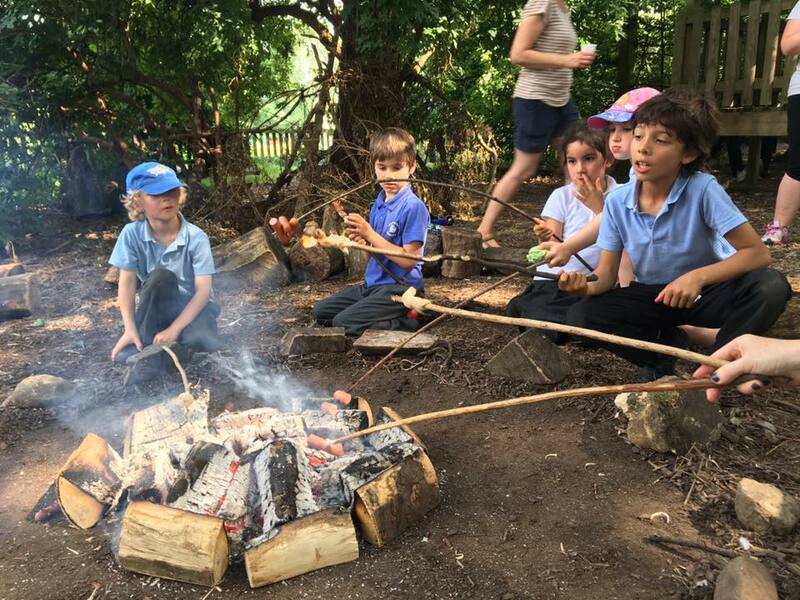 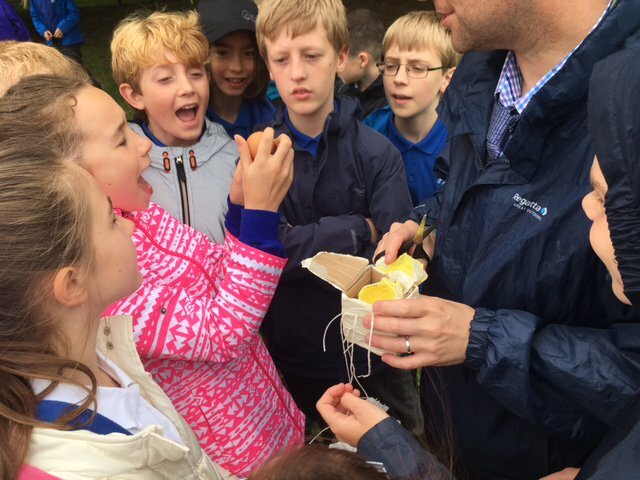 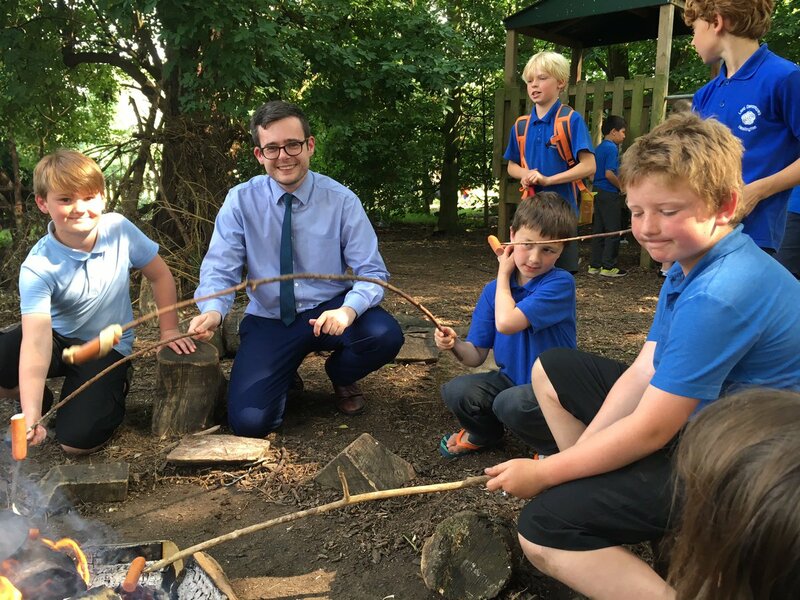 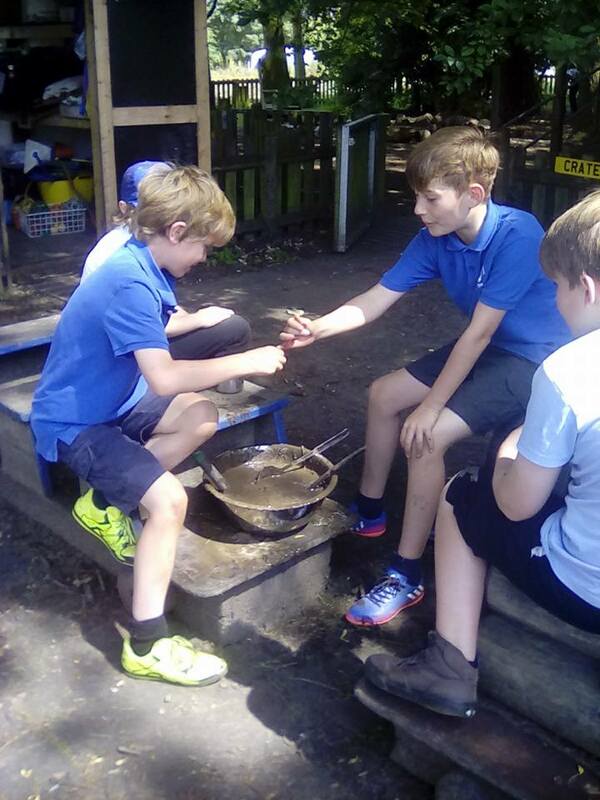 Outdoor Learning Week, Summer 2017, What's Happening in School? 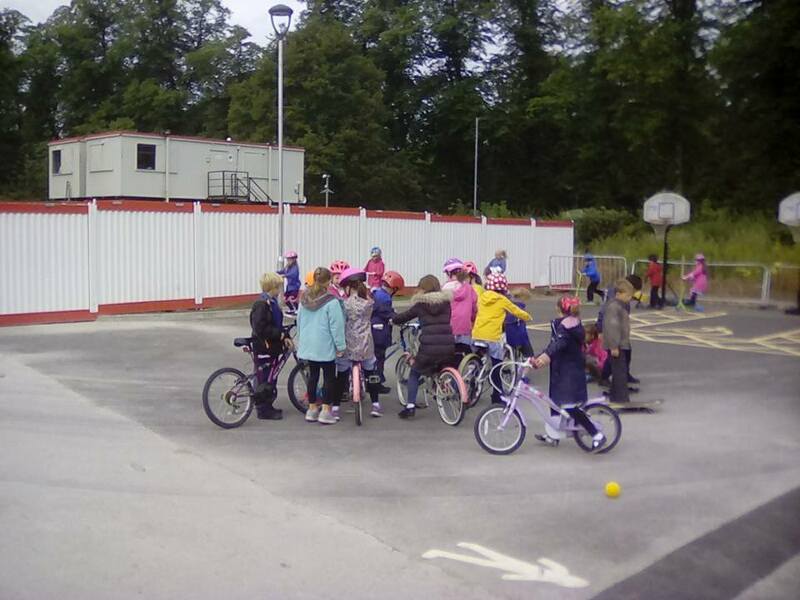 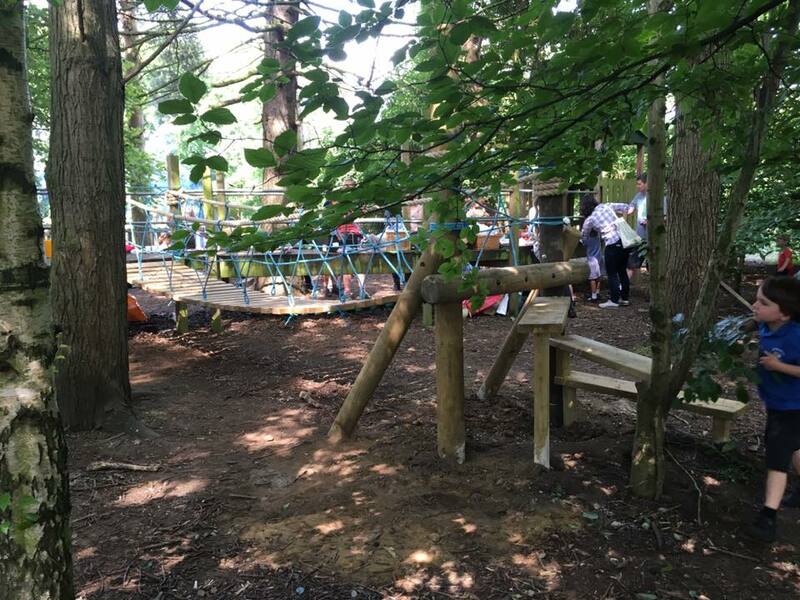 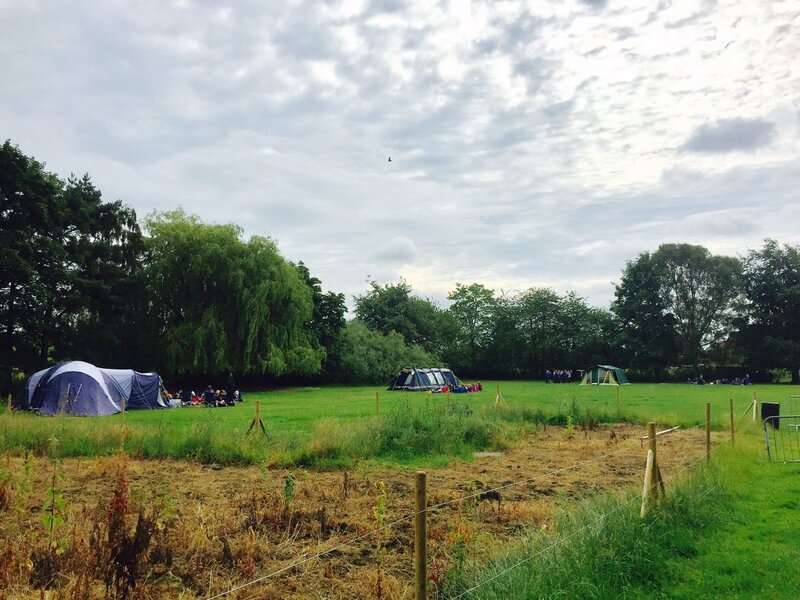 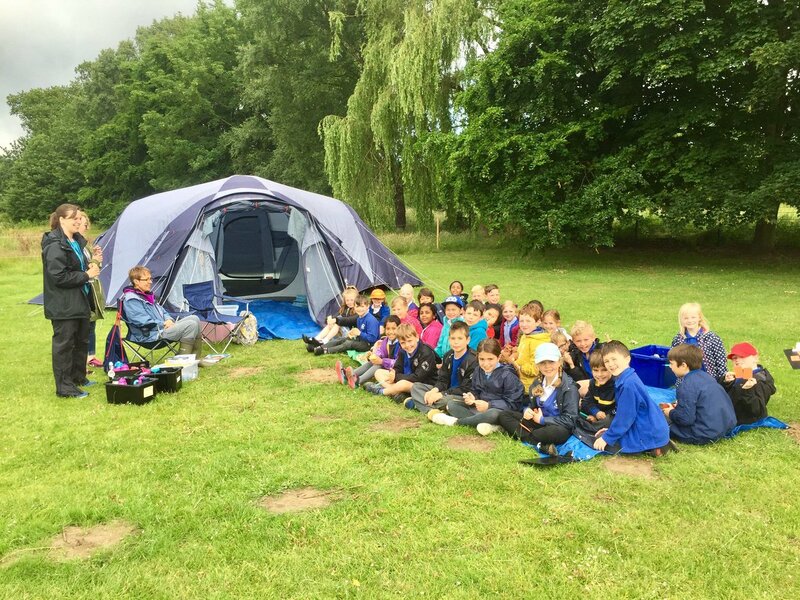 From 3rd – 7th July 2017 we held our Outdoor Learning Week. 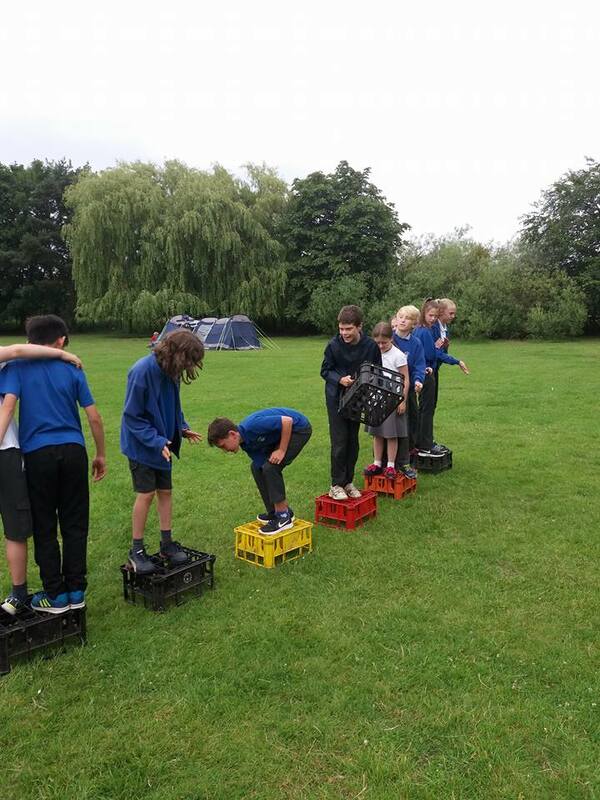 Our theme this year was ‘On the Move’. 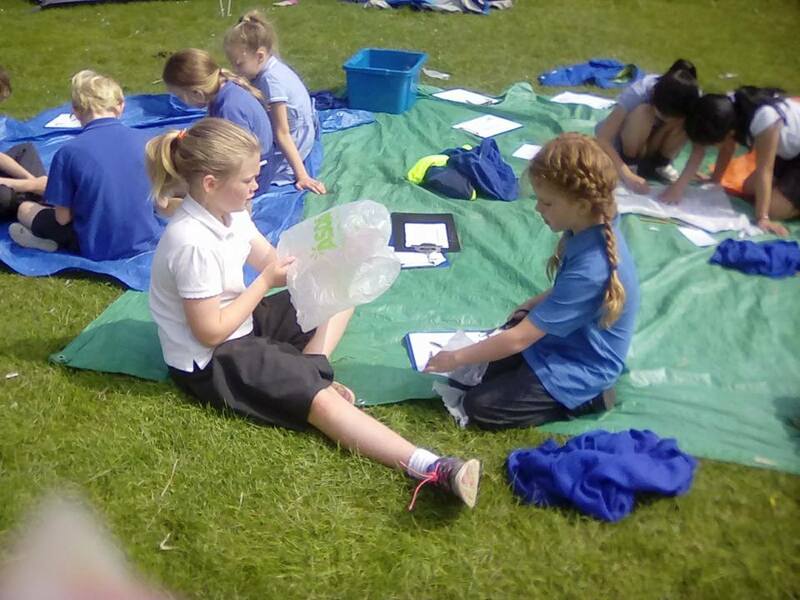 We were very lucky with the weather and everyone enjoyed all their learning experiences outside. 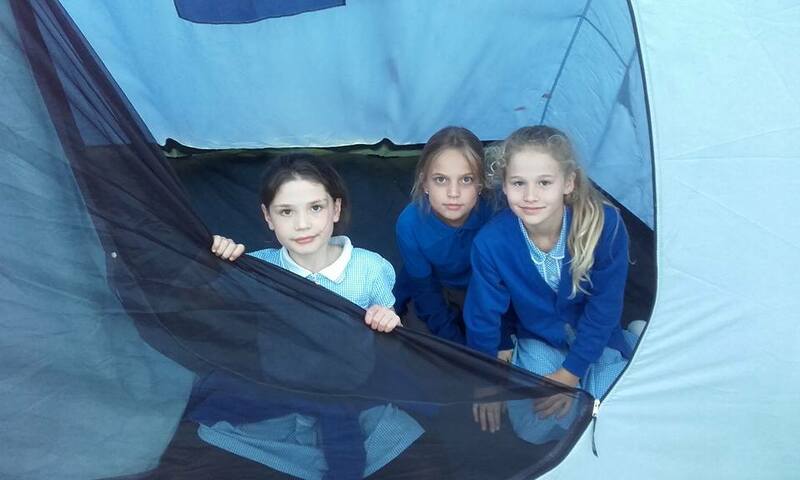 The first job was to prepare the tents which would be used as classrooms for the week. 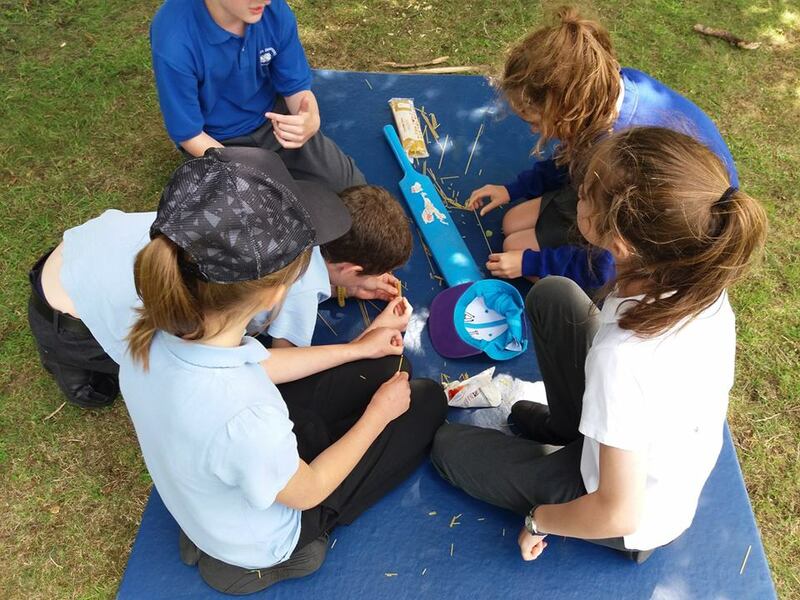 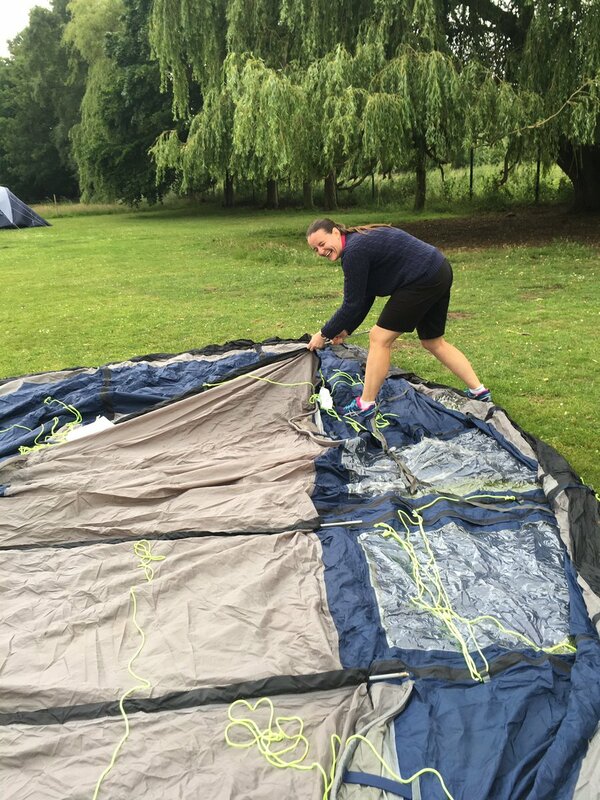 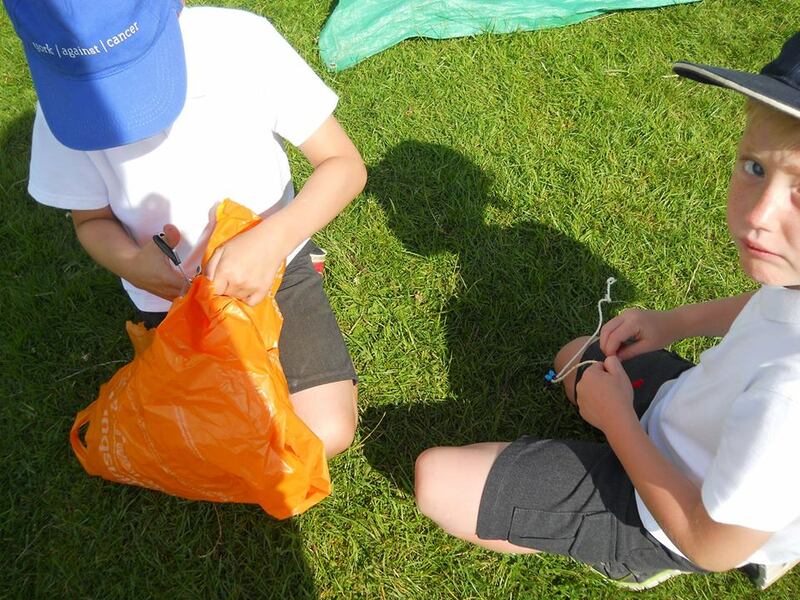 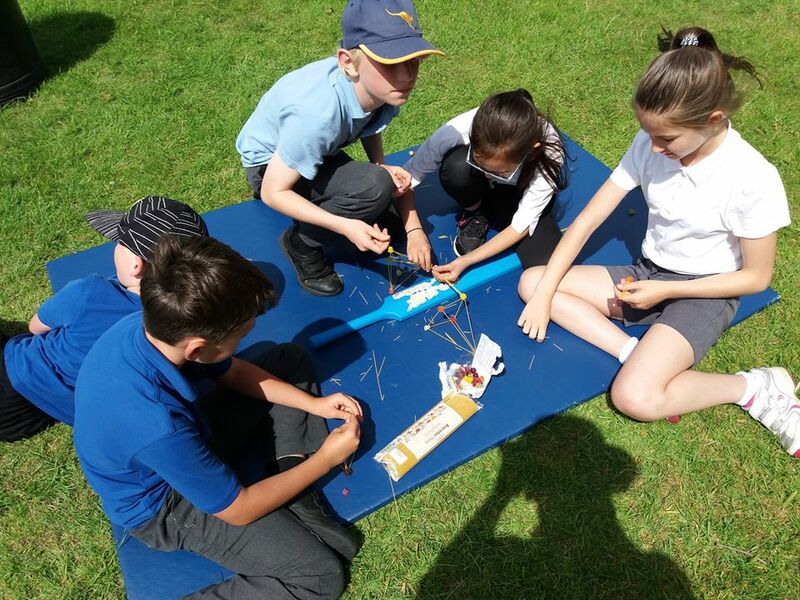 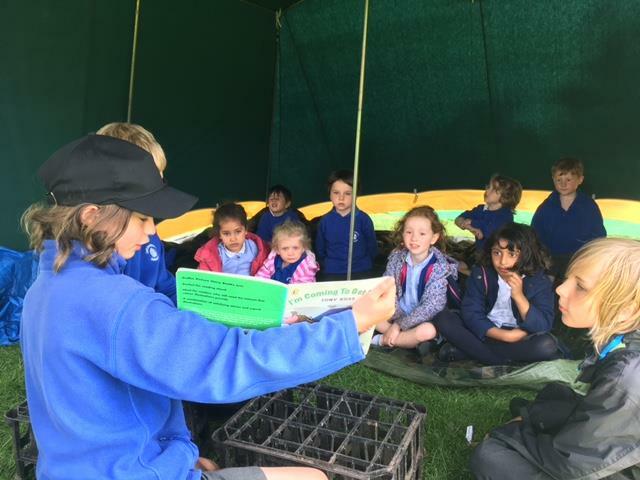 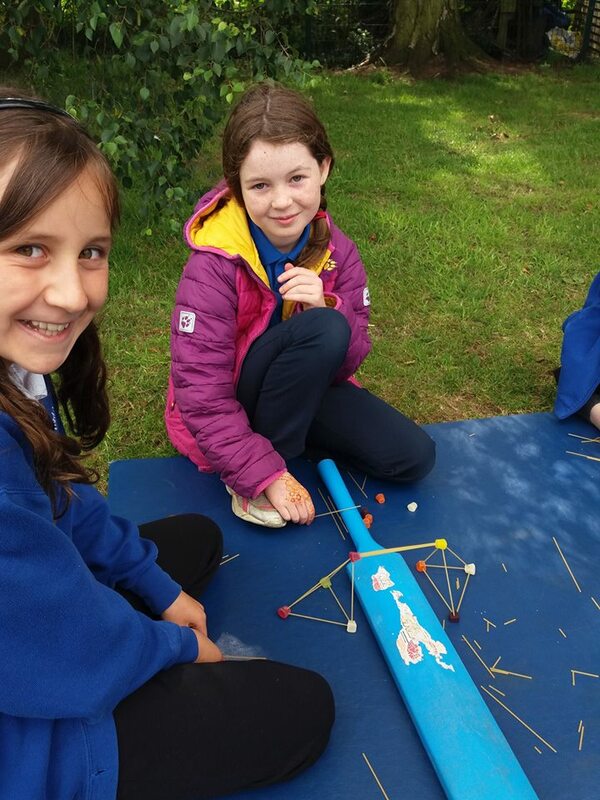 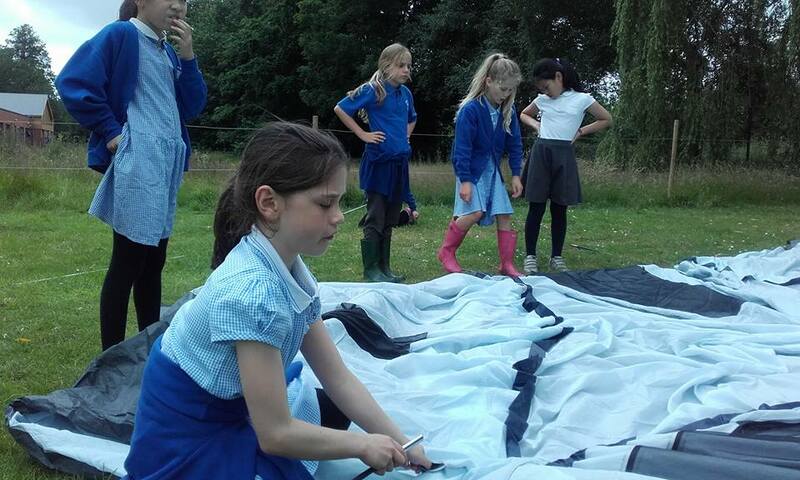 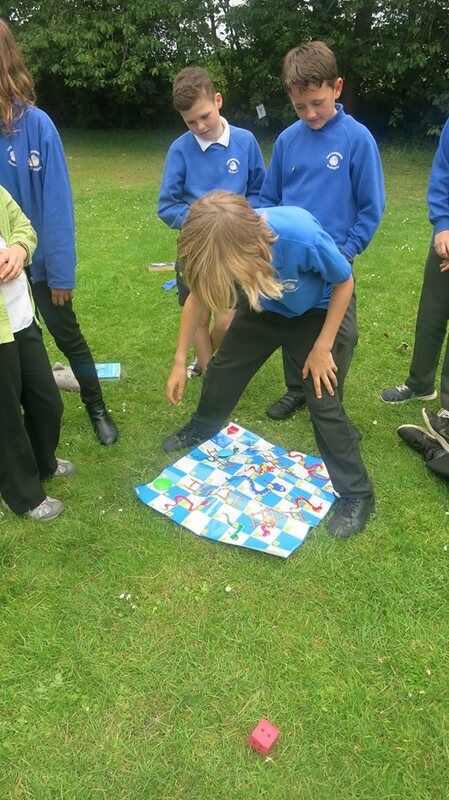 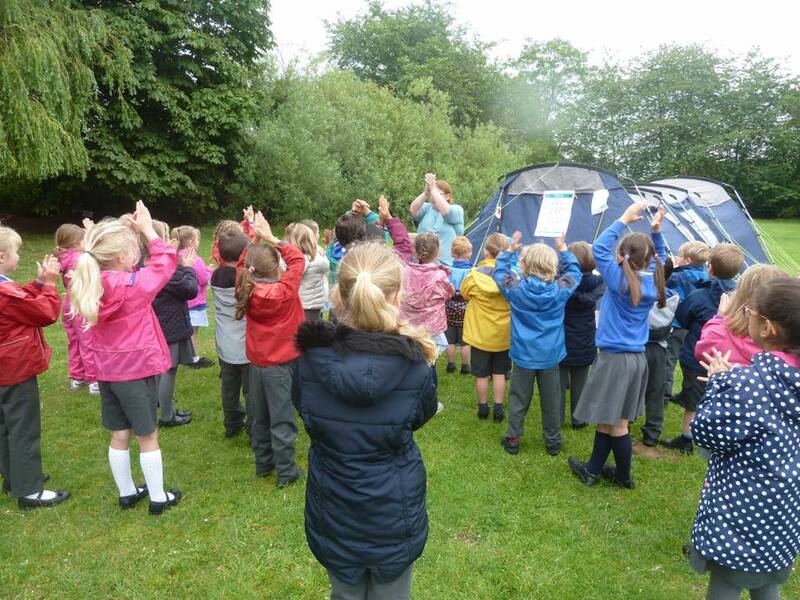 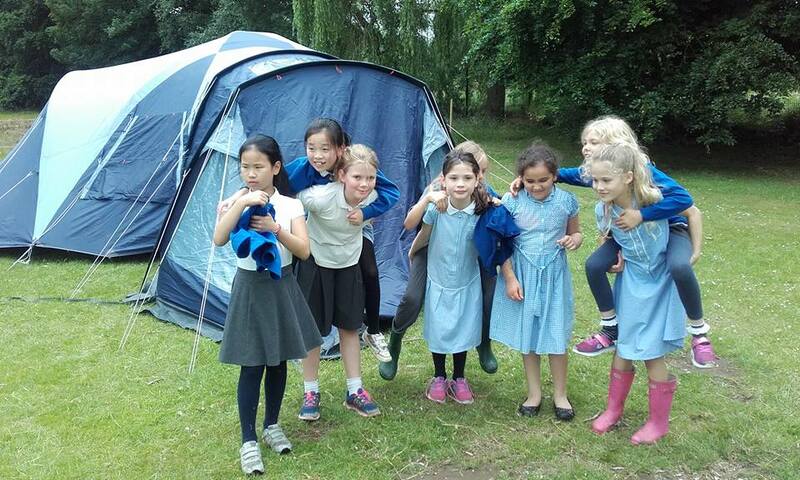 Year 4 were amazing – working as a team to put their tent up. 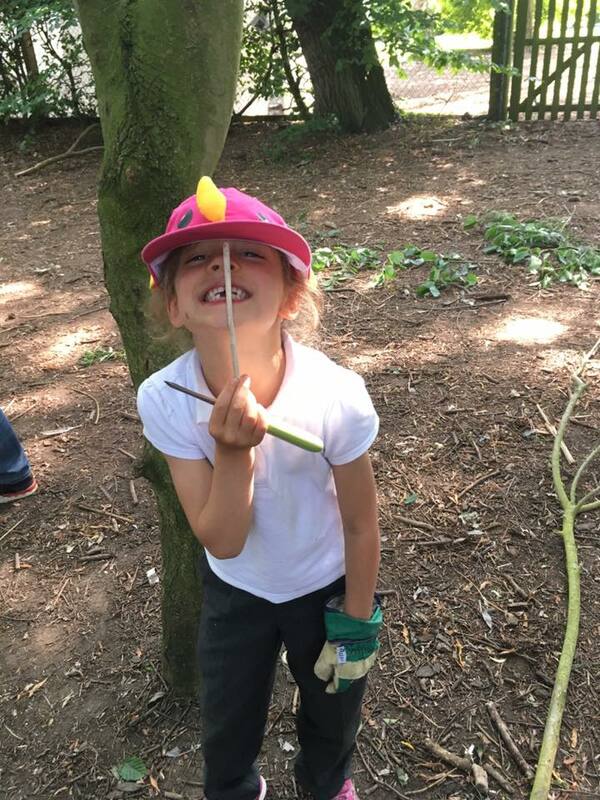 Miss Smith challenged herself to put one up on her own! 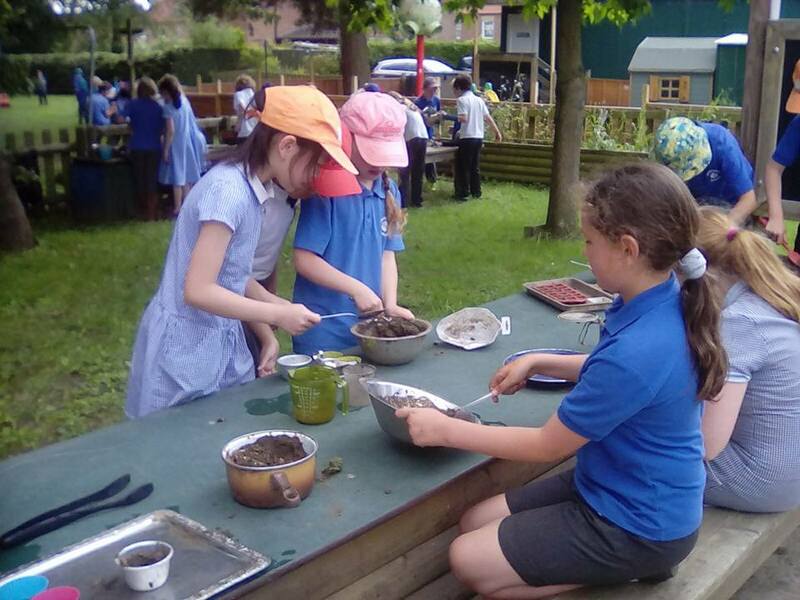 Everything takes place outside for the whole week. 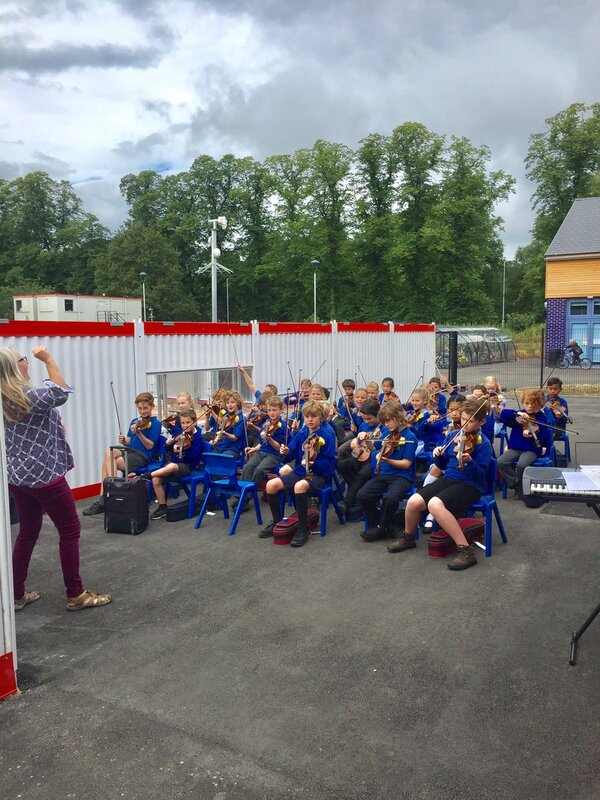 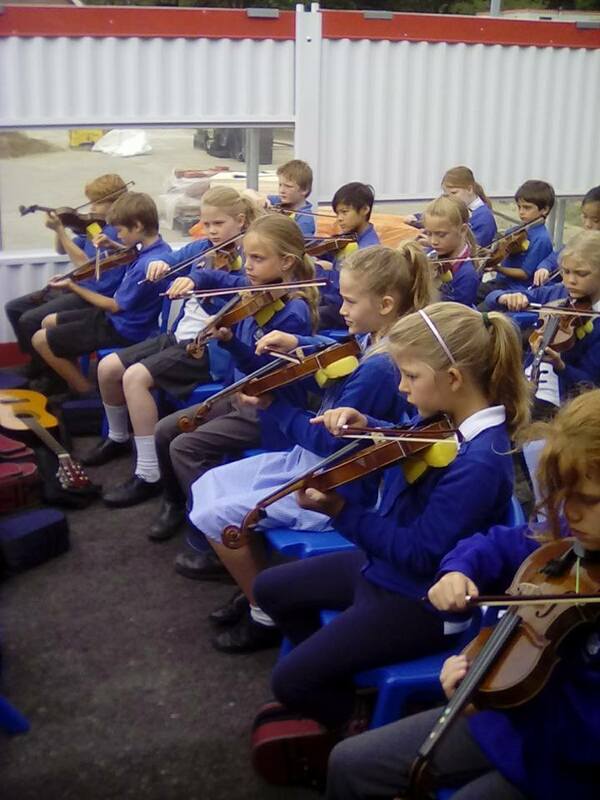 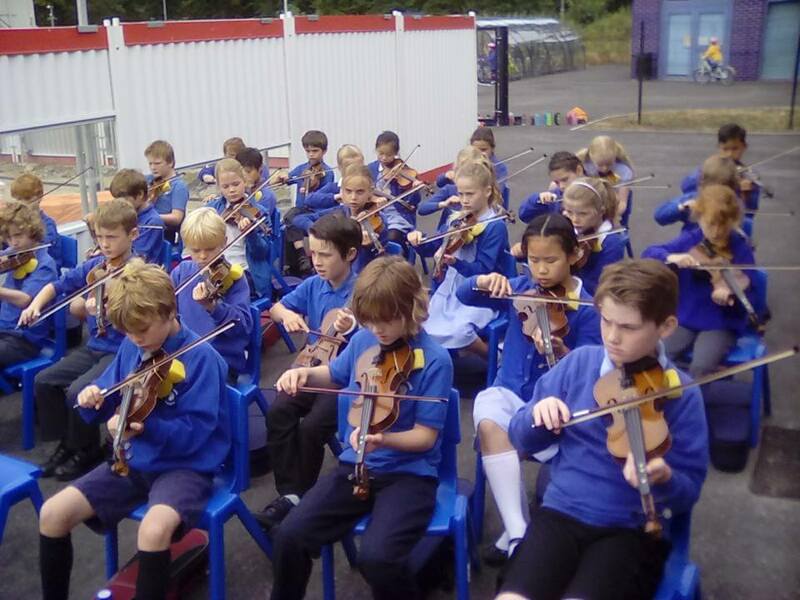 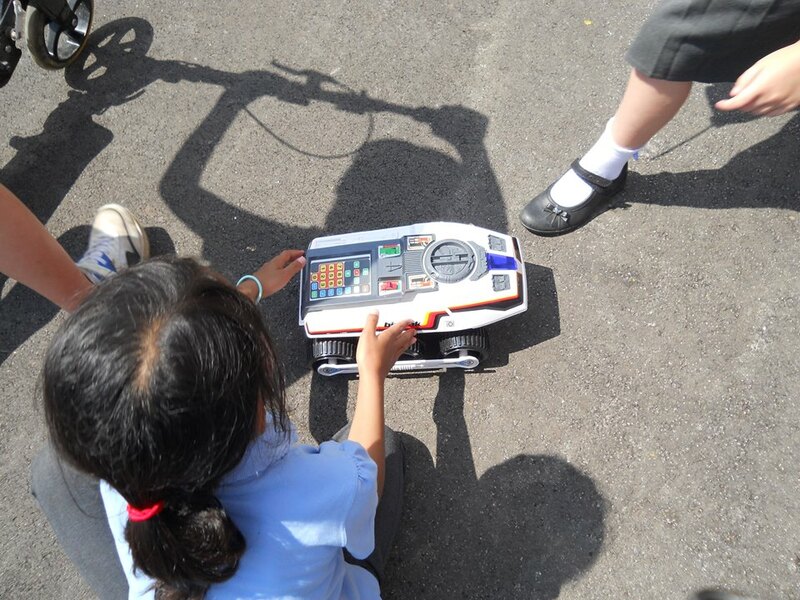 Assemblies, weekly story club for the Early Years children and Year 4 even had their violin lesson outdoors! 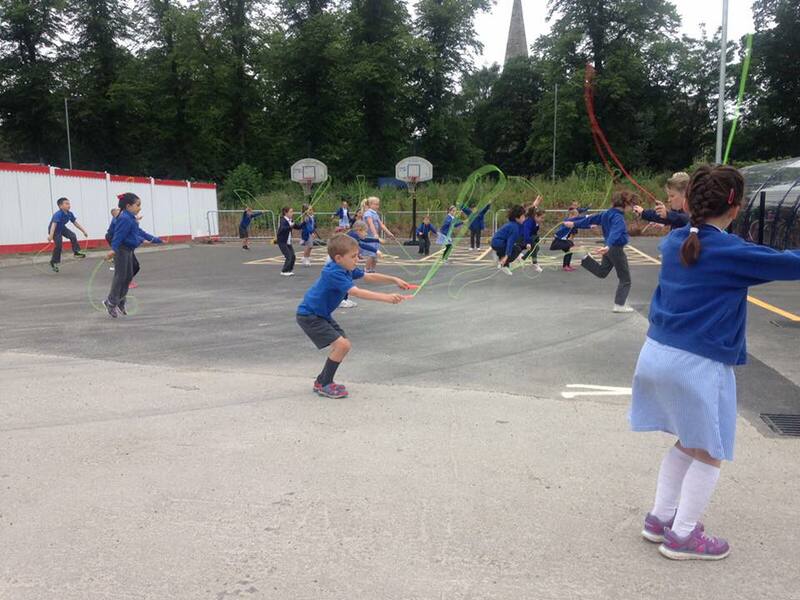 Each class also took part in a skipping session, learning new skills. 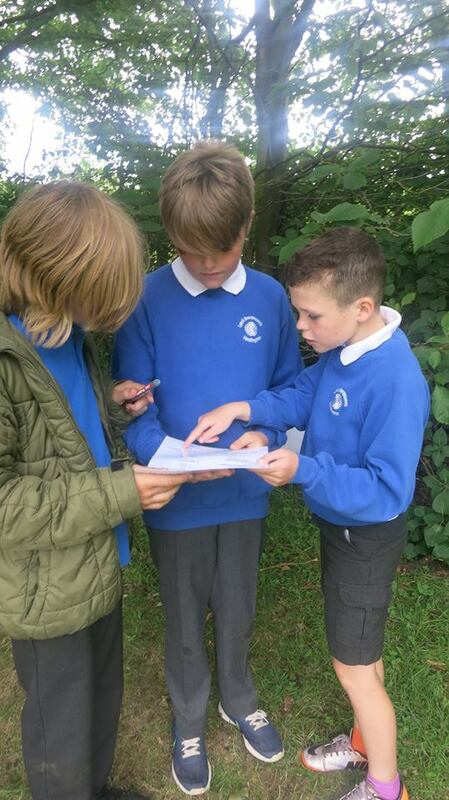 Weekly French lessons were also outside. 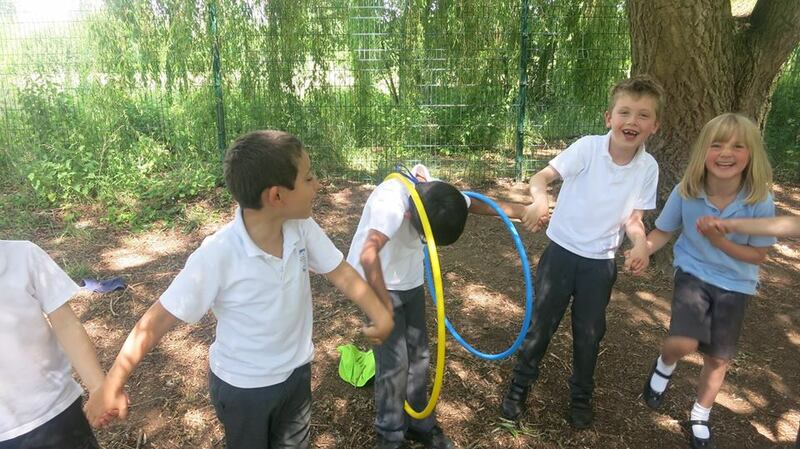 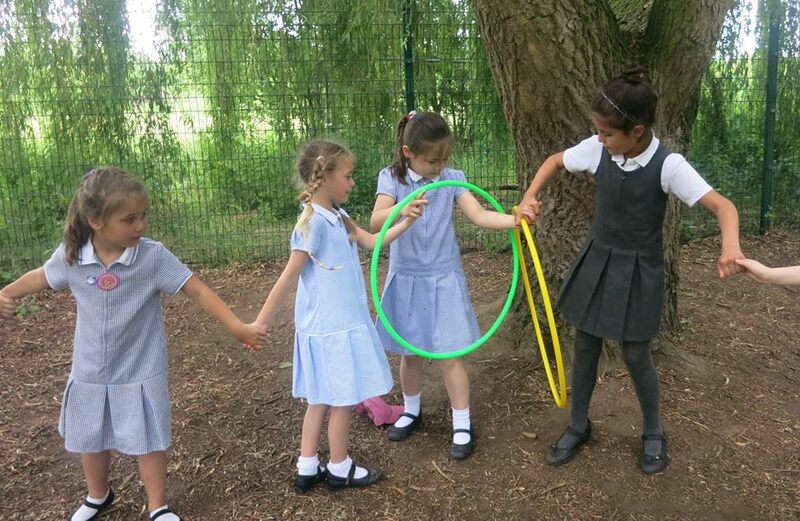 Years 1 and 2 were challenged to pass a hoop (un cerceau) around in a circle whilst holding hands. 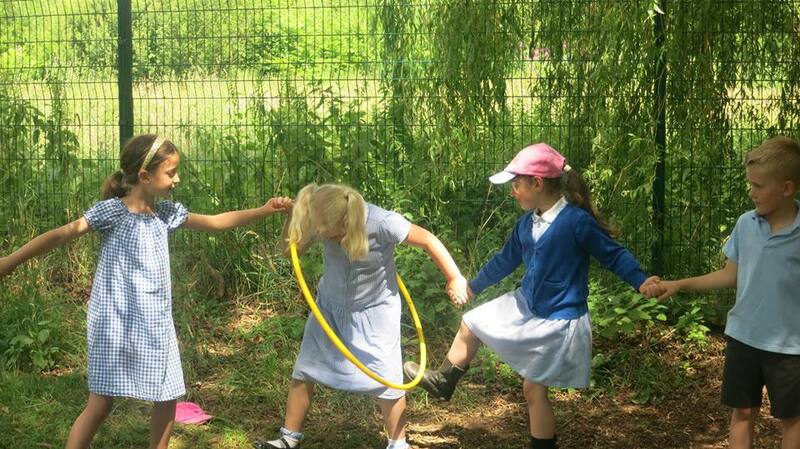 We practised the words: un pied, l’autre pied et la tête. 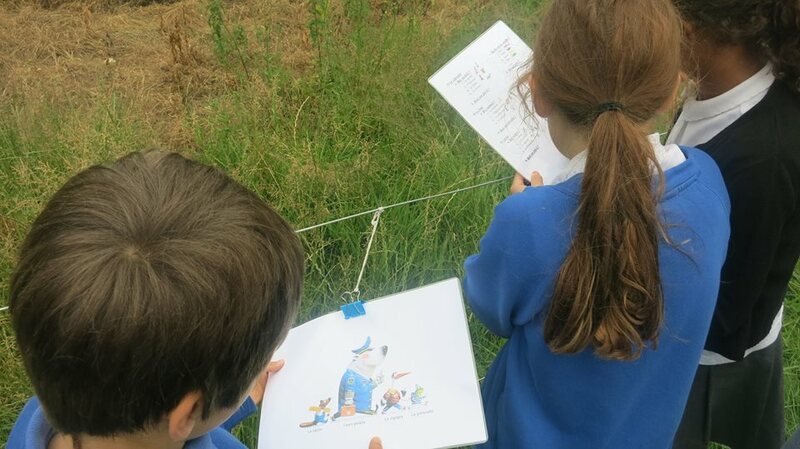 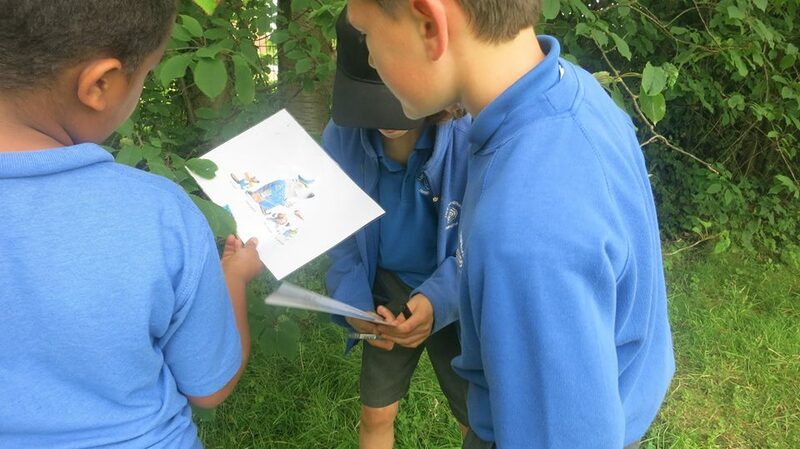 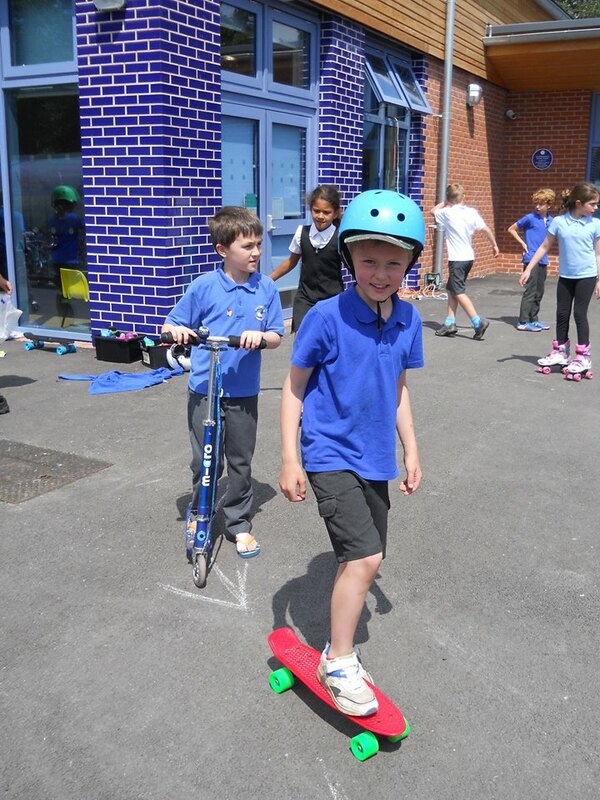 Years 3 and 4 went on a trail to match the vehicles and their animal drivers. 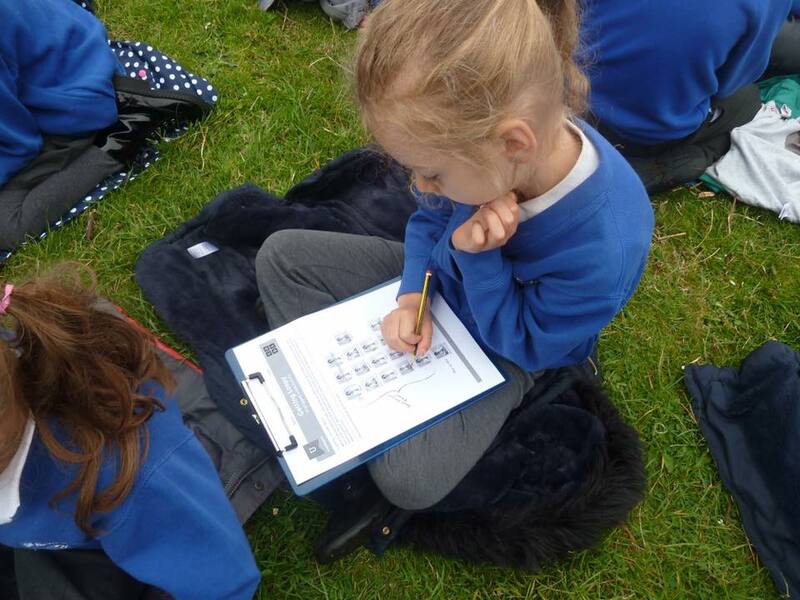 They also had to identify the colours of the vehicles in French. 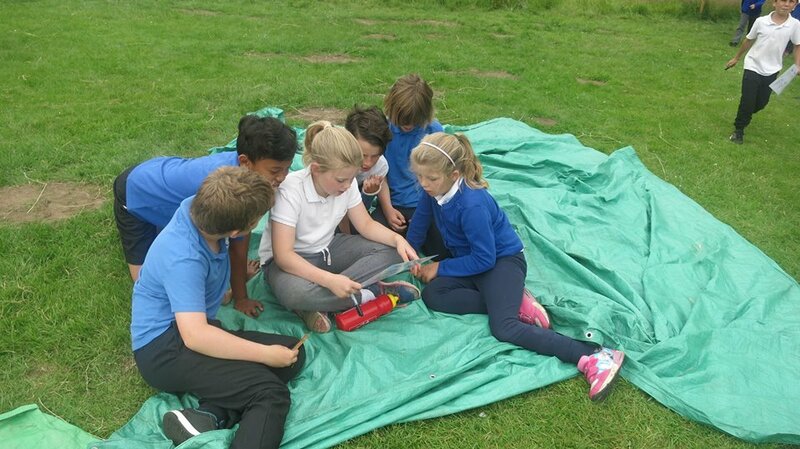 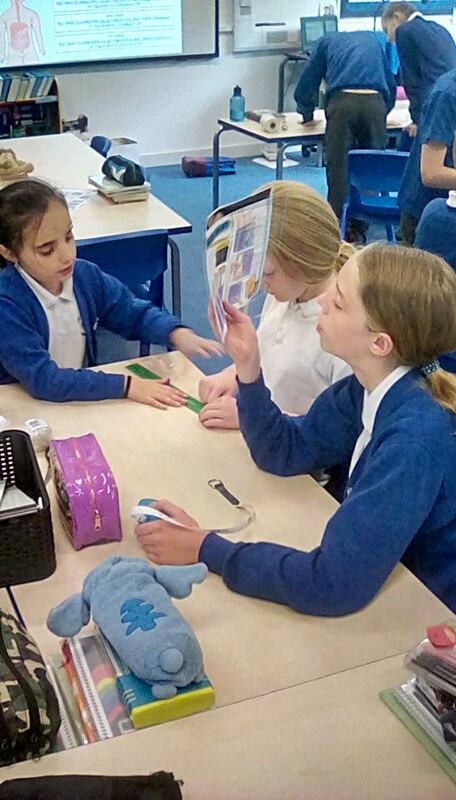 Year 6 had to work in teams to identify vehicles in French, as well as their colour. 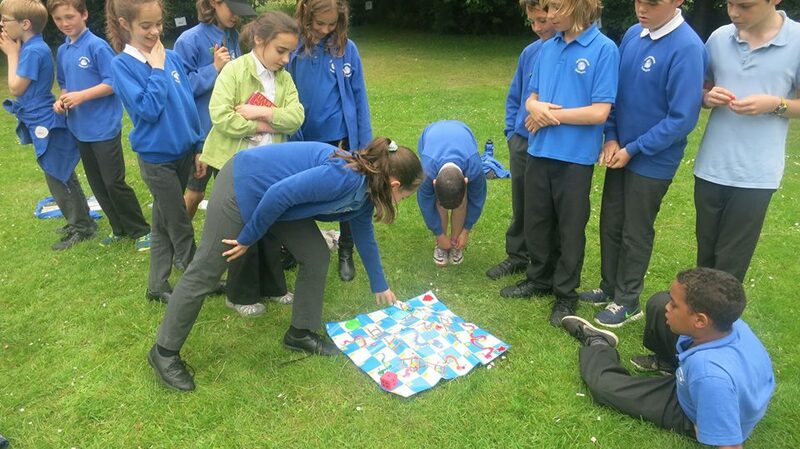 Finally they practiced their numbers in French with a game of Snakes and Ladders. 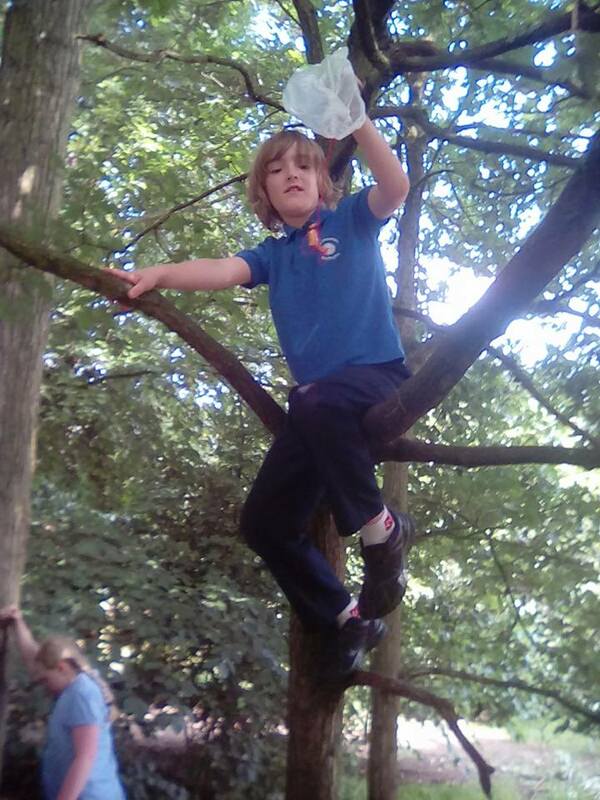 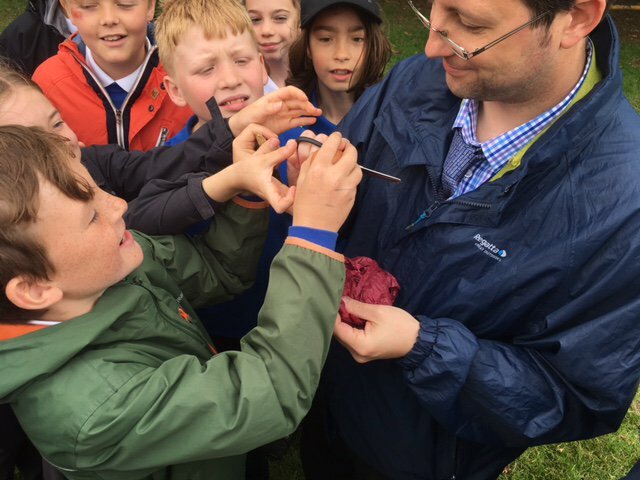 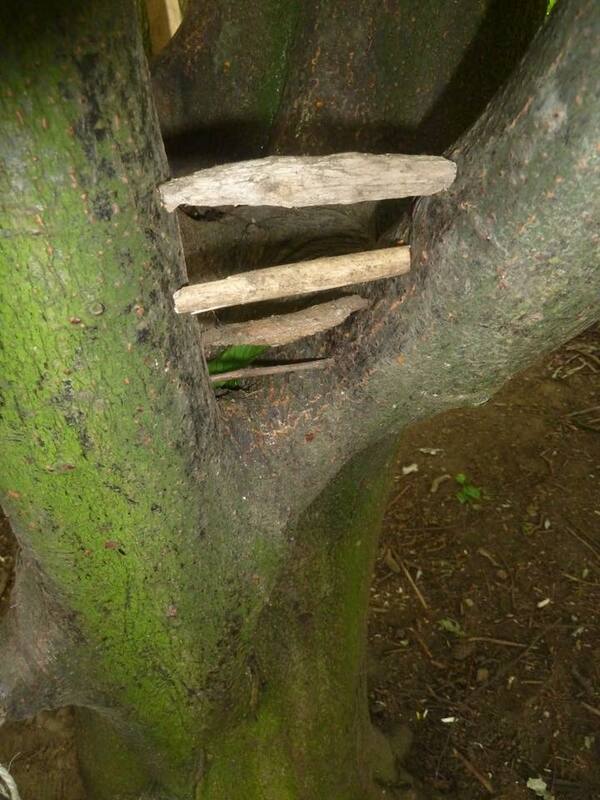 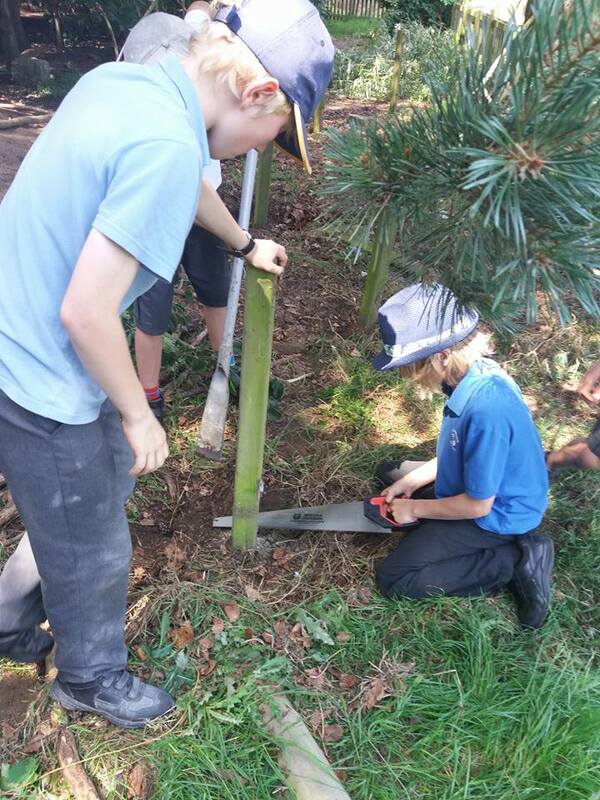 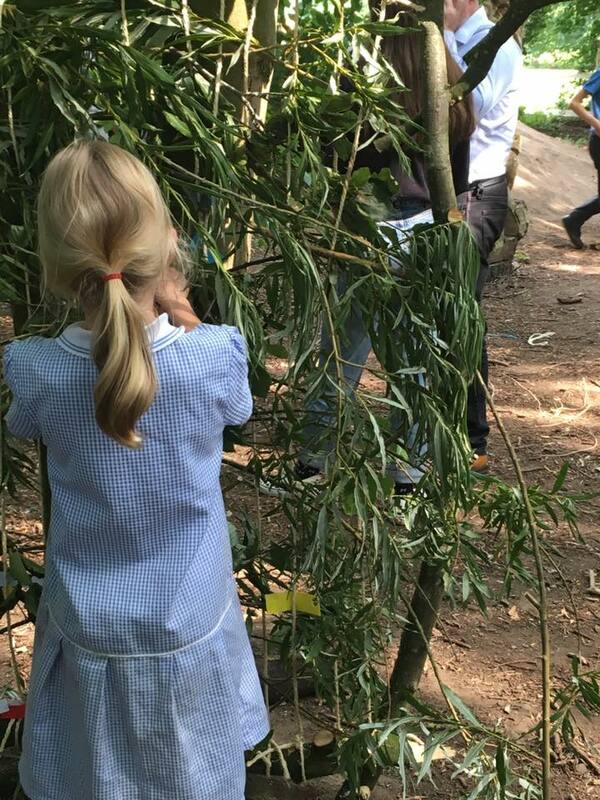 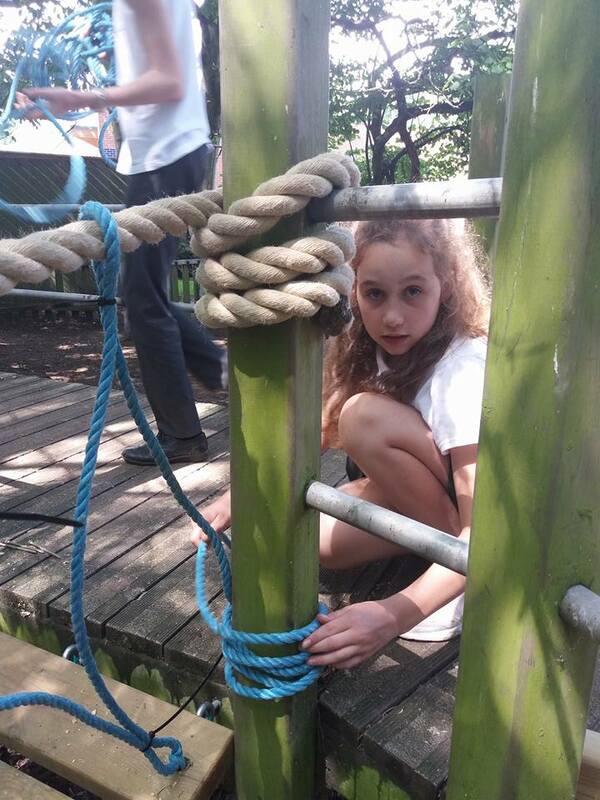 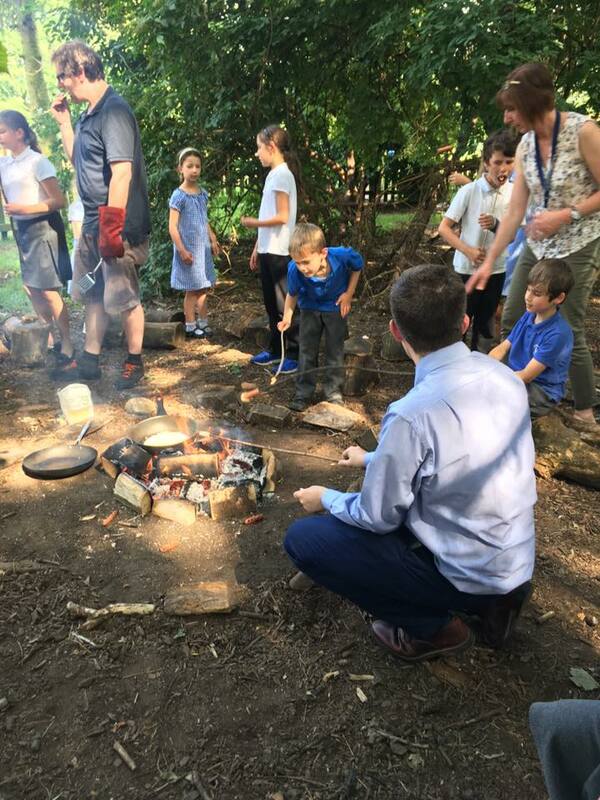 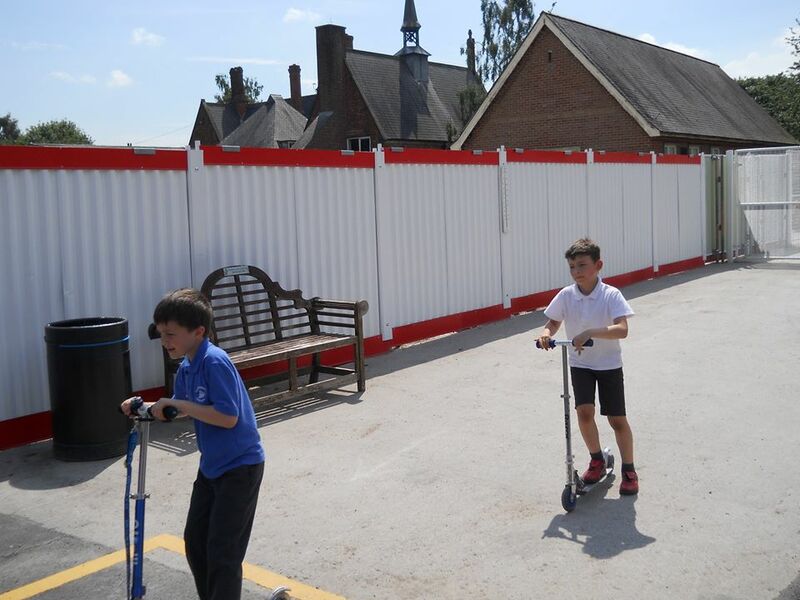 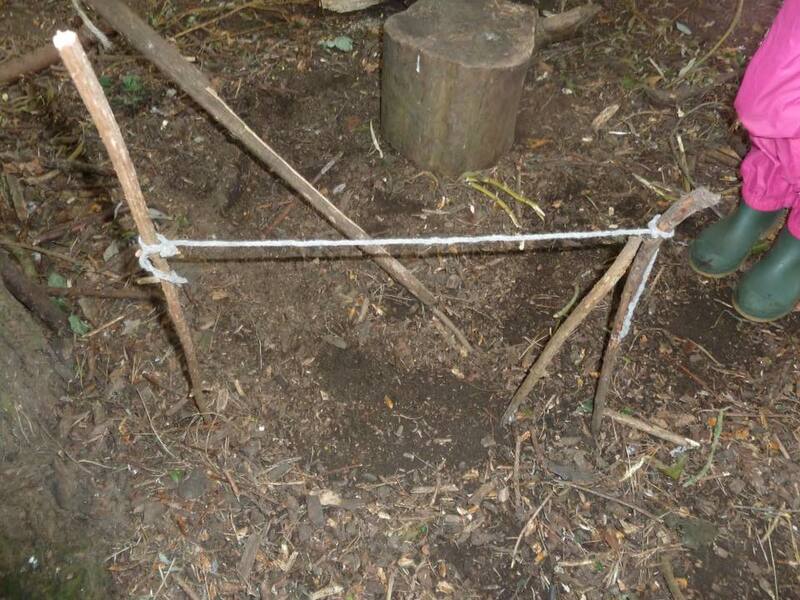 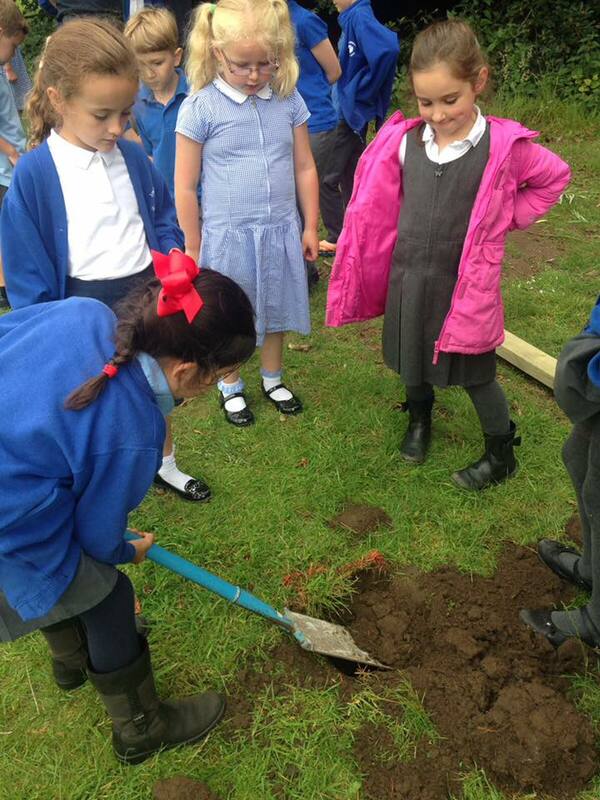 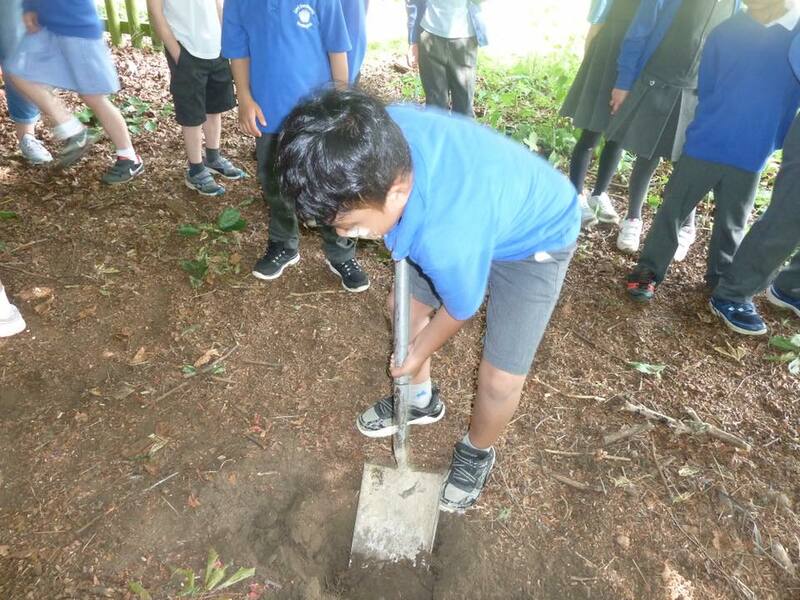 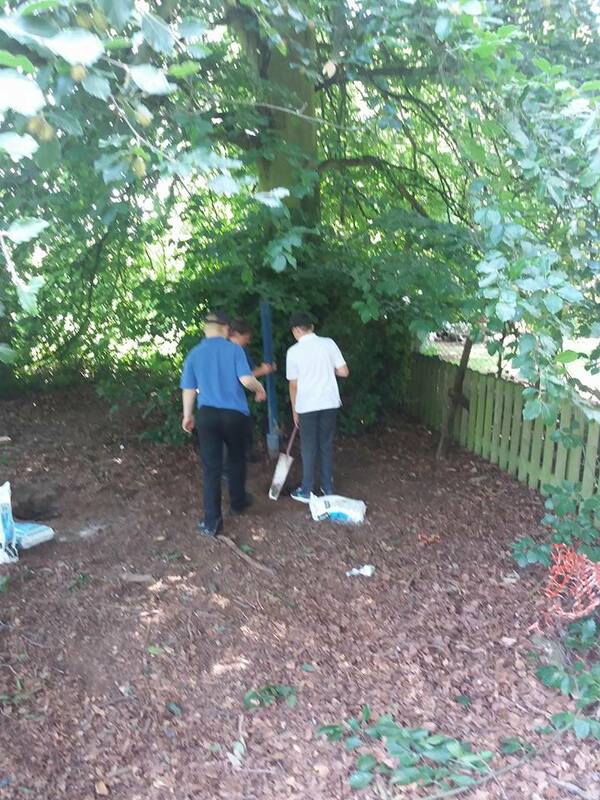 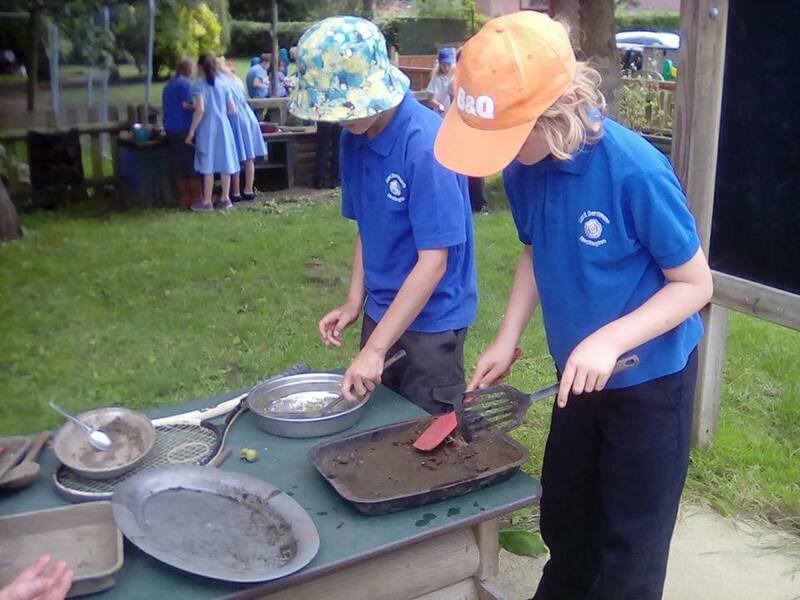 During Outdoor Learning Week each year we work on a project with Mr Danby, a parent & Governor in school. 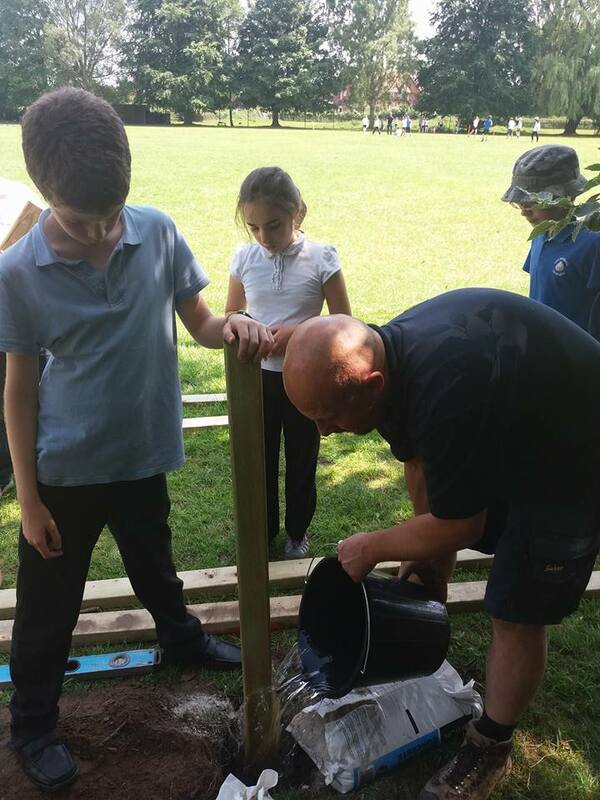 This year we planned to build a bridge as well as extend the Forest area by erecting new fencing. 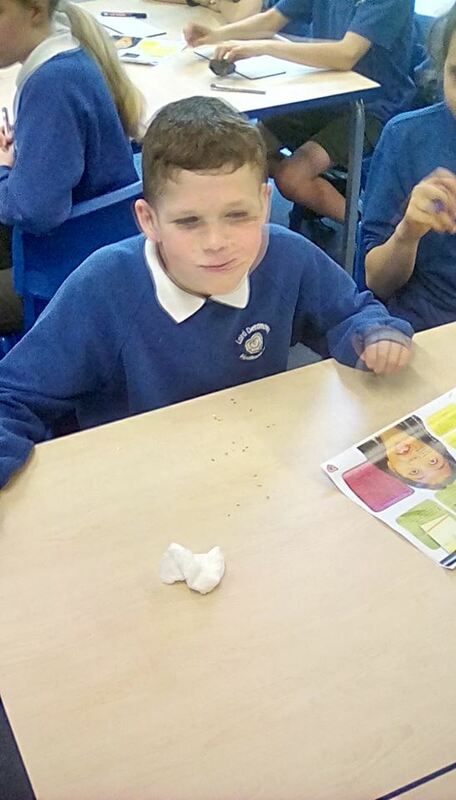 Each class in school had a session helping Mr Danby. 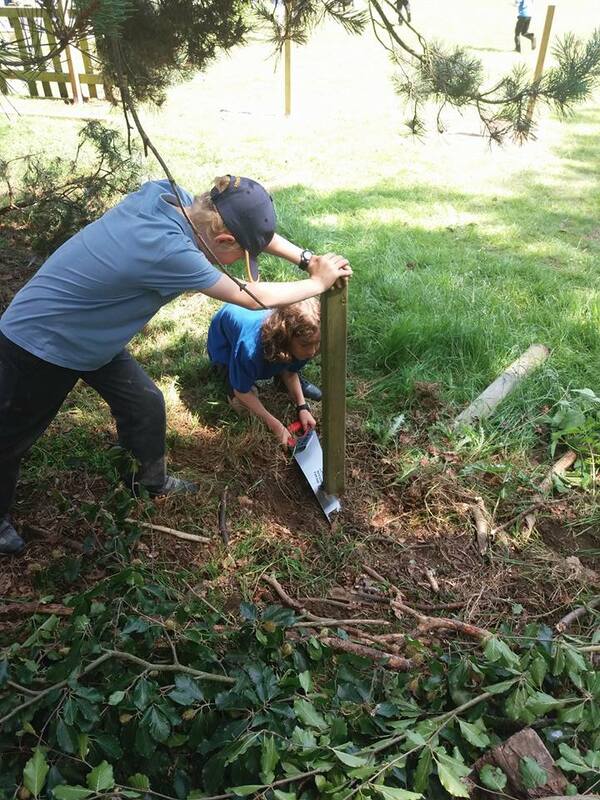 We unloaded supplies, dug holes, removed old fencing and worked on the ropes for the new bridge. 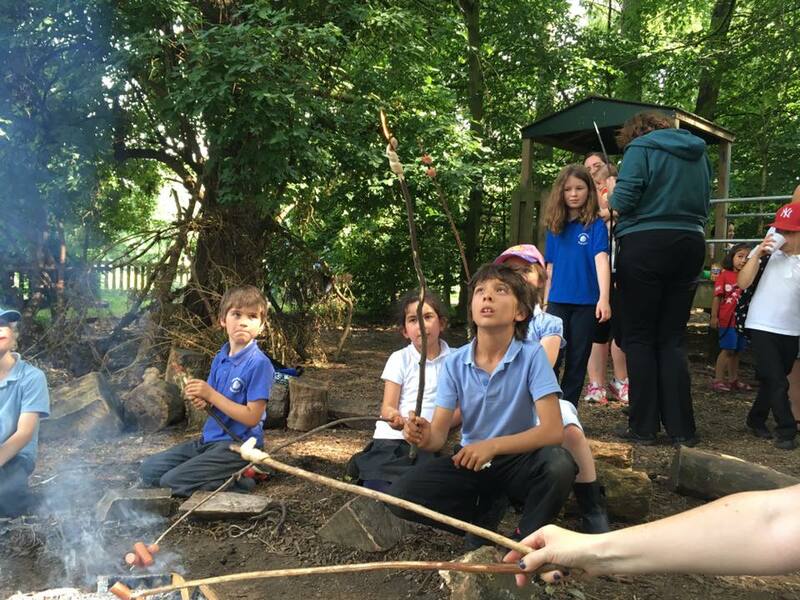 Ms Jagoe and the PTA organised a cook out in the forest one night after school. 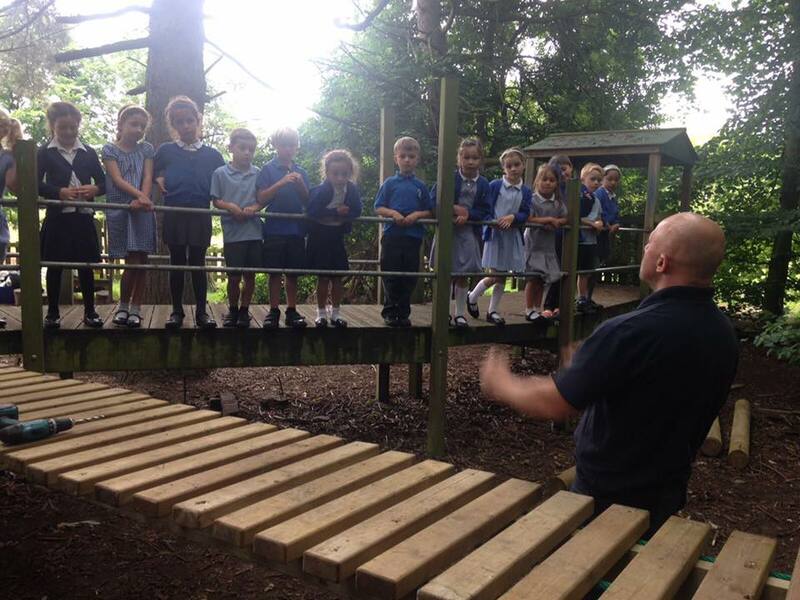 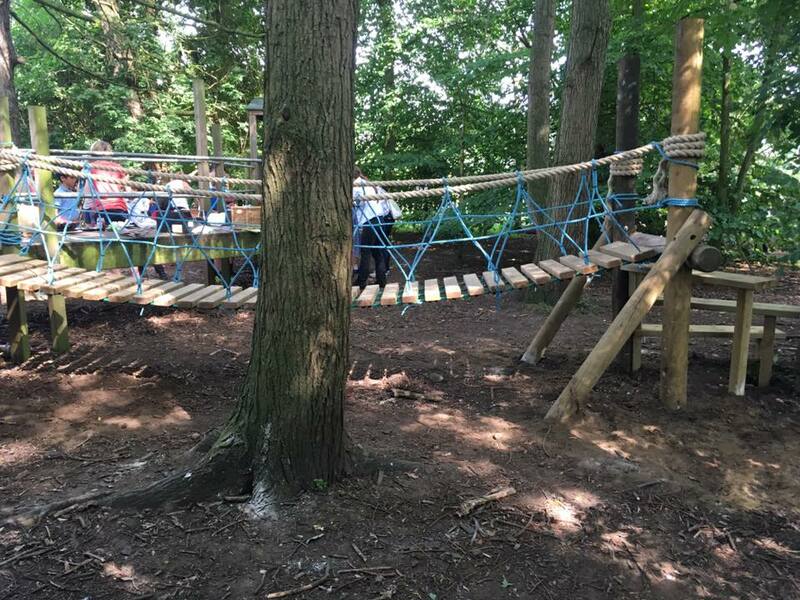 It was a great chance for parents to join us and to see our new Forest bridge. 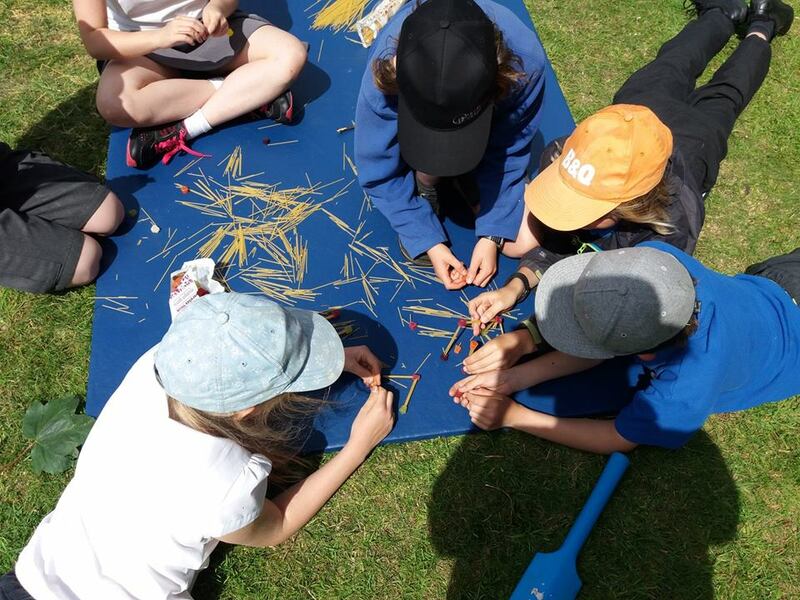 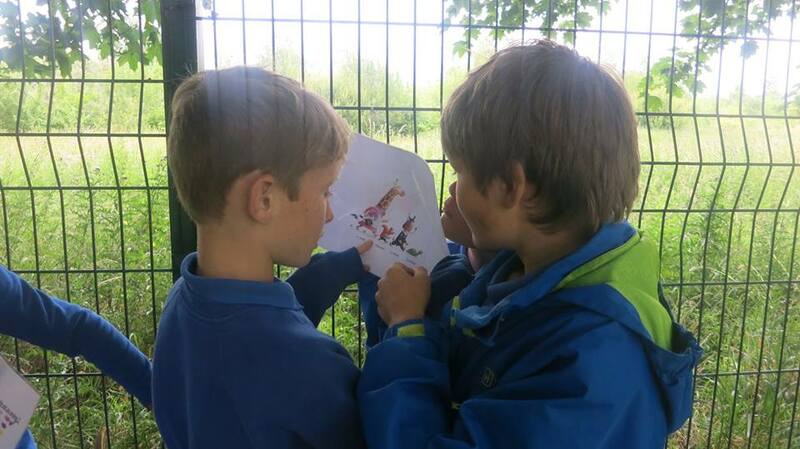 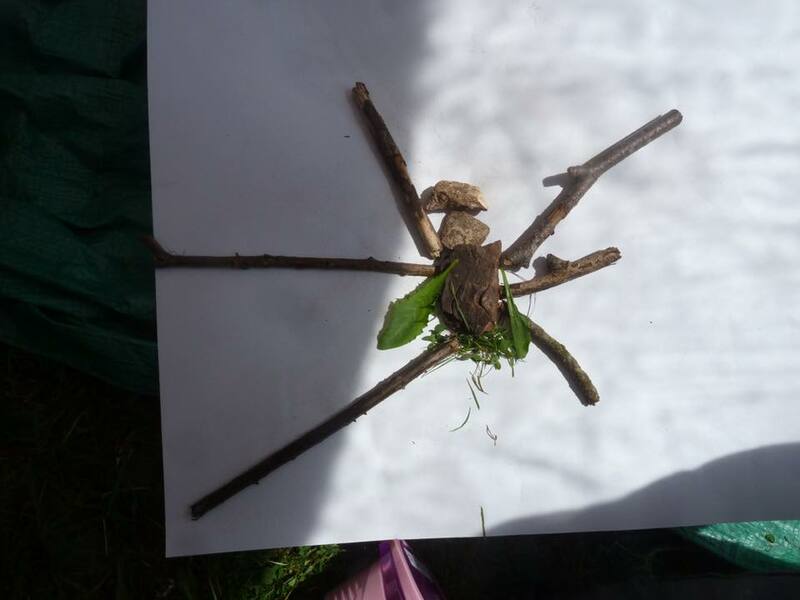 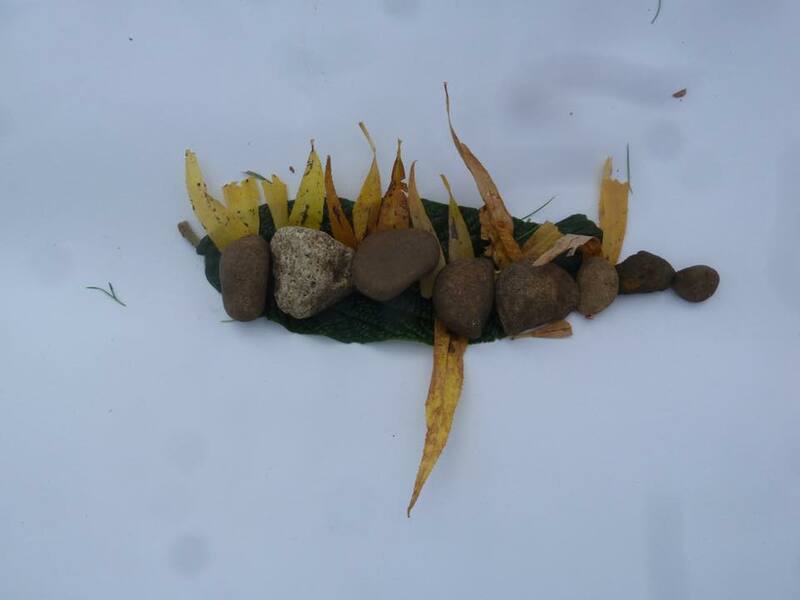 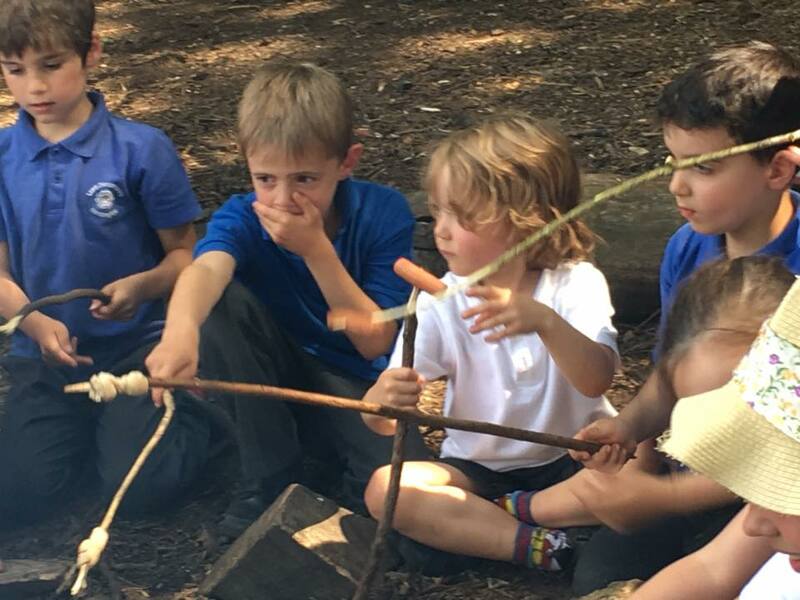 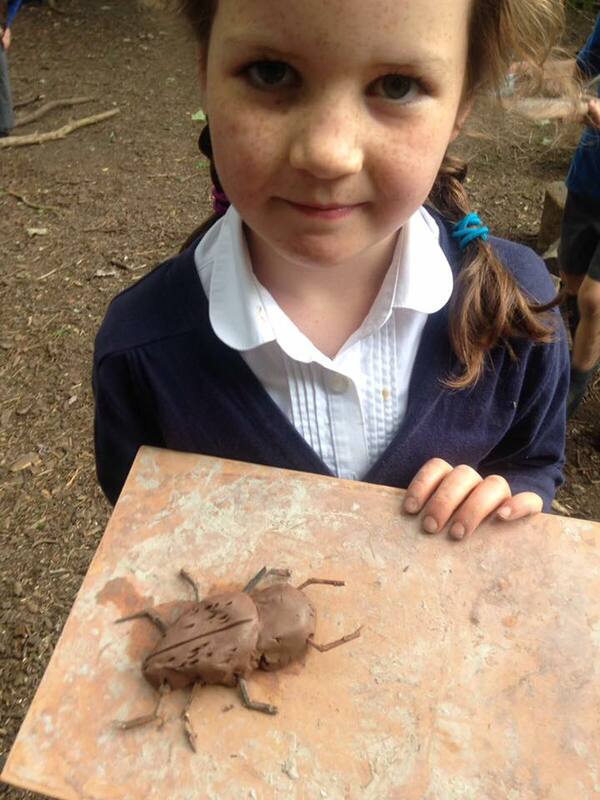 Following the theme of ‘On the Move’, Years 1 and 2 worked together in pairs to make minibeasts with natural materials as well as minibeast play parks. 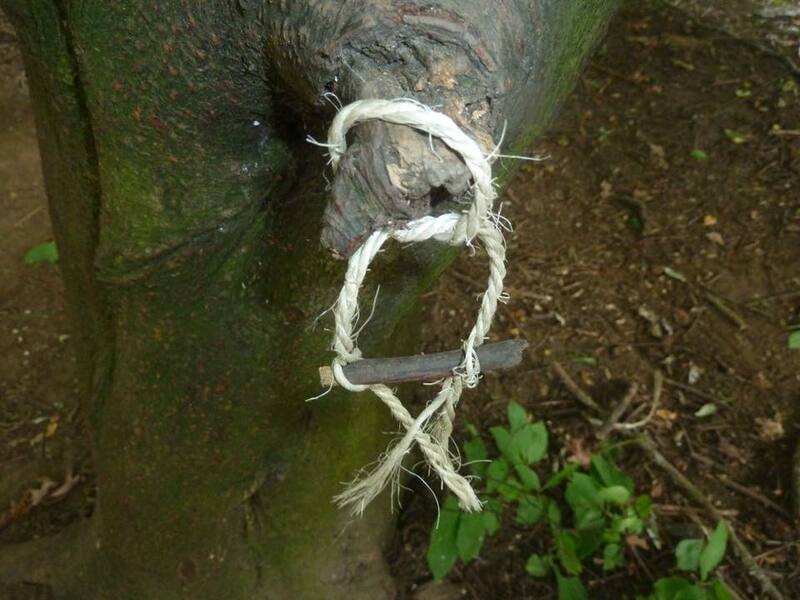 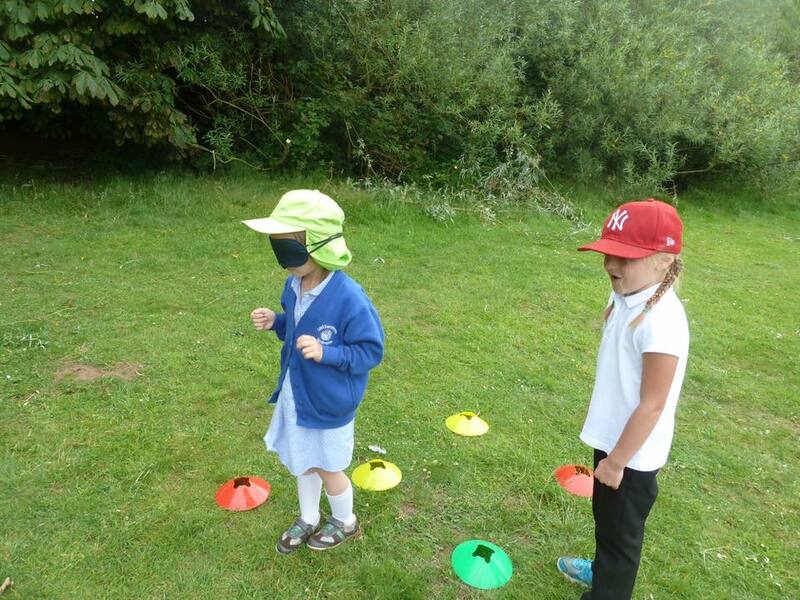 We’re sure the bugs in the forest are going to have a great time keeping fit! 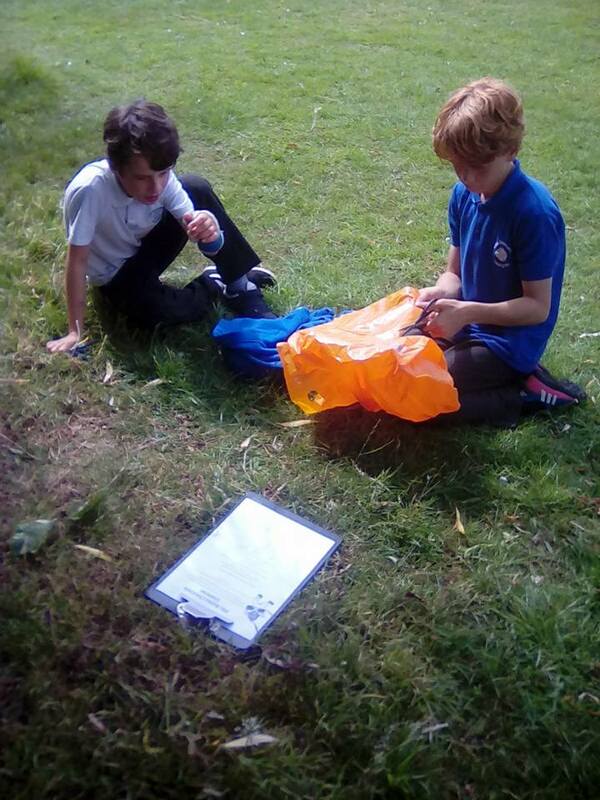 As it is outdoor week, everything is done outside, including computing! 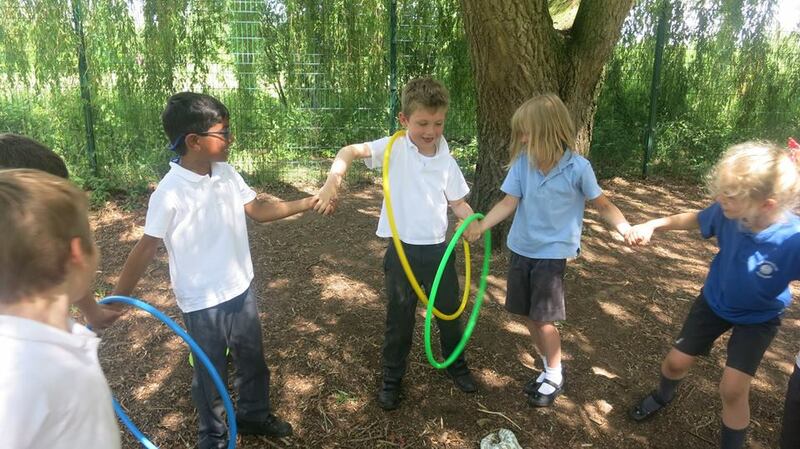 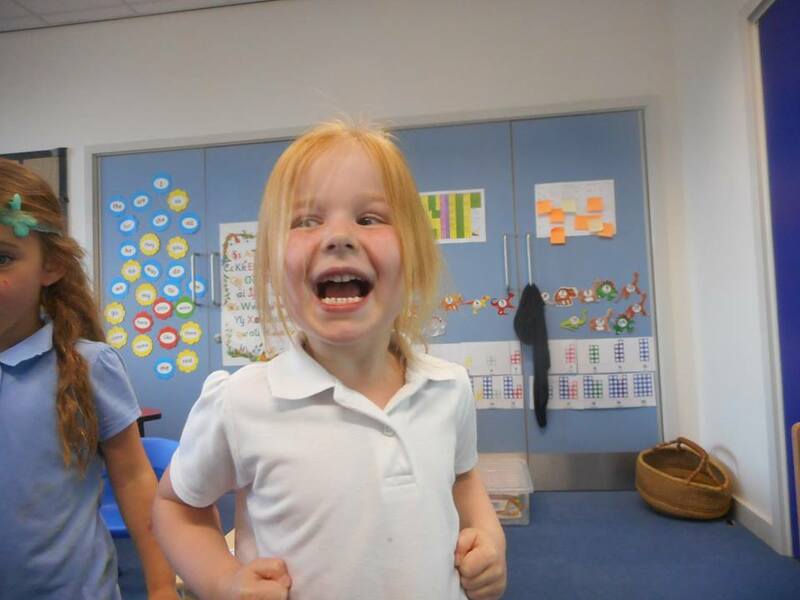 Year 1 did active sequencing before writing their own code. 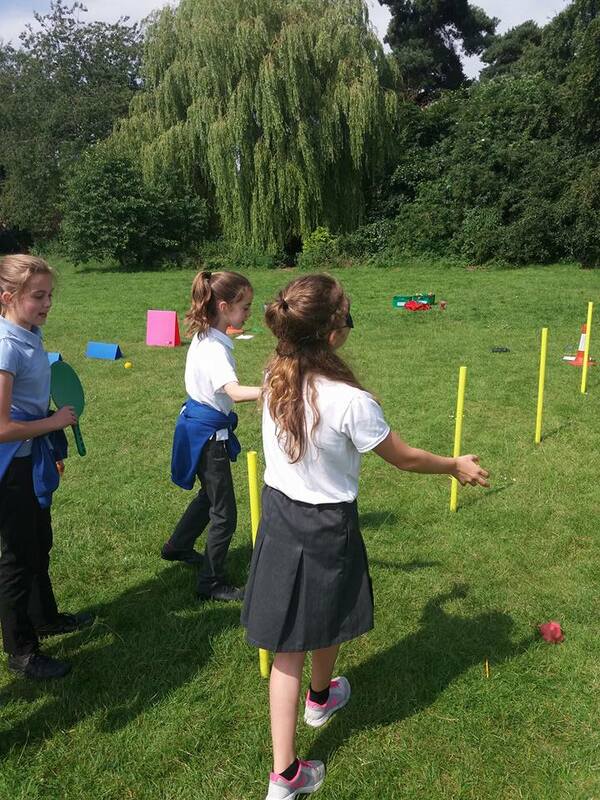 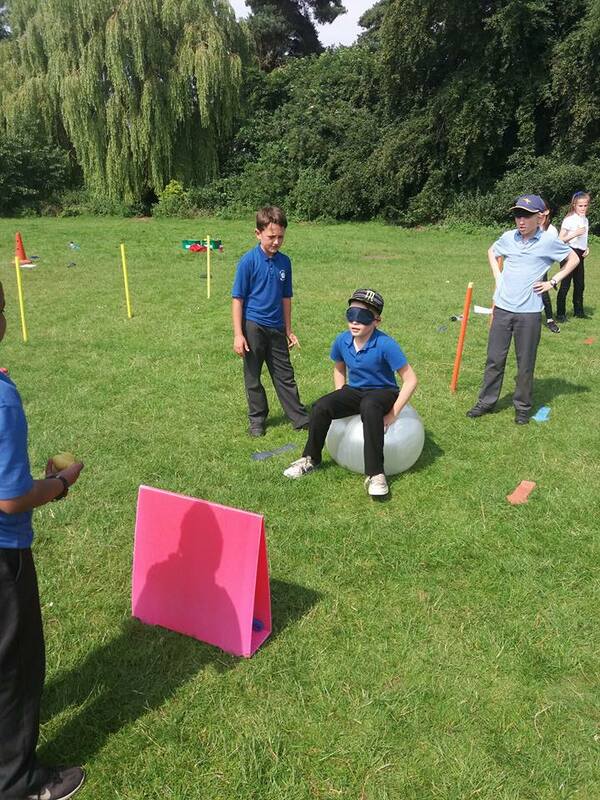 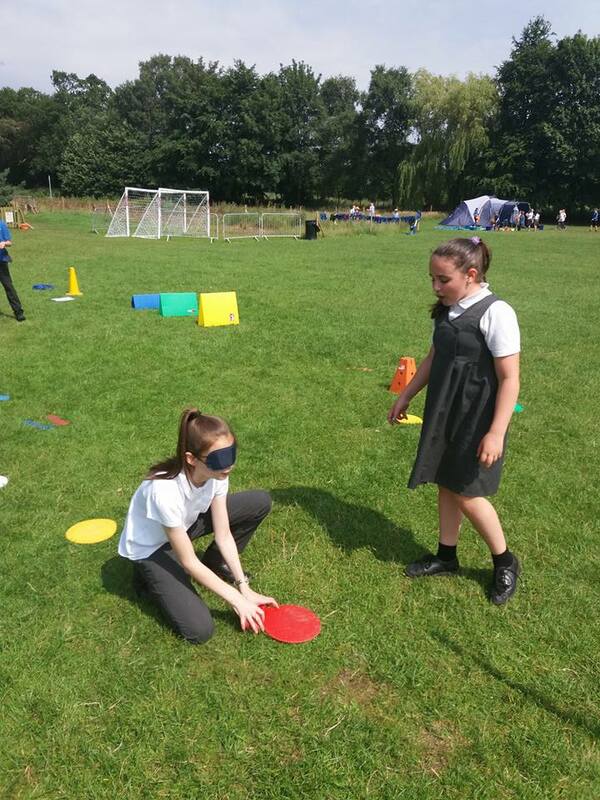 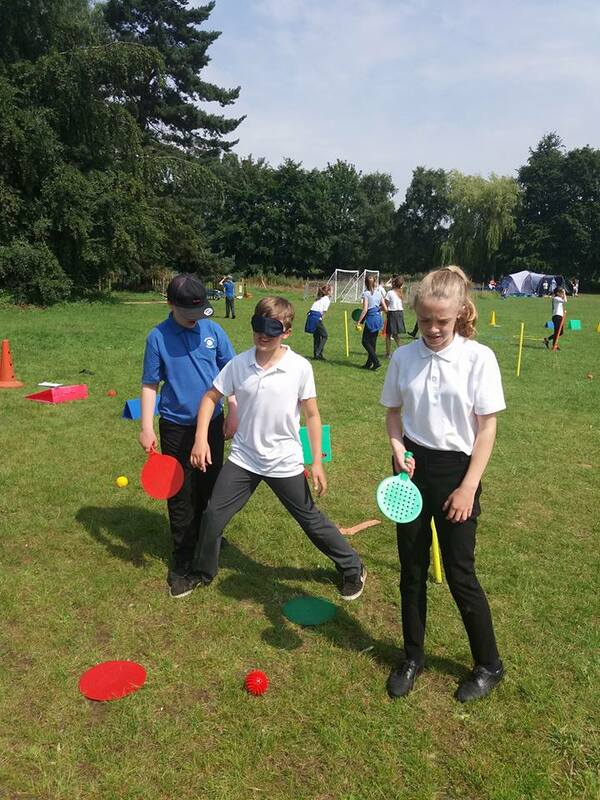 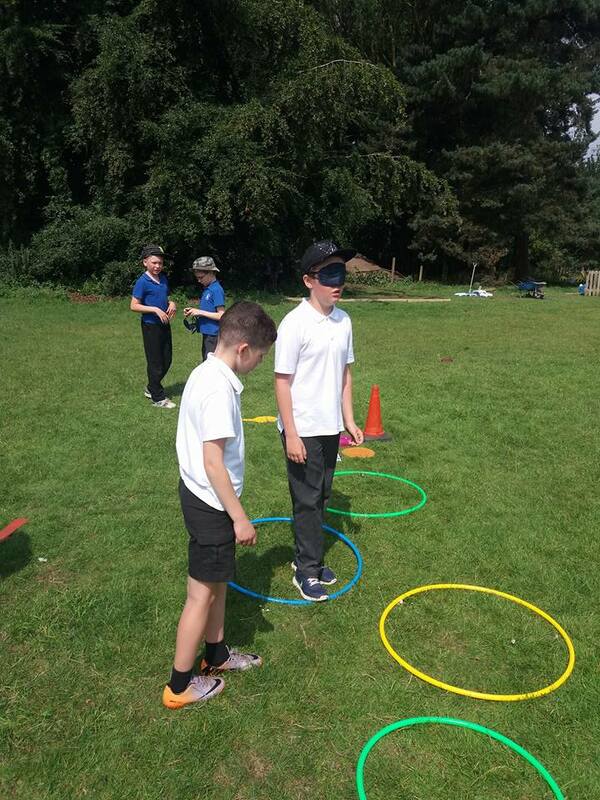 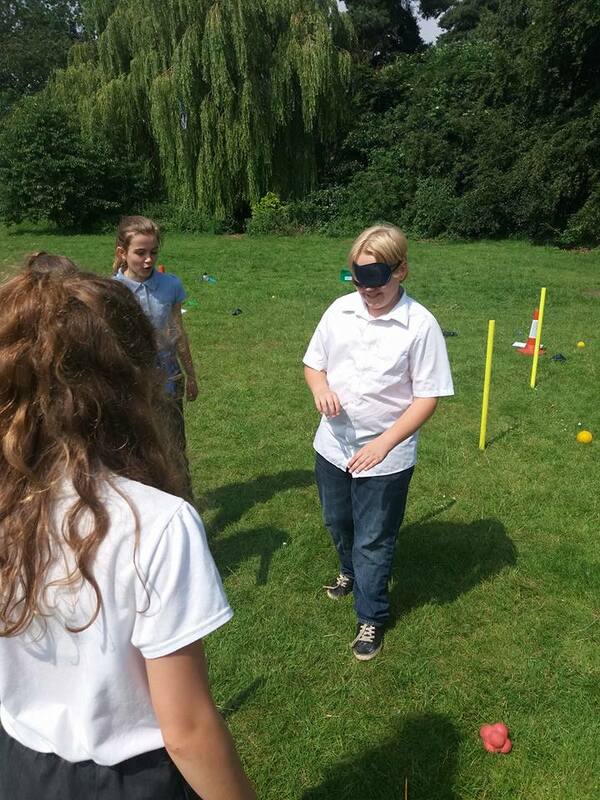 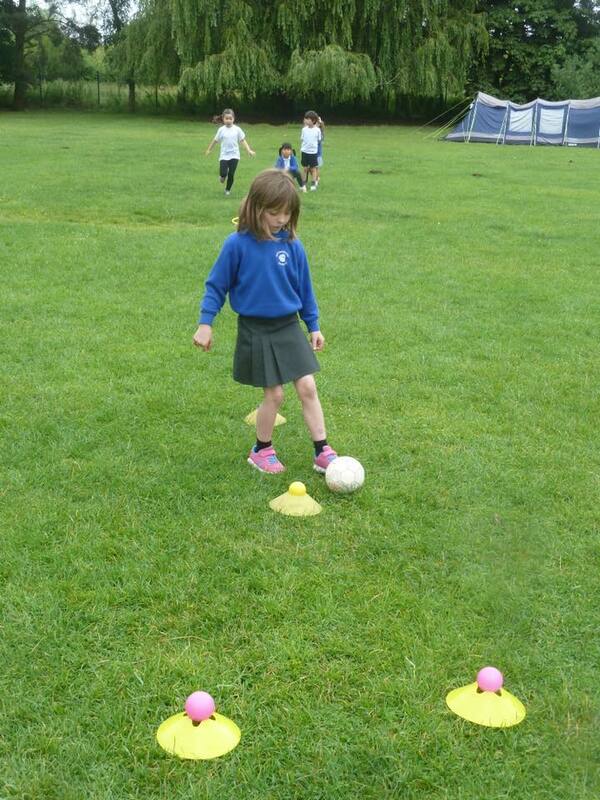 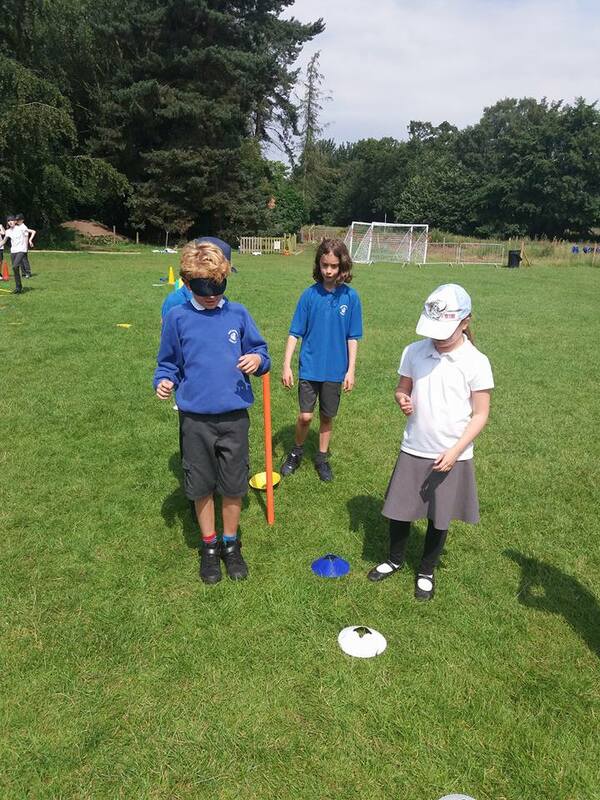 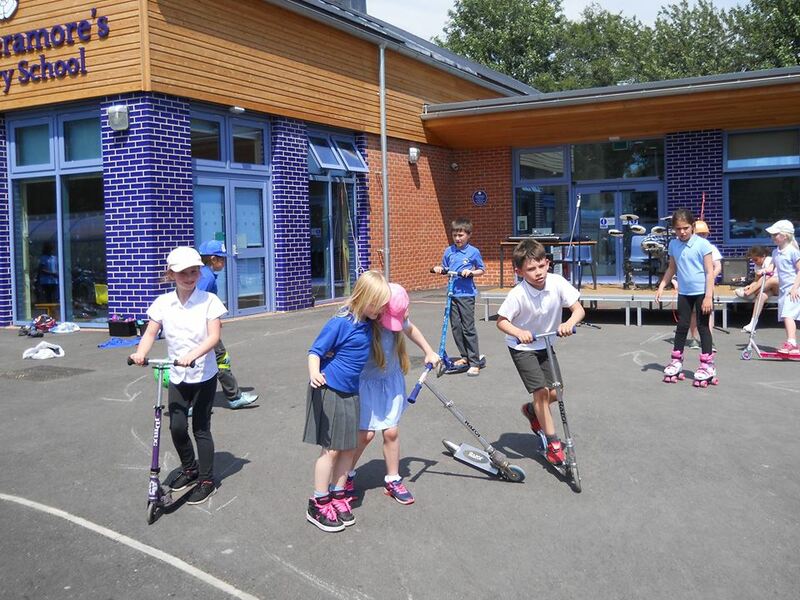 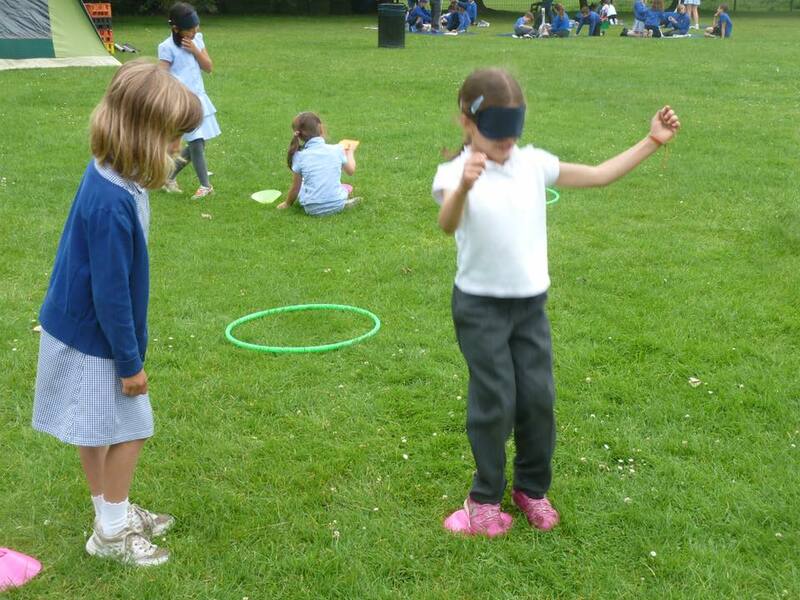 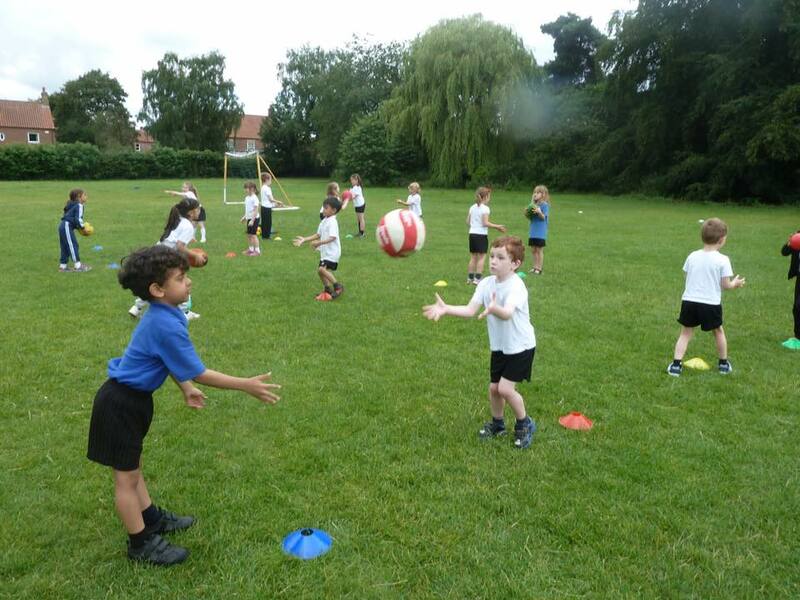 They also enjoyed their Multi-sports session as well as a blindfolded Obstacle Course. 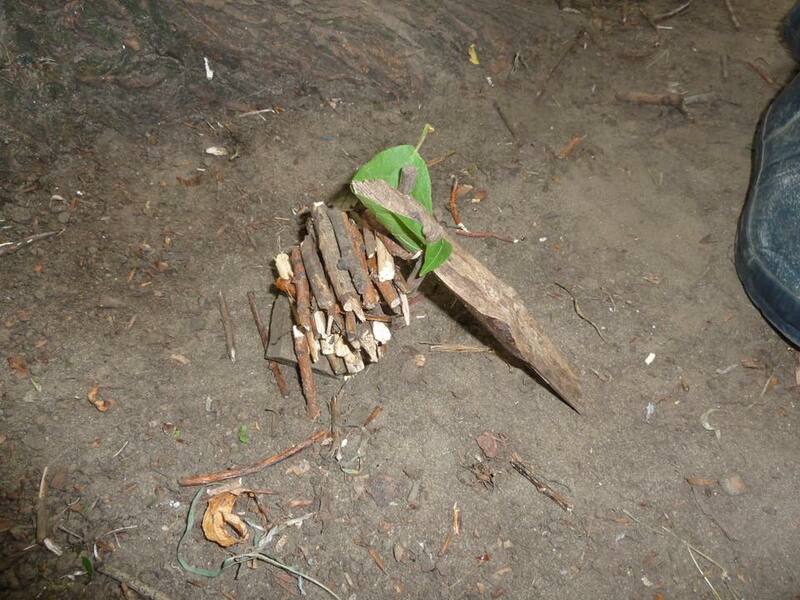 They timed how long they took to land when launched from trees in the forest. 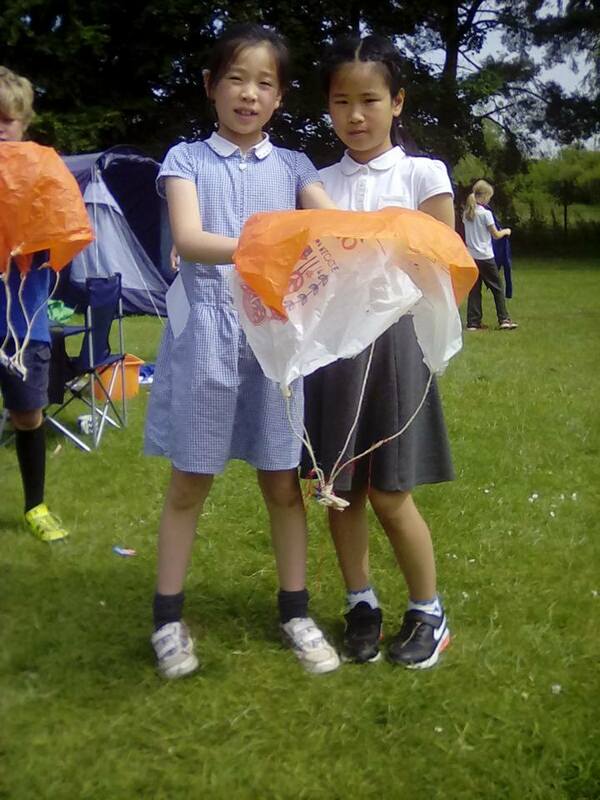 The most successful ones took over one and a half seconds to land! 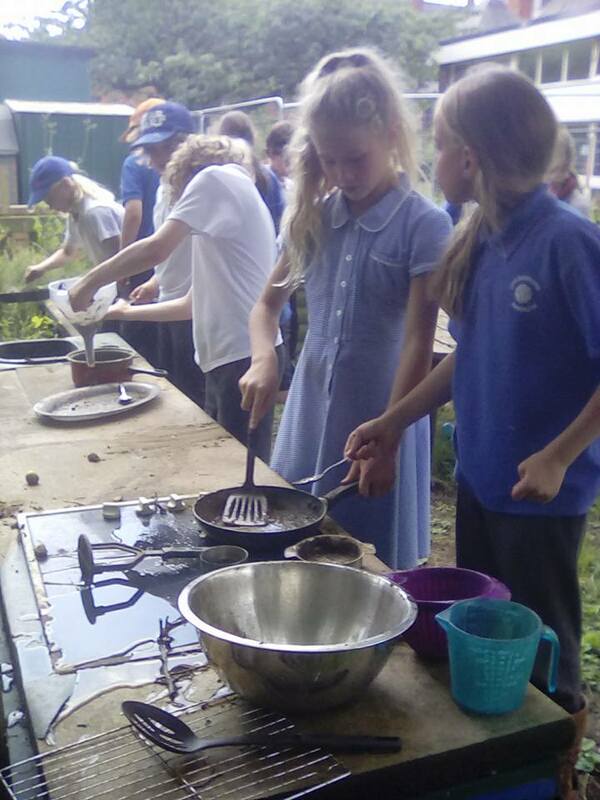 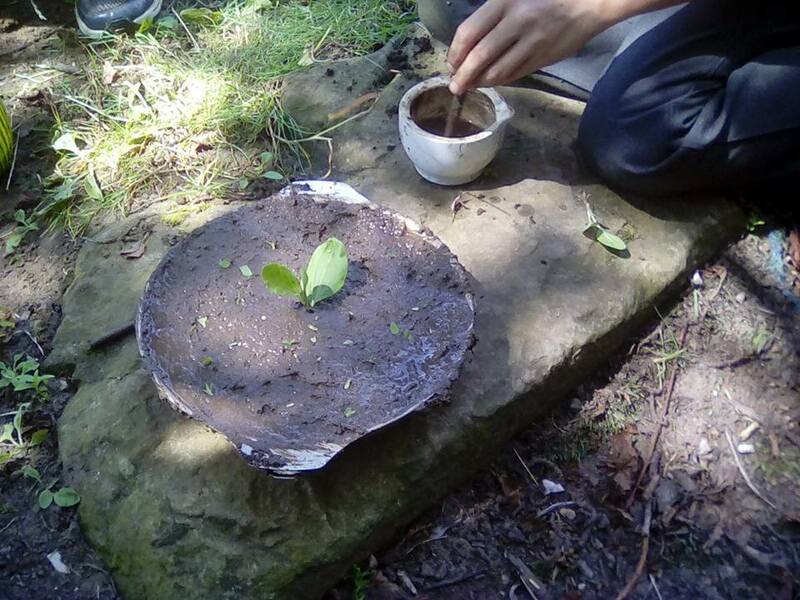 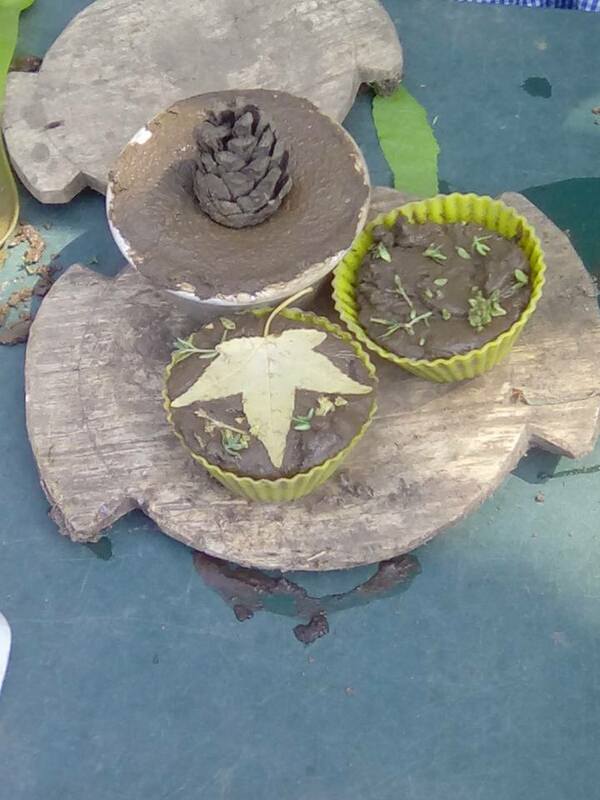 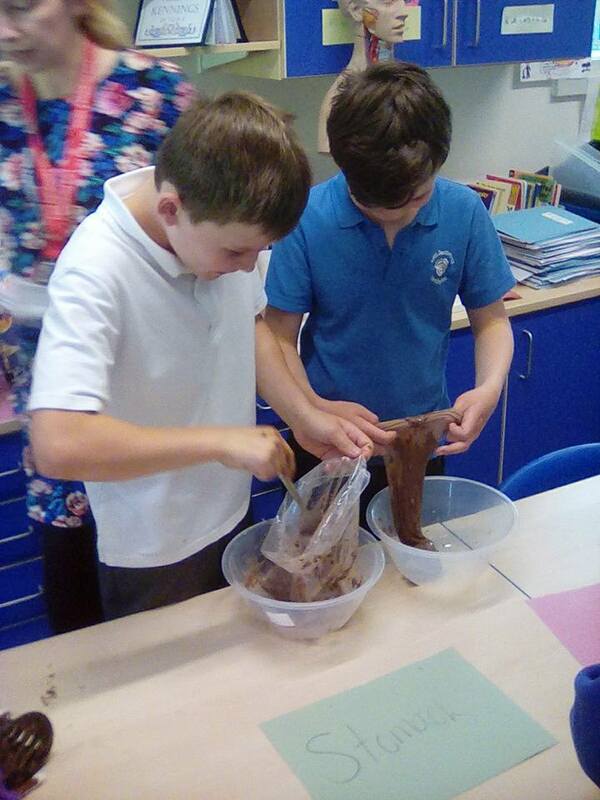 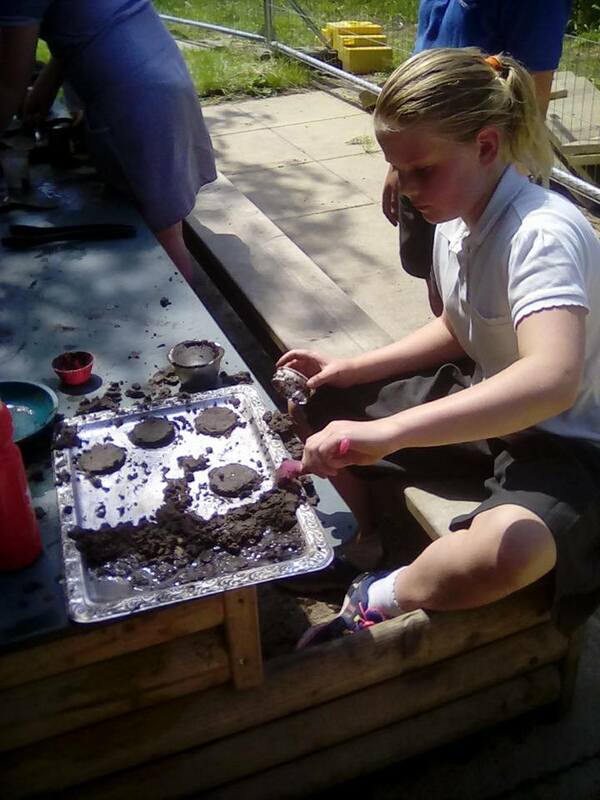 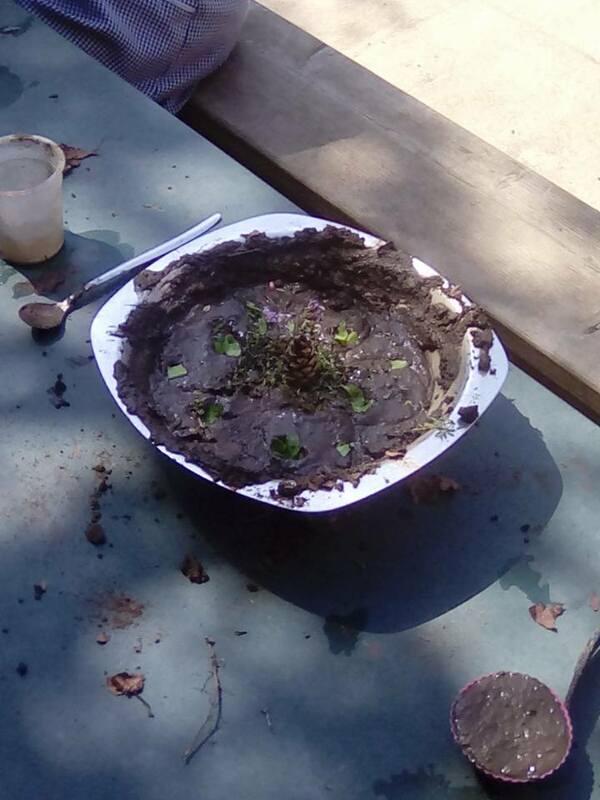 Year 4 had a great time in the Mud Kitchen making ‘chocolate’ creations inspired by their topic this term. 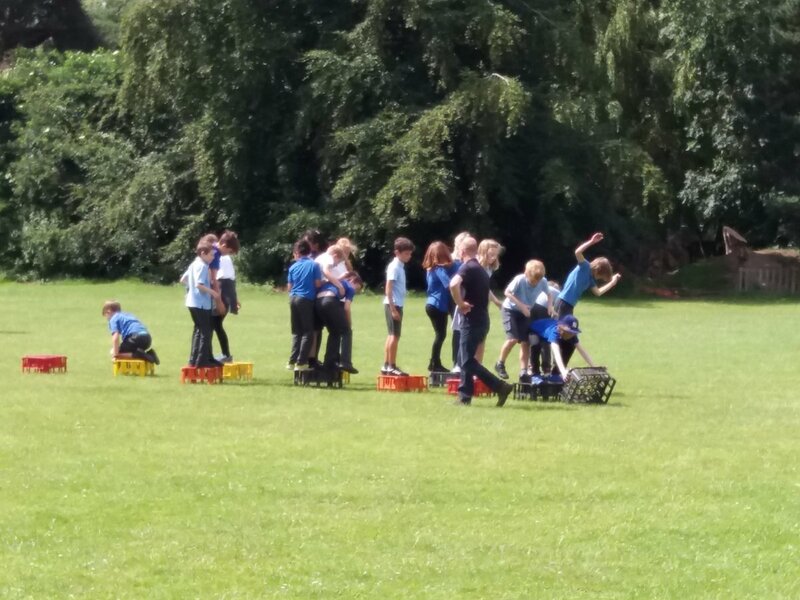 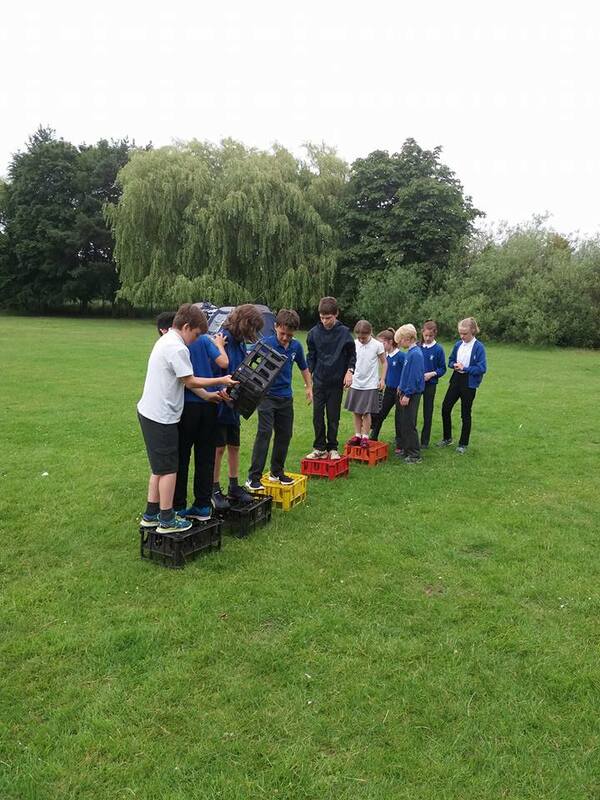 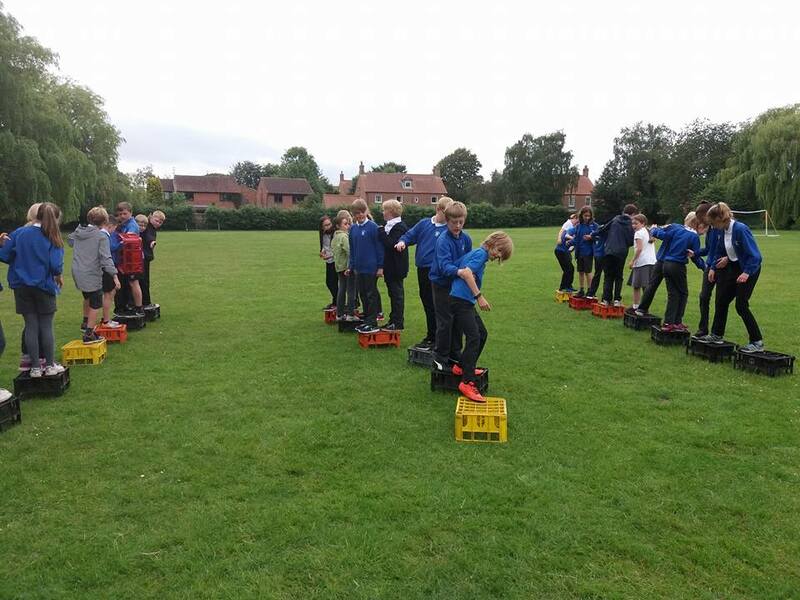 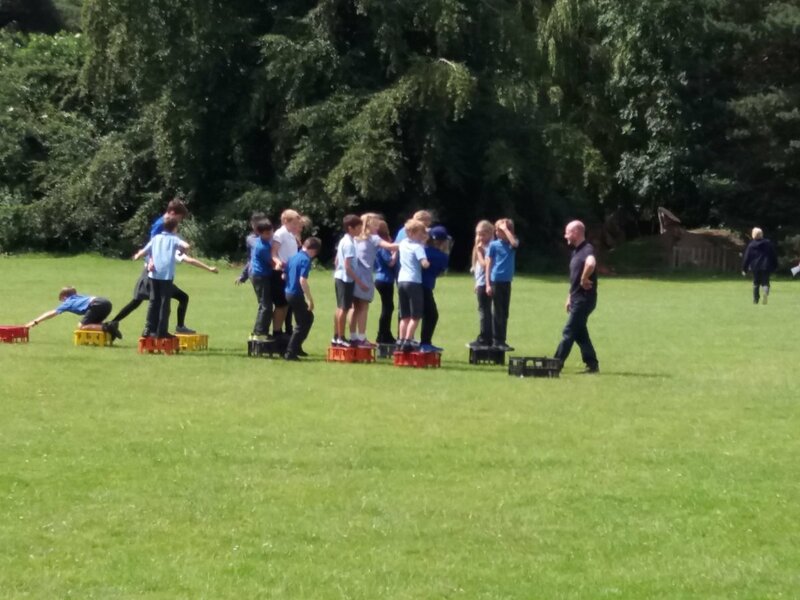 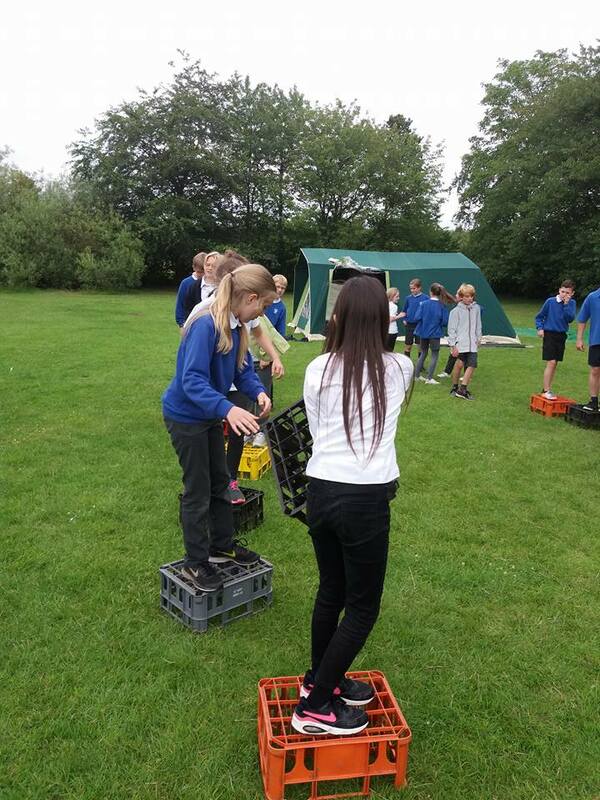 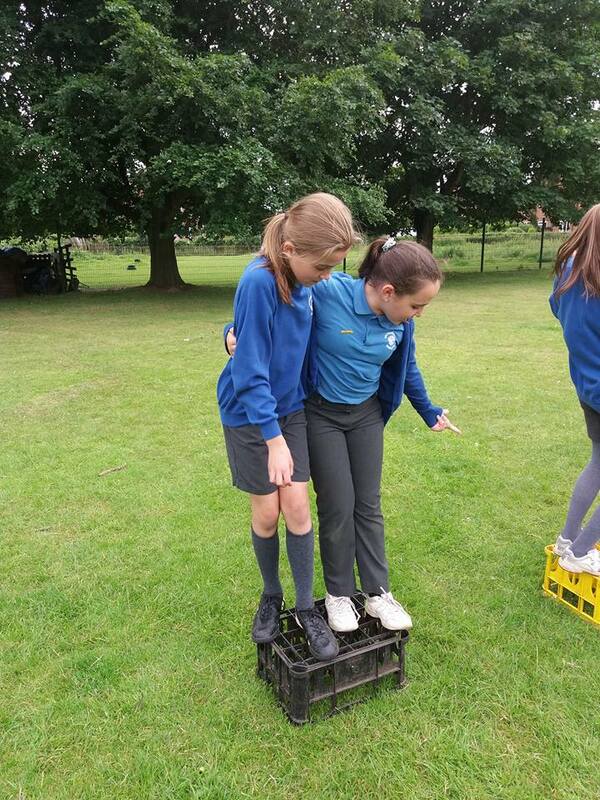 Years 5 & 6 showed great teamwork in the crate challenge. 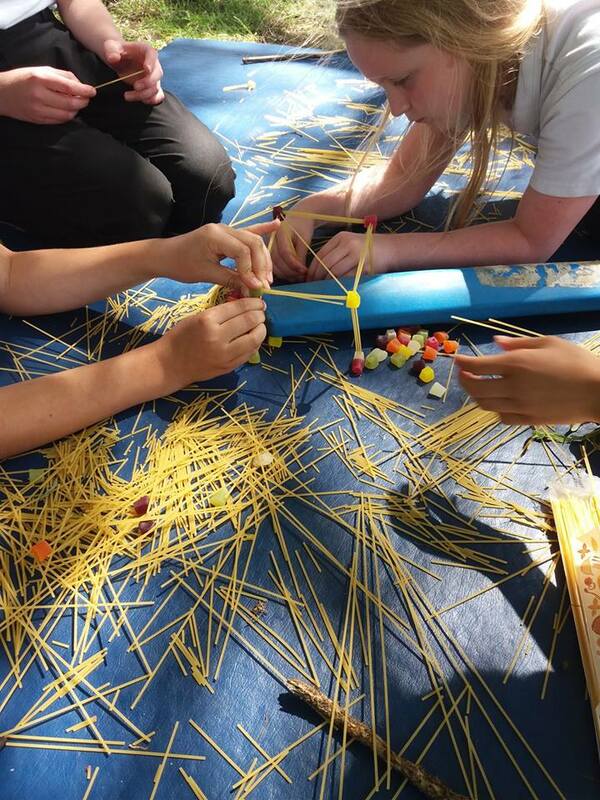 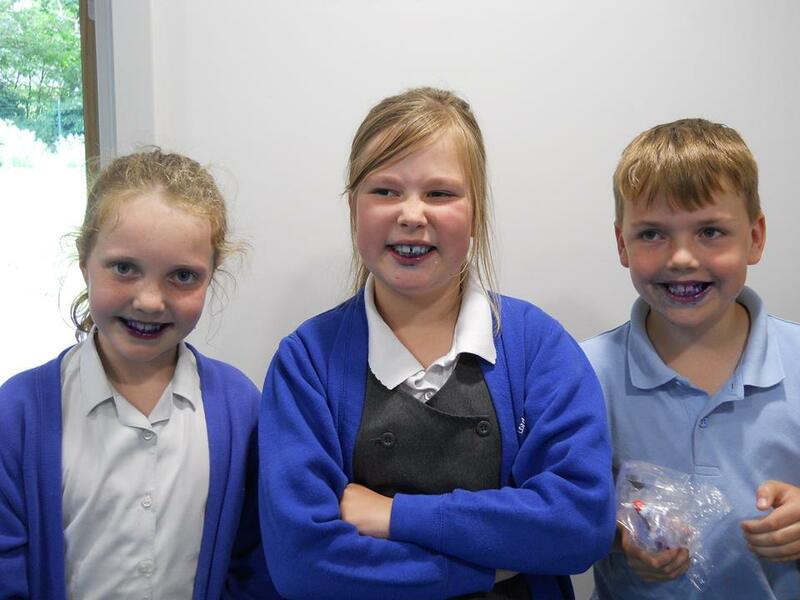 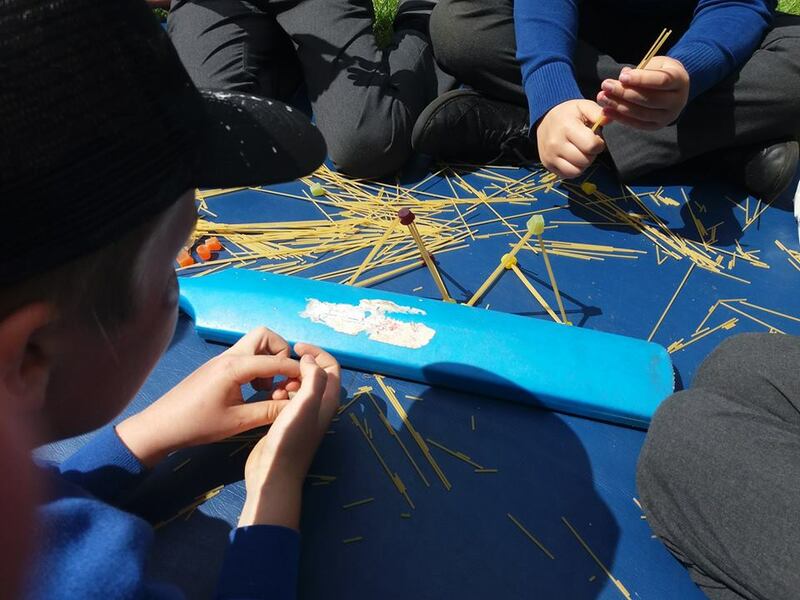 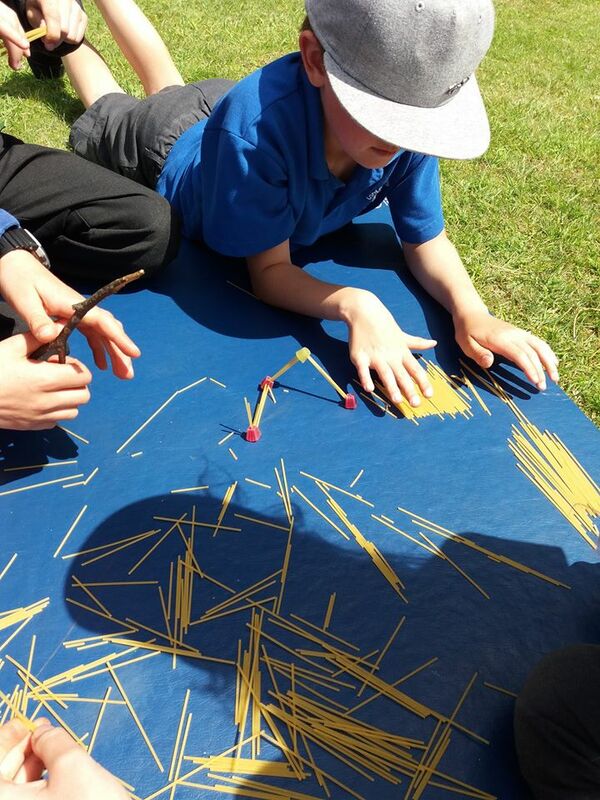 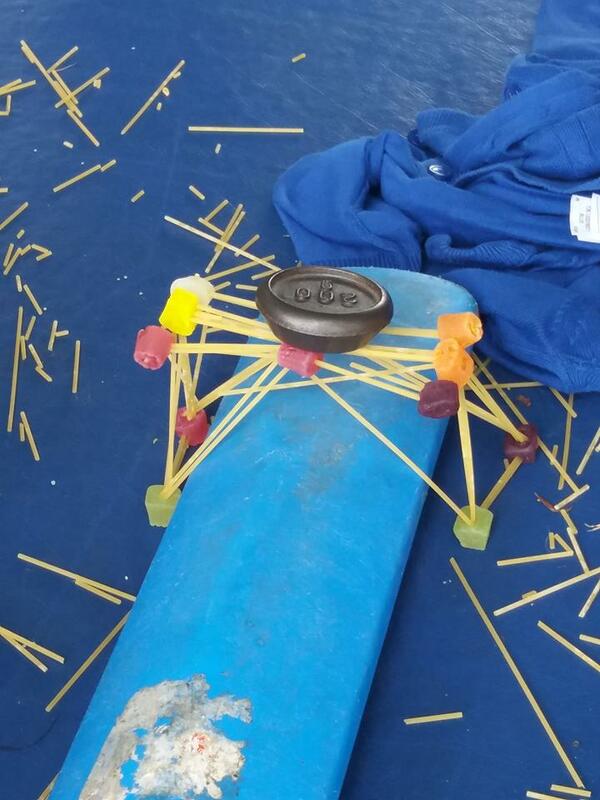 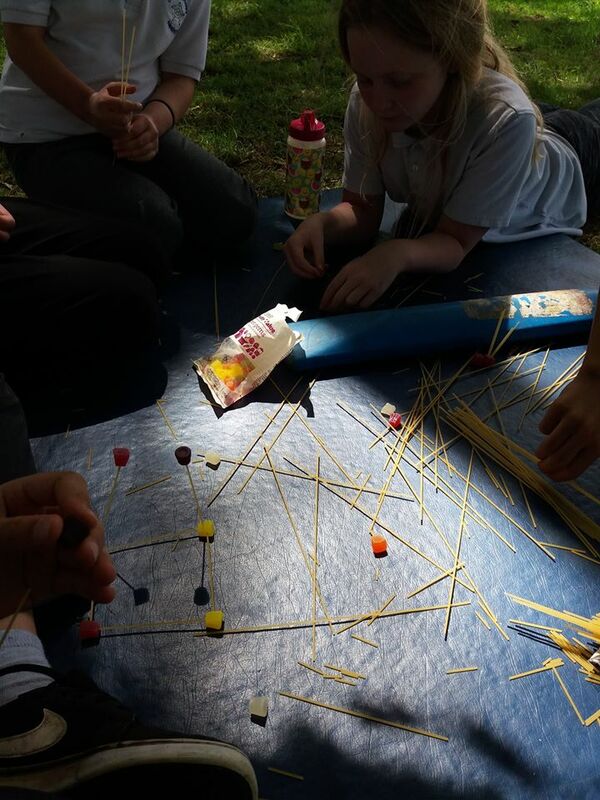 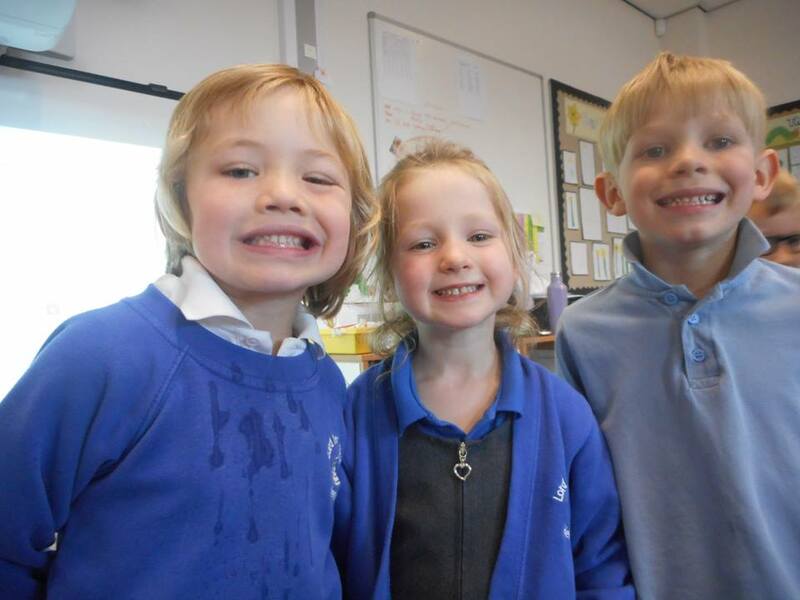 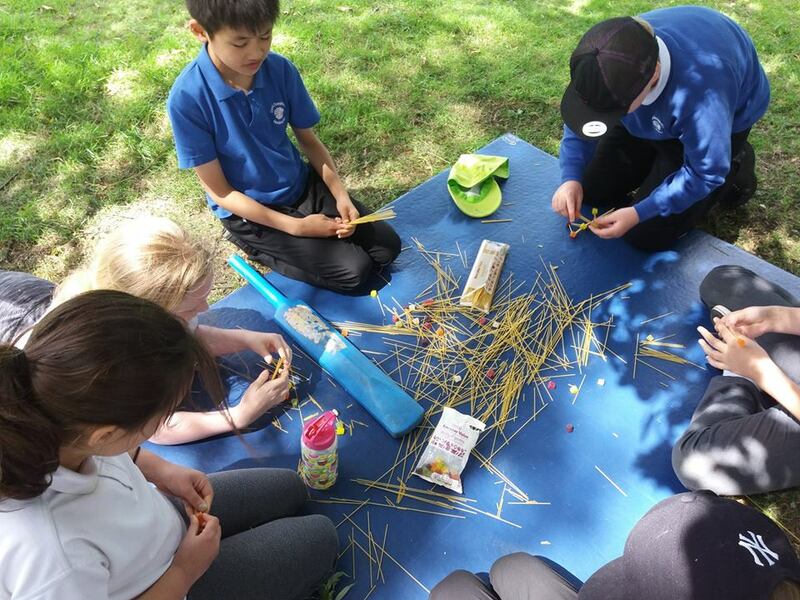 They were challenged further – to build bridges for the three Billy Goats Gruff using only spaghetti and wine gums. 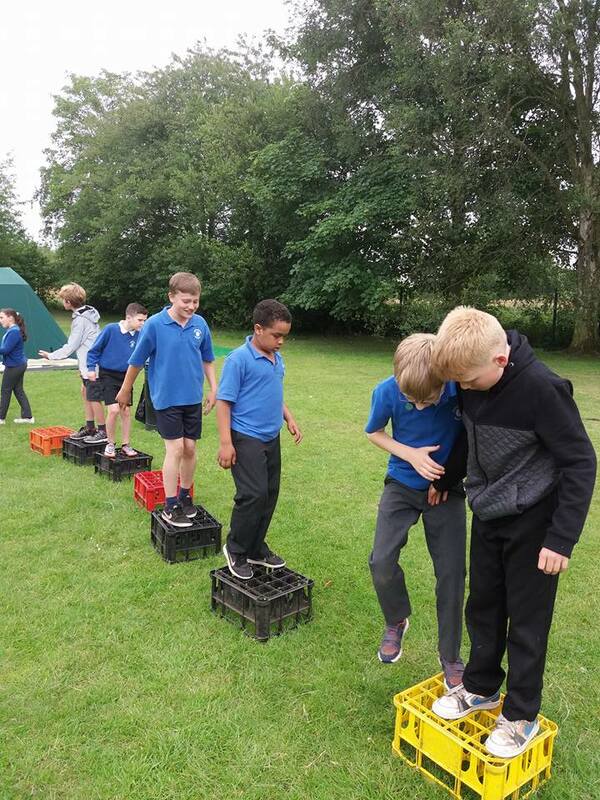 A tricky task! 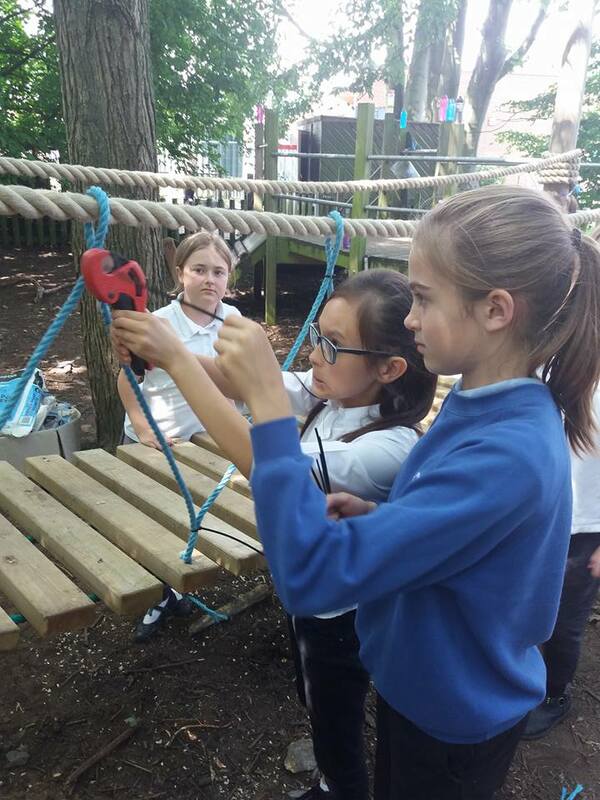 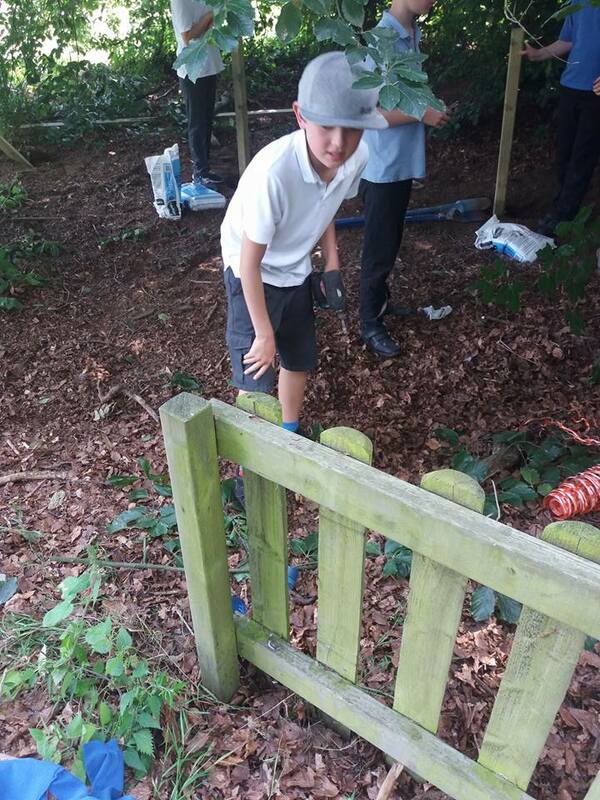 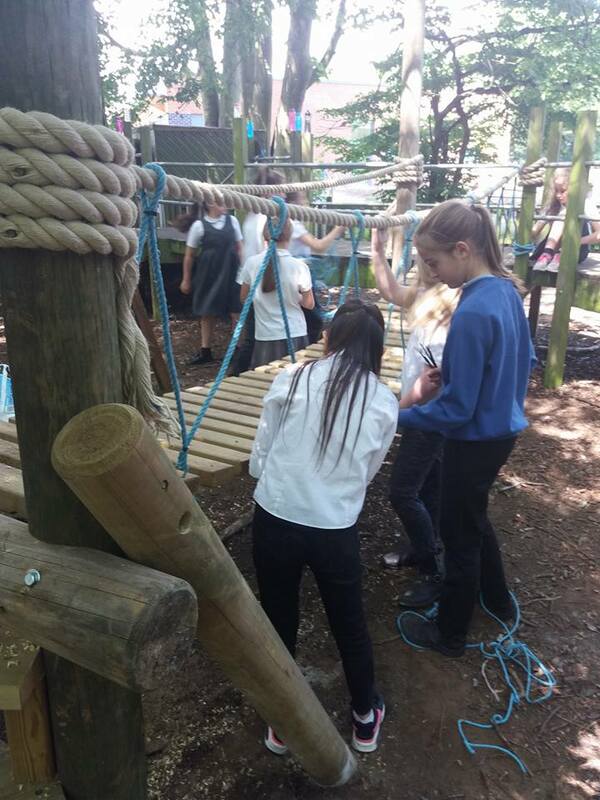 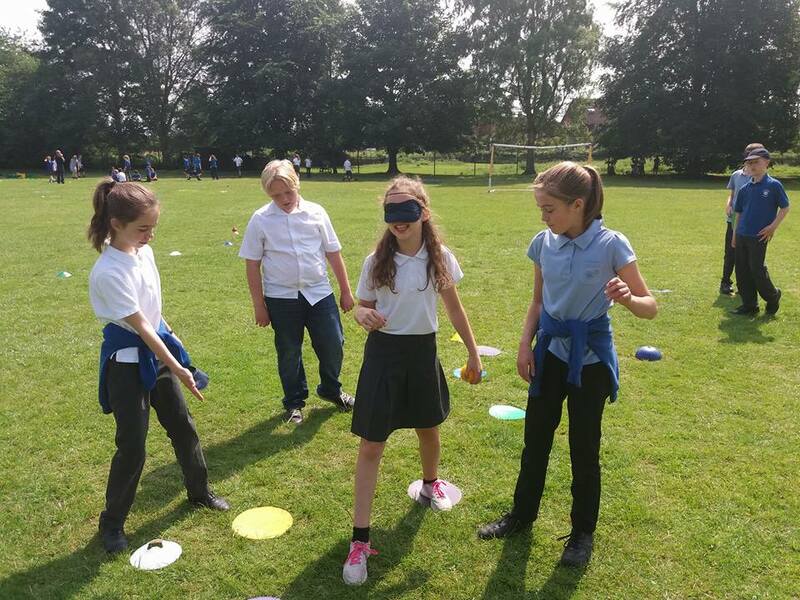 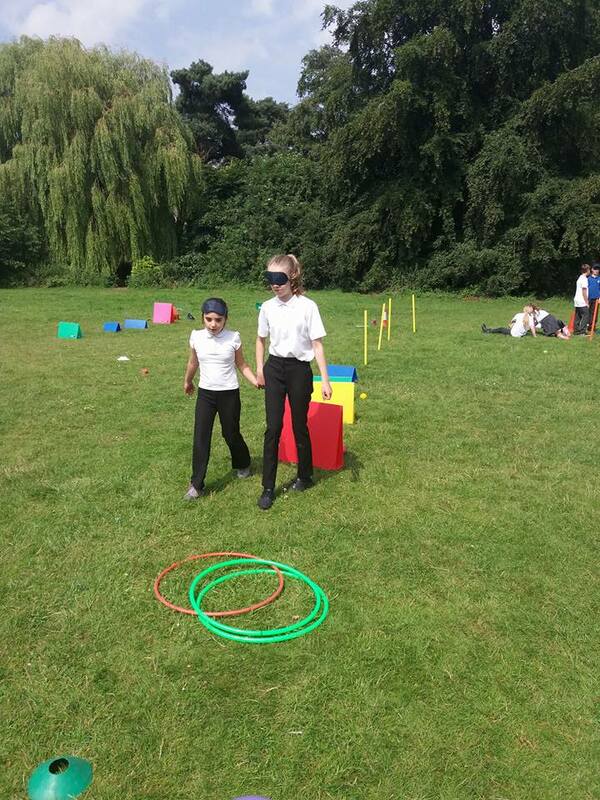 Year 6 created a blind-fold challenge course for each other. 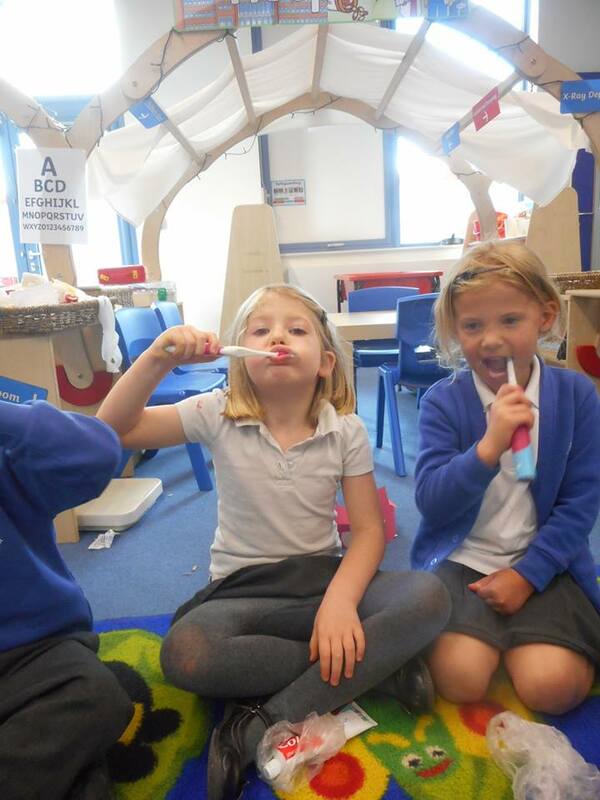 Their communication skills were really tested. 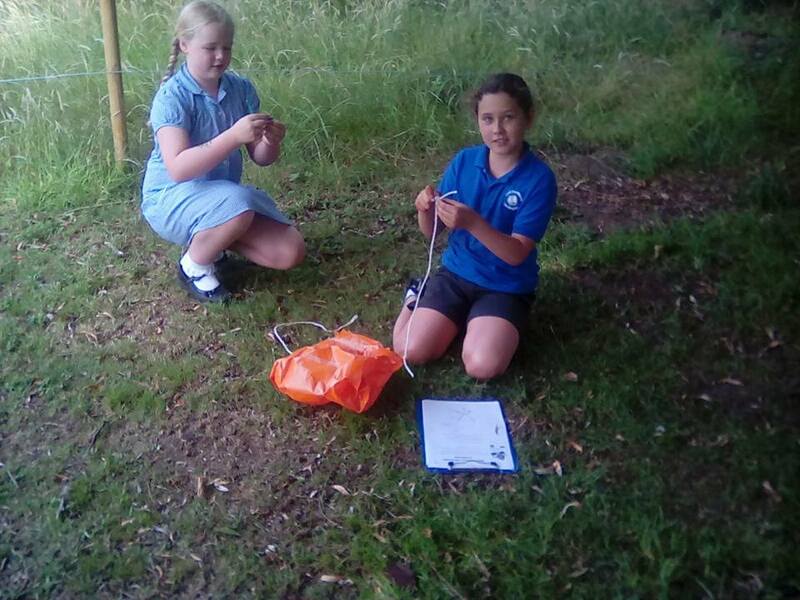 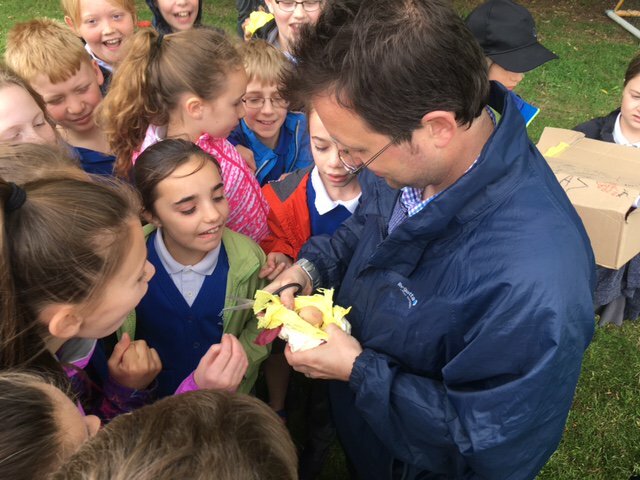 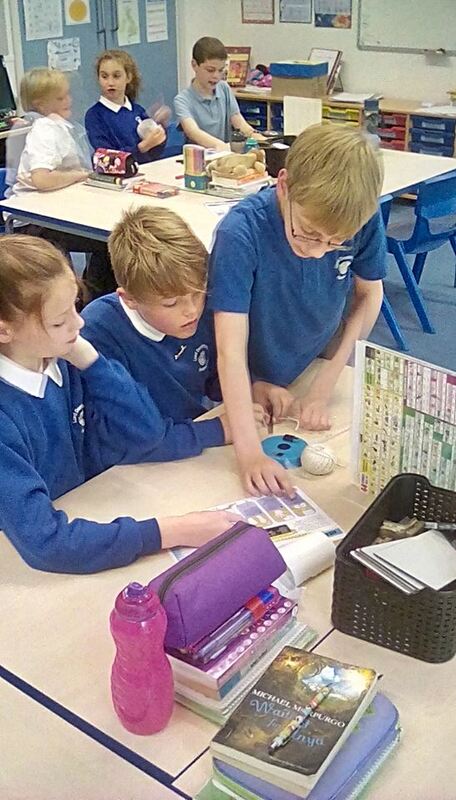 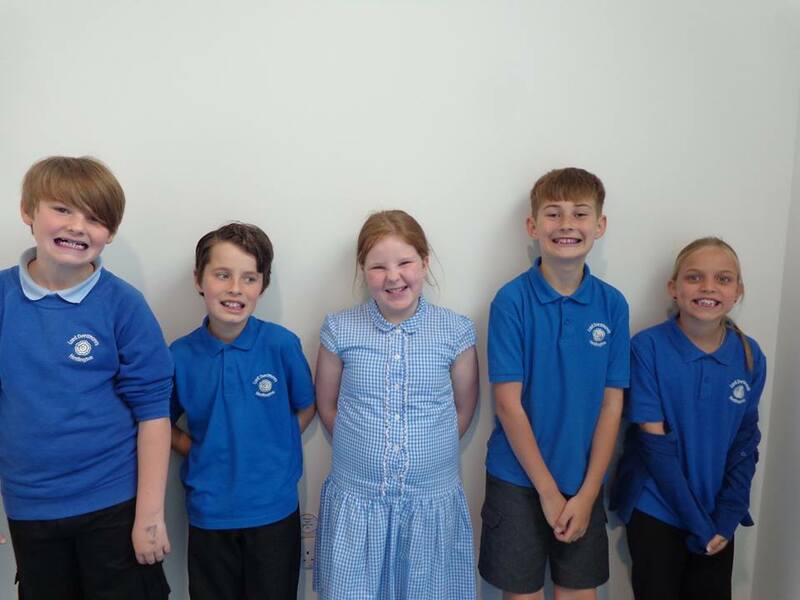 They also had a challenging scientific task – they had to get their egg to travel as far as it could (through the air) and come out unscathed after landing. 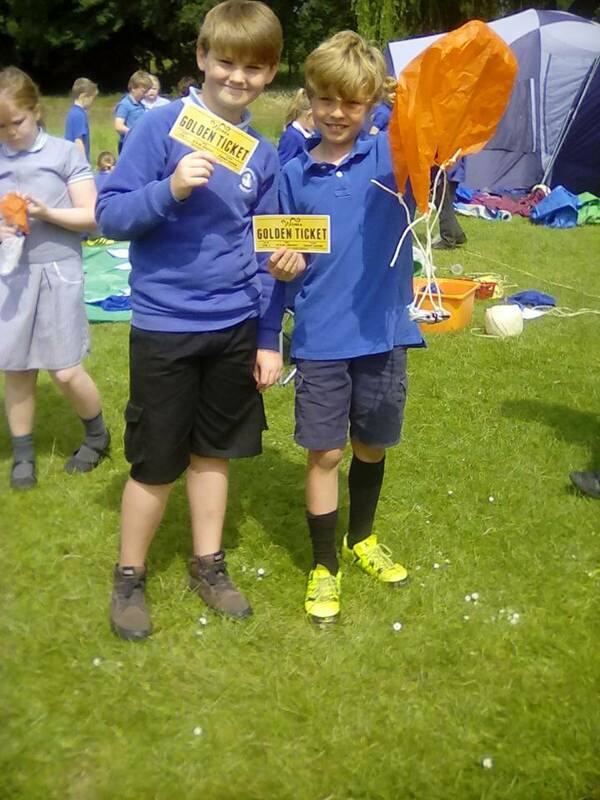 They had a 100% safety record! 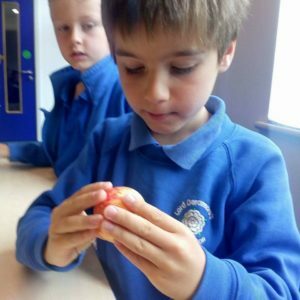 Science, Science Week, Summer 2017, What's Happening in School? 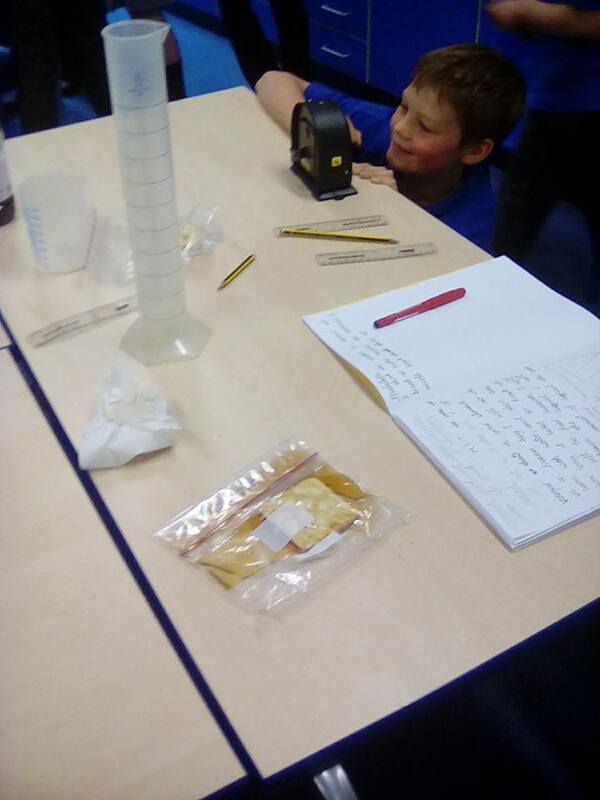 There were lots of investigations, experiments and fun this year in science week. 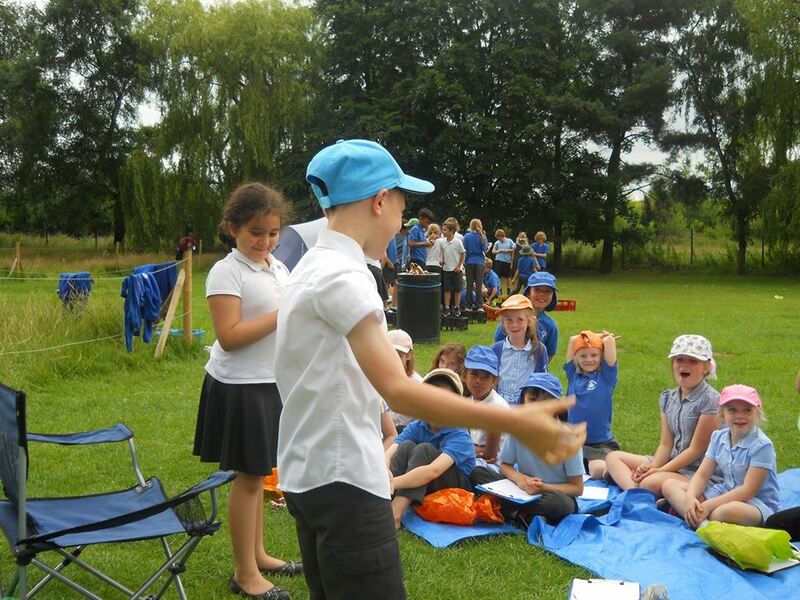 The theme was ‘Our Brilliant Bodies’. 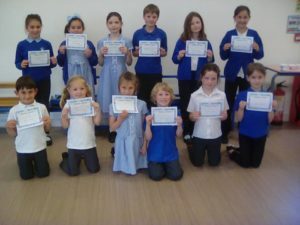 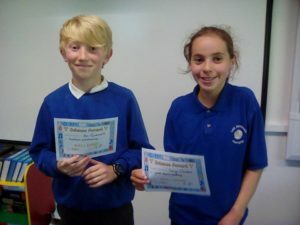 Certificates were presented in an assembly at the end of the week to ‘Super Scientists’ from each class. 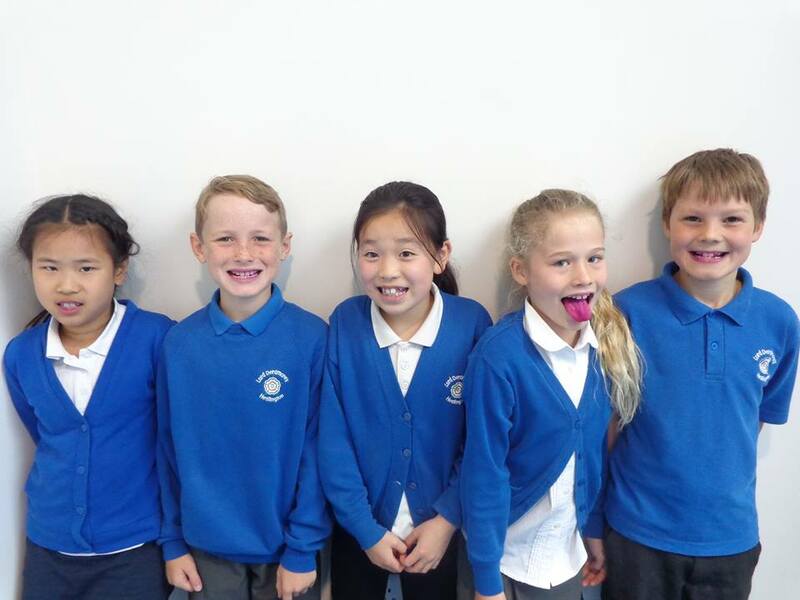 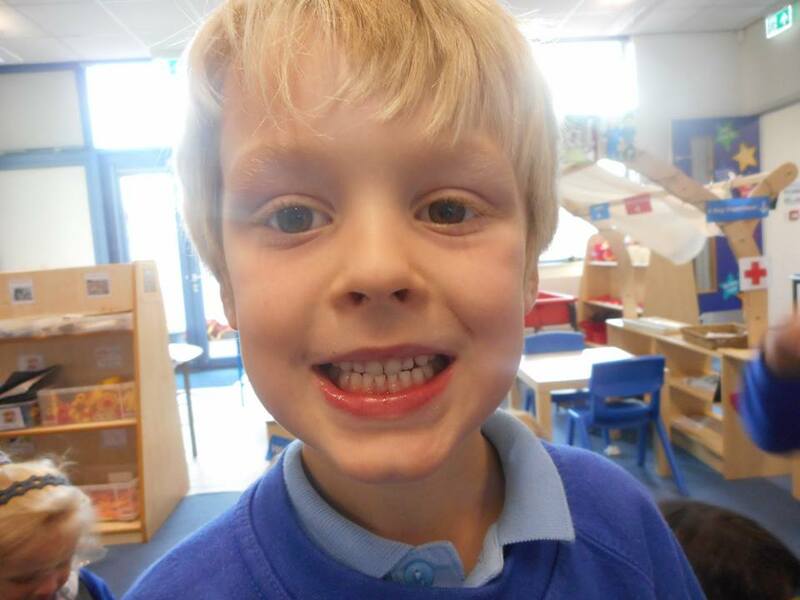 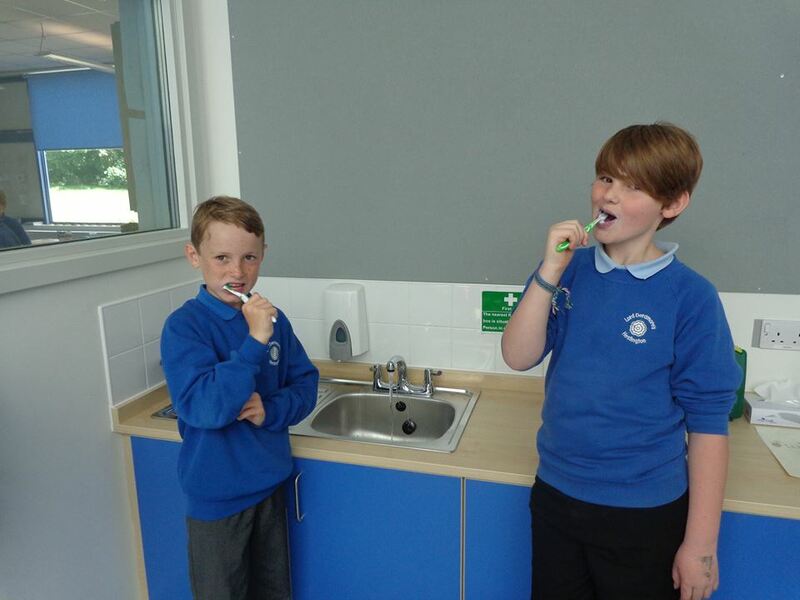 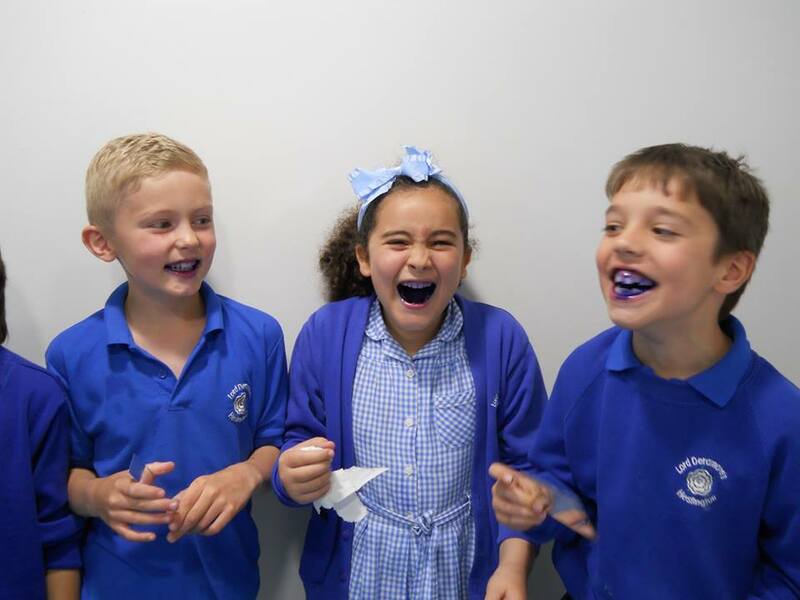 Years 3 & 4 have been learning about how to keep their teeth healthy. 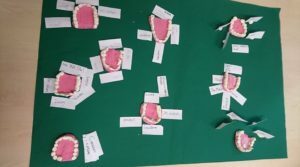 Year 4 made excellent models of different types of teeth. 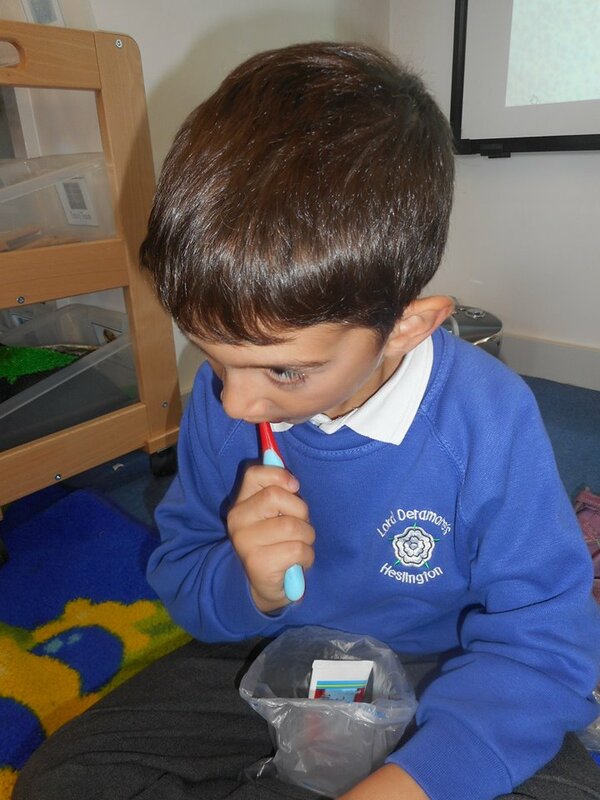 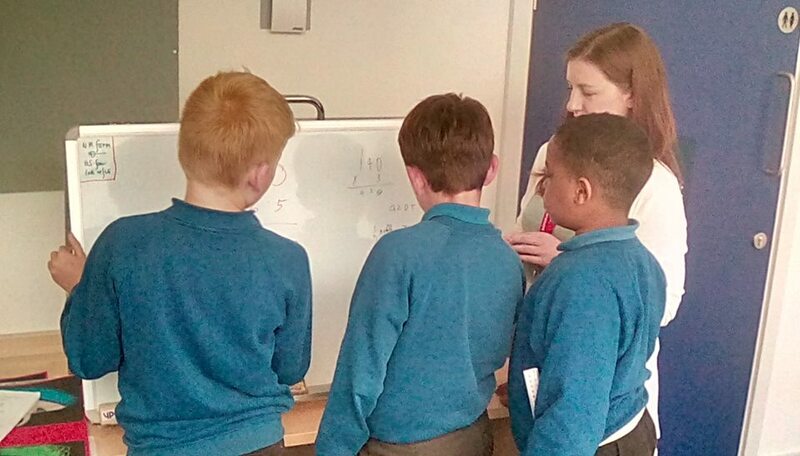 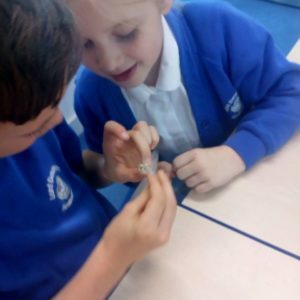 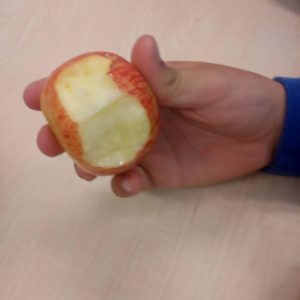 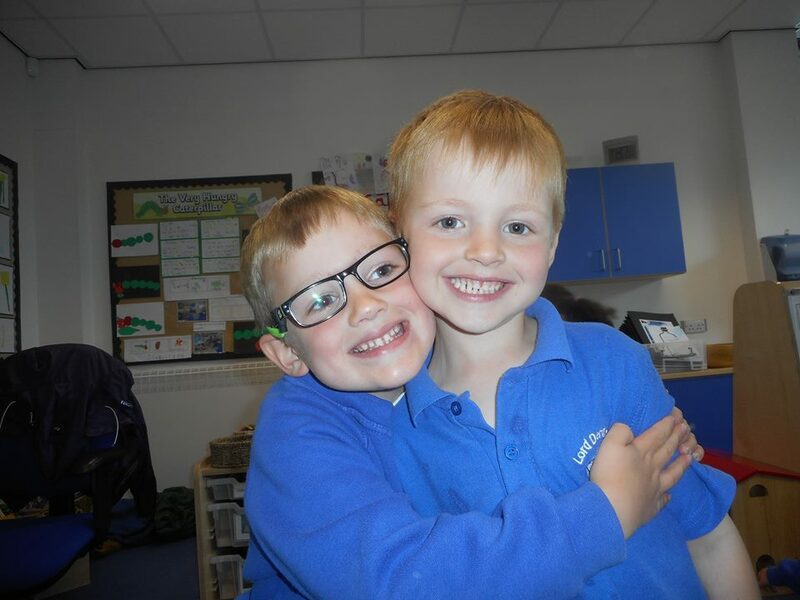 In Year 3 they ate apples to explore the functions of different teeth . . .
. . . and looked at the difference between milk teeth and adult teeth, brought in by Mrs King. 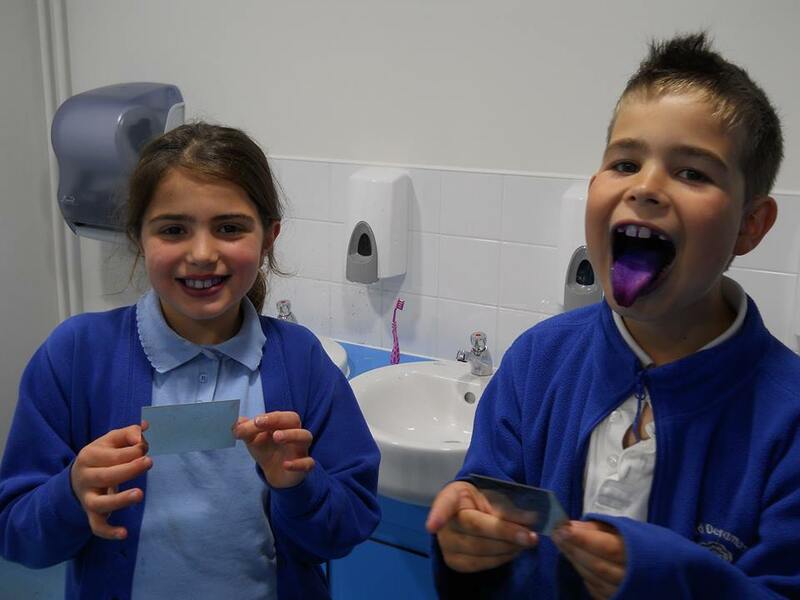 They investigated what foods are most damaging to our teeth and how to clean them most efficiently. 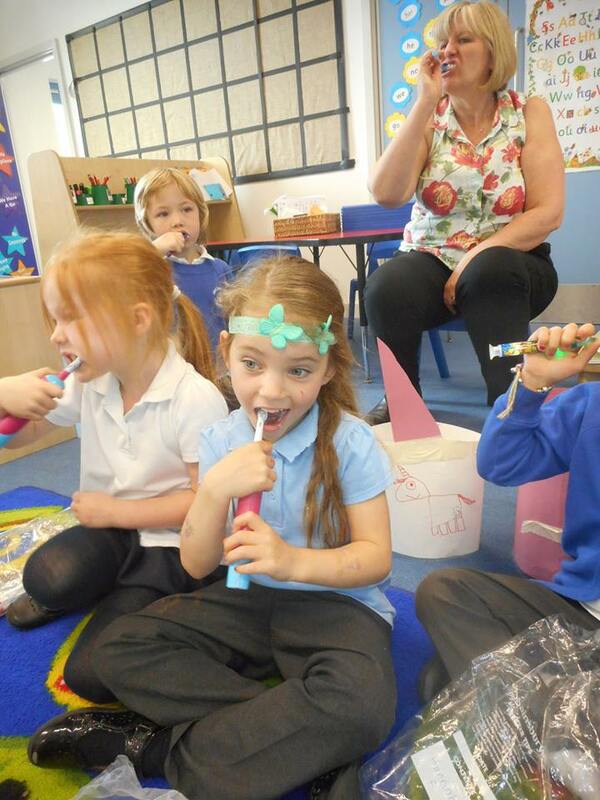 Using disclosing tablets they were able to see which teeth they were brushing the best and which needed a little bit more attention. 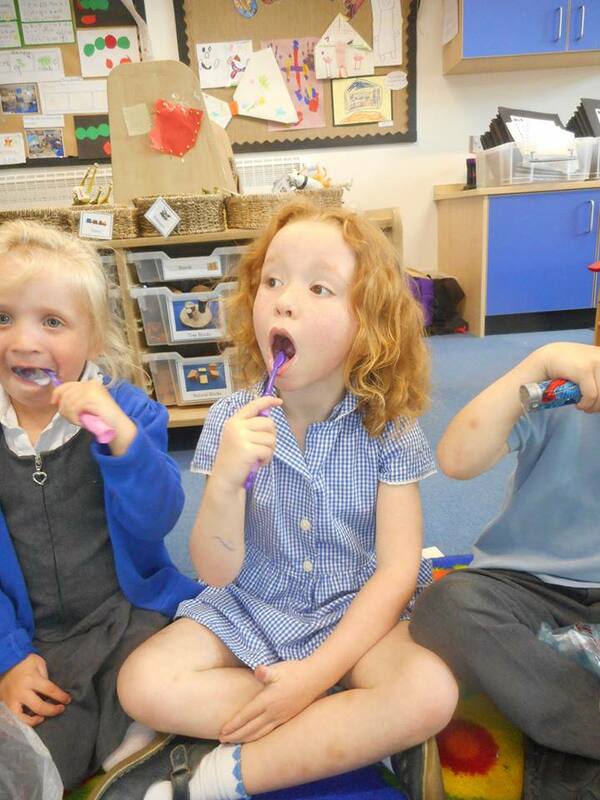 Then there was some serious brushing! 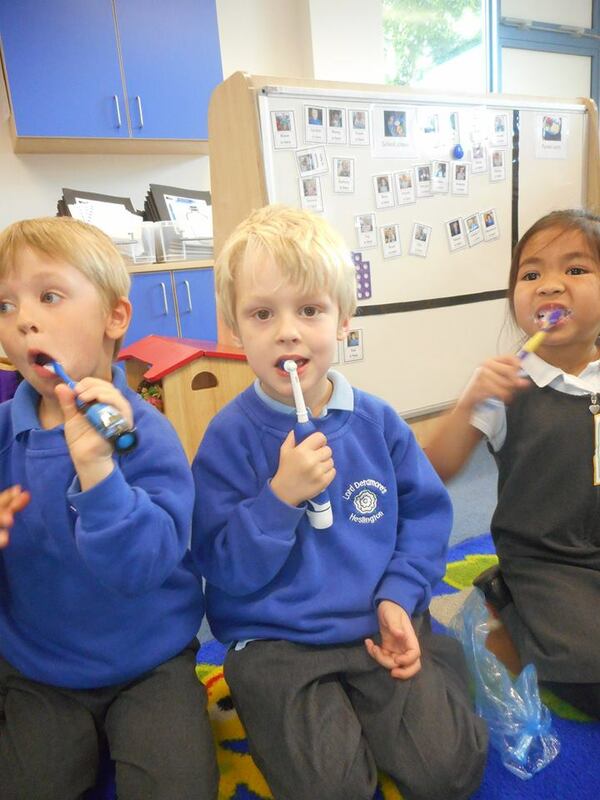 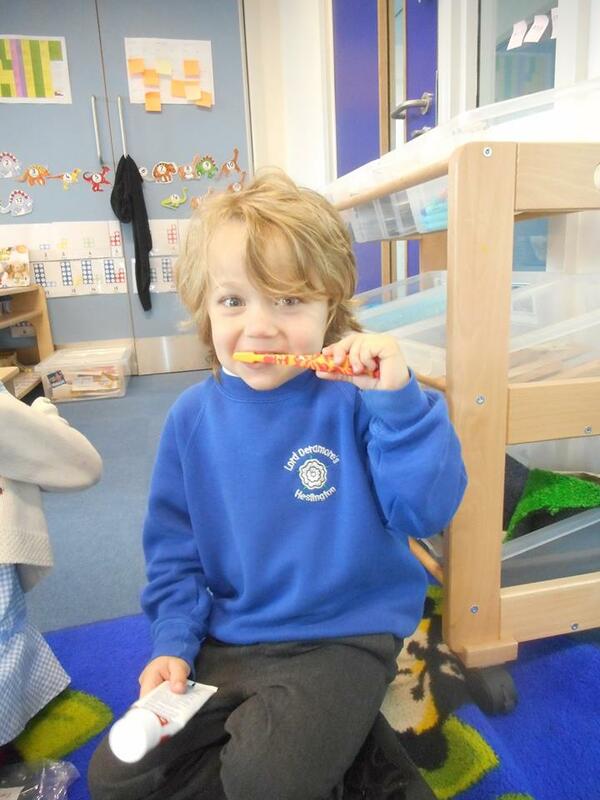 Even Early Years have been practising brushing their teeth. 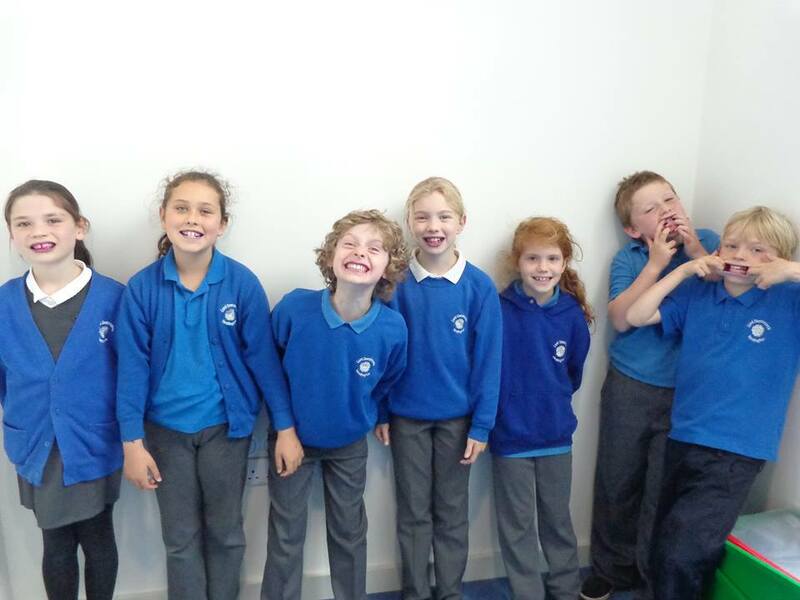 Look at all those dazzling smiles! 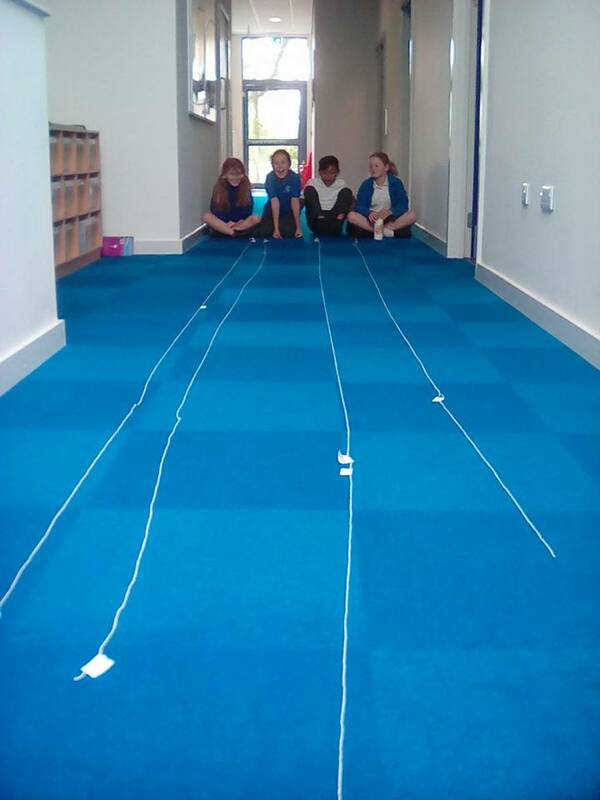 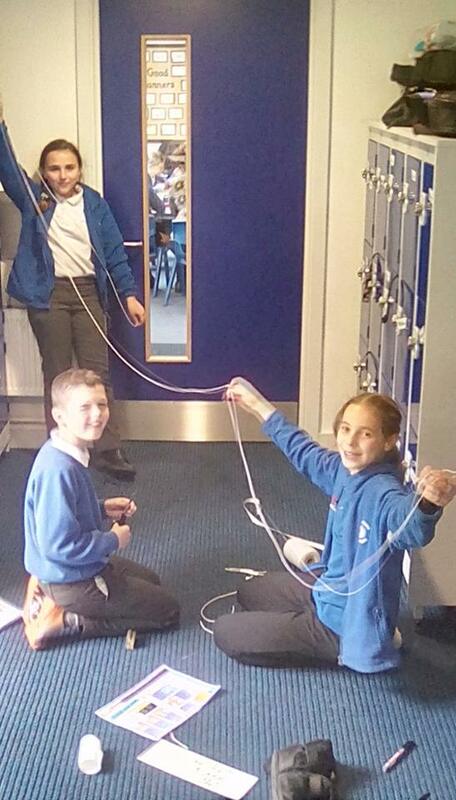 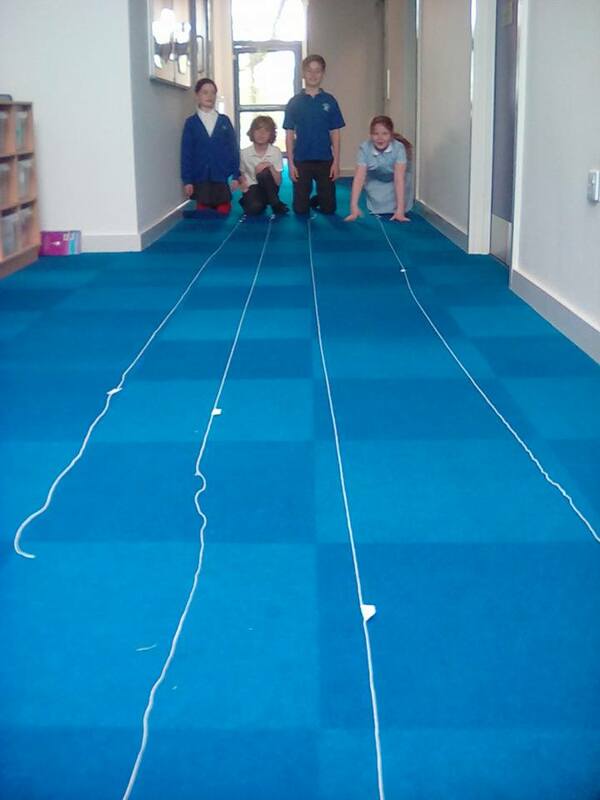 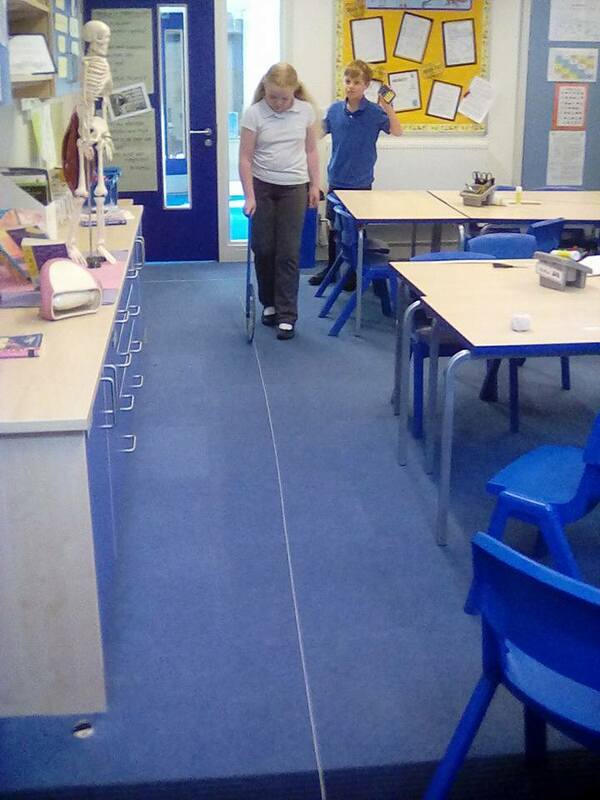 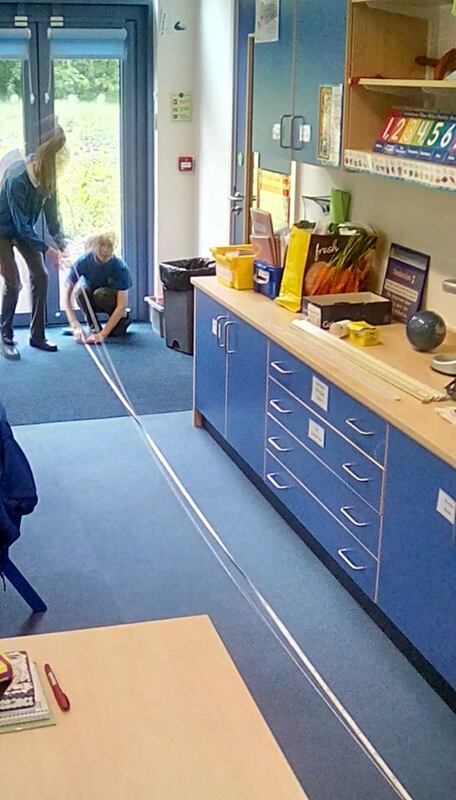 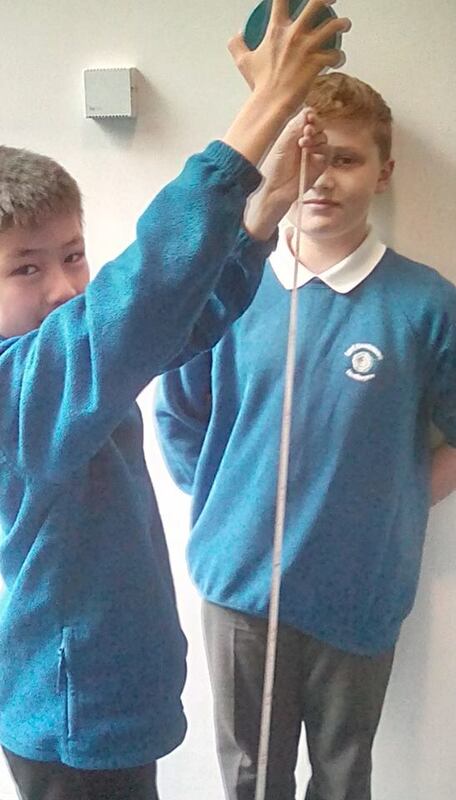 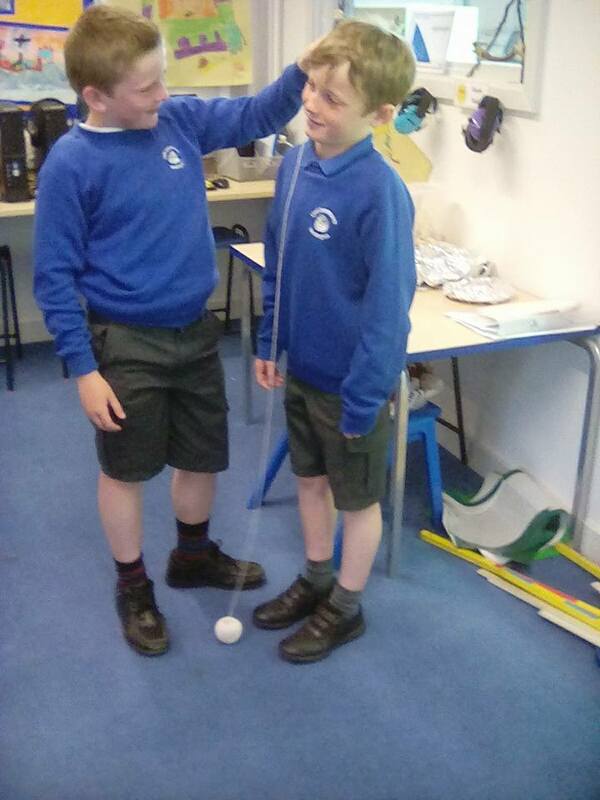 Years 4 & 6 have been calculating the length of various parts of their digestive systems and replicating them with pieces of string. 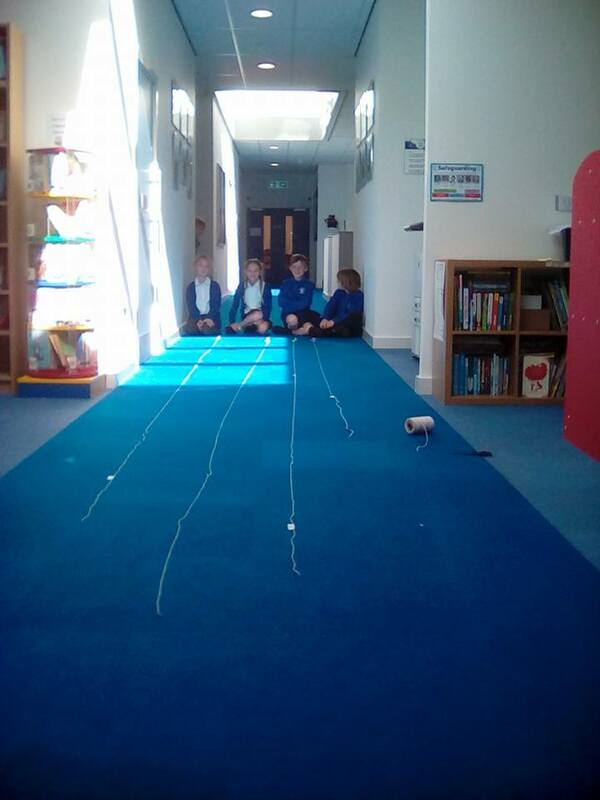 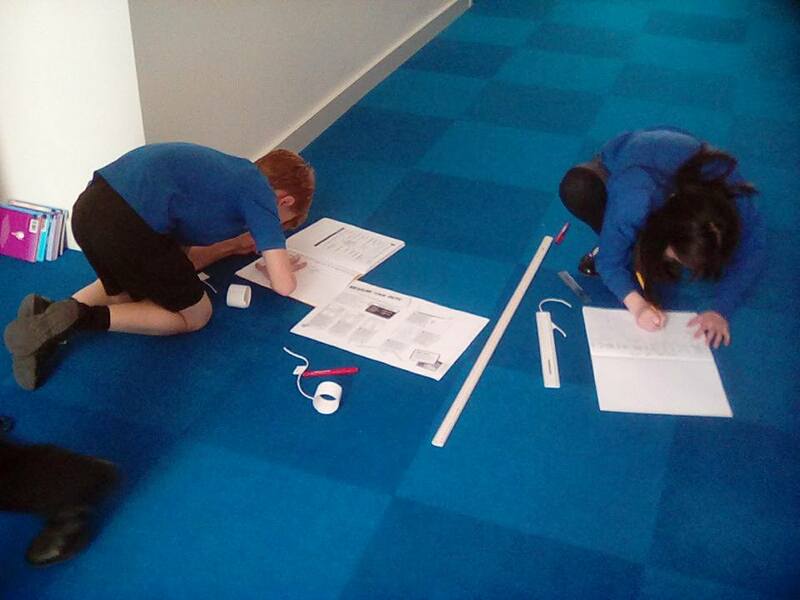 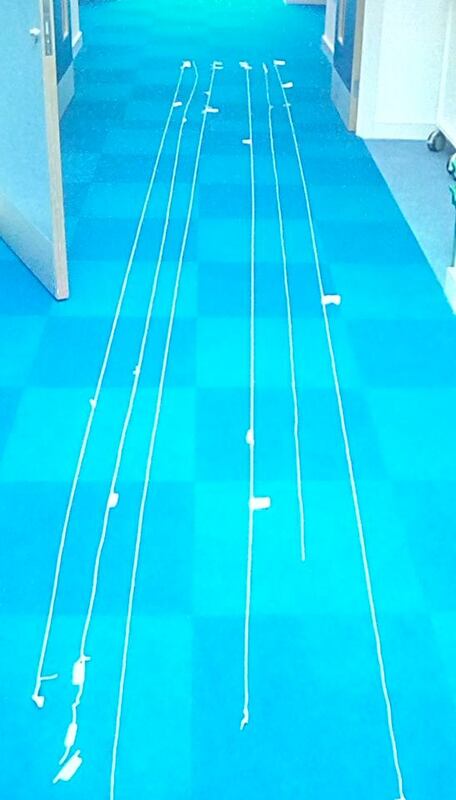 The total length of each digestive system varied between 6 and 9 metres! 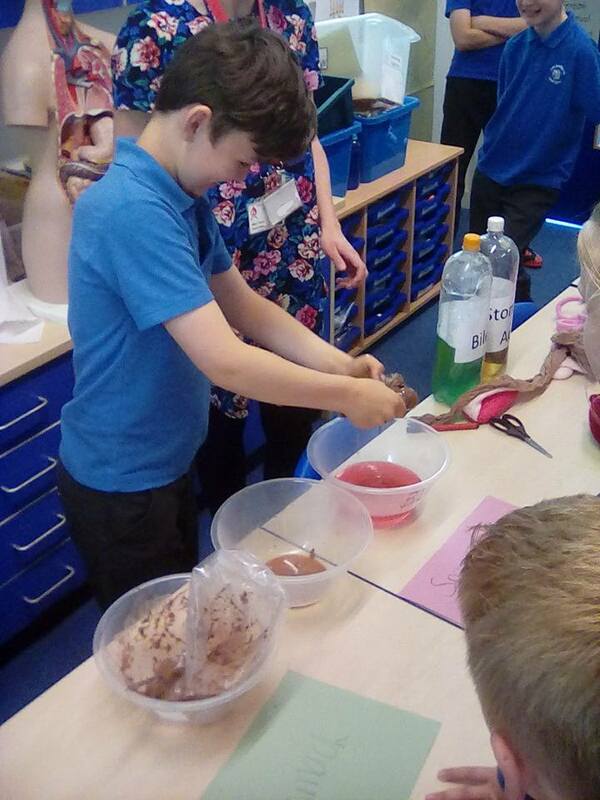 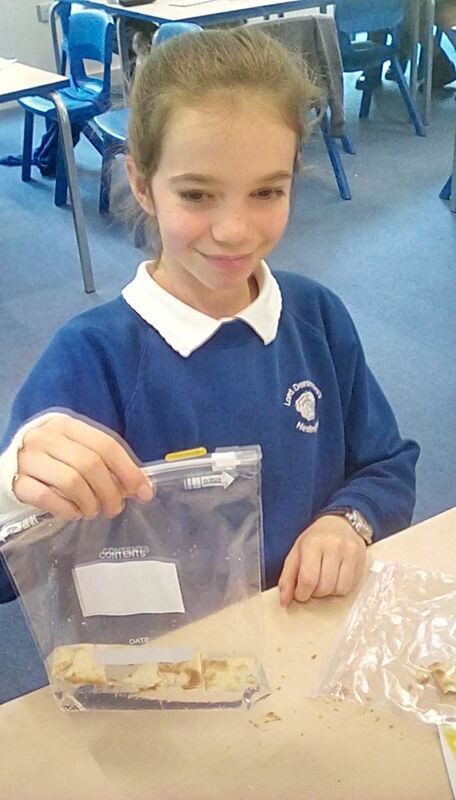 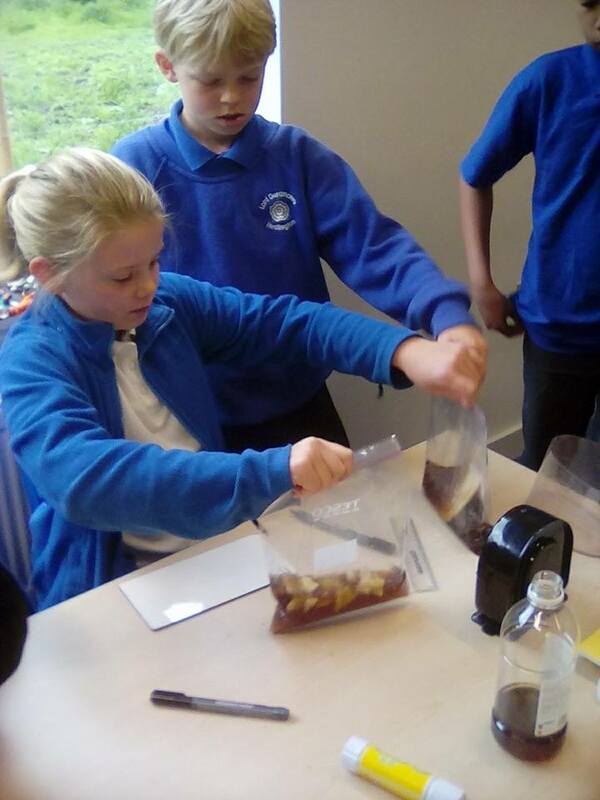 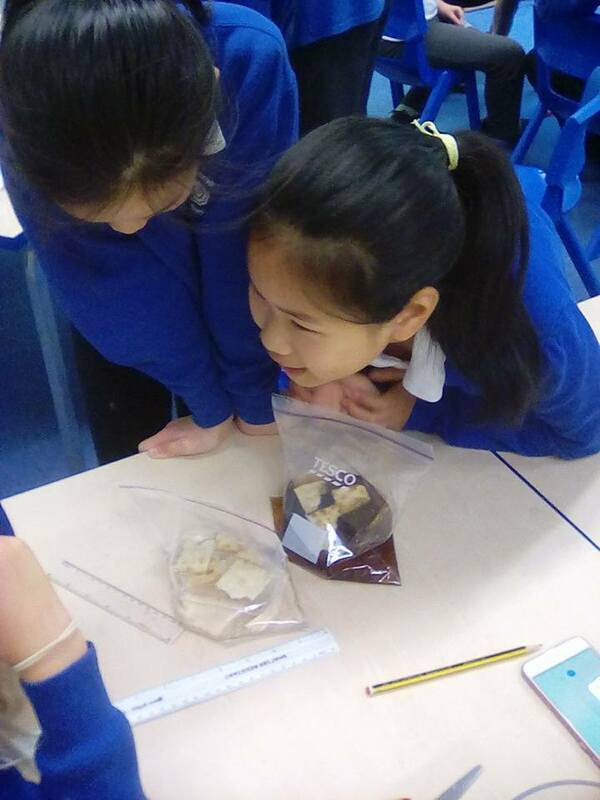 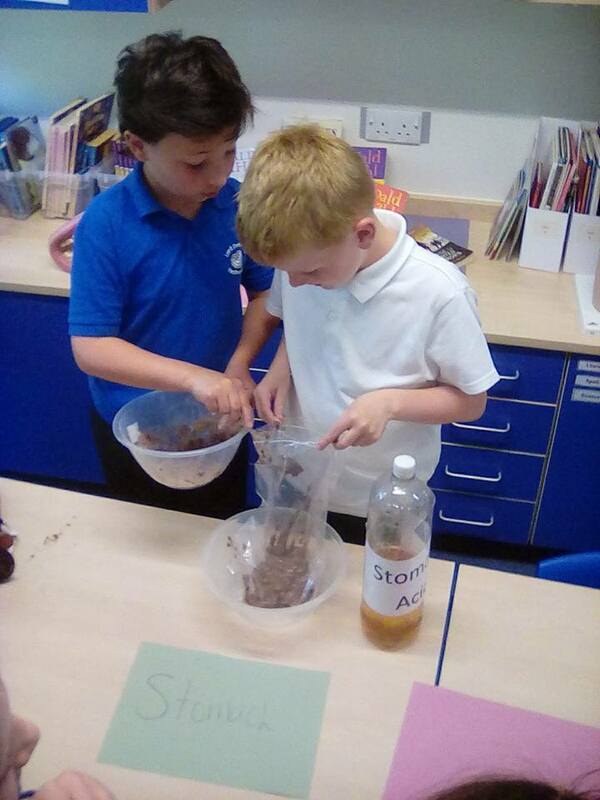 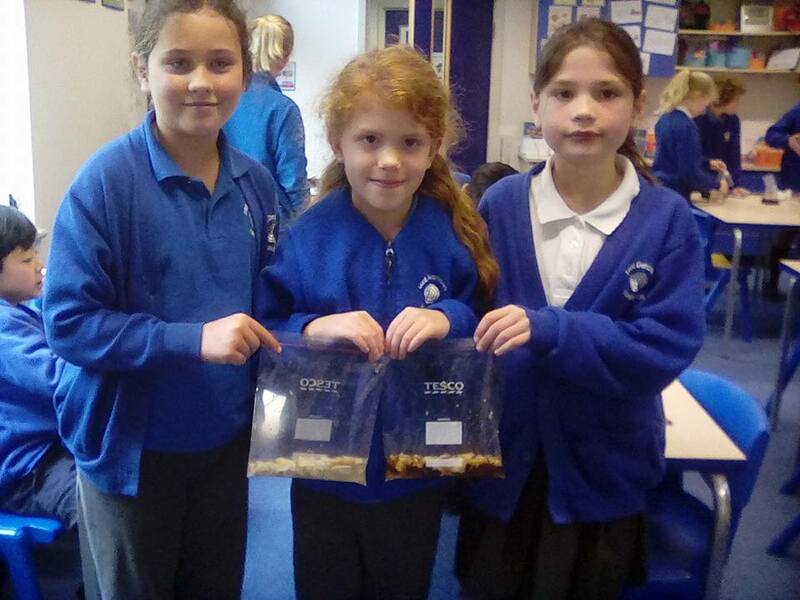 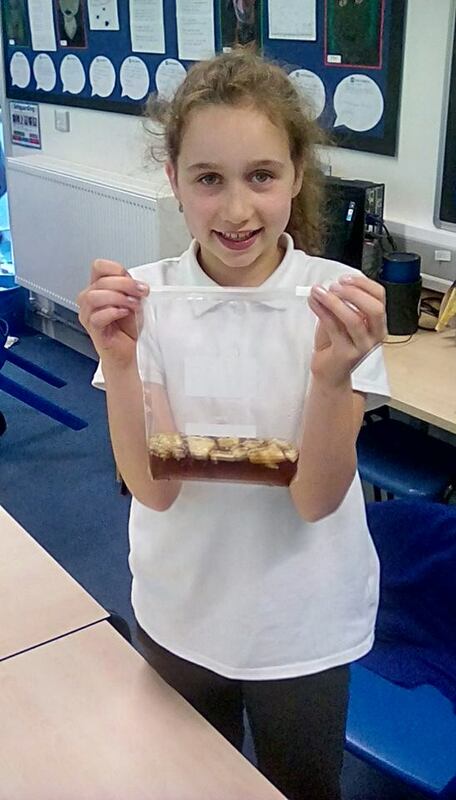 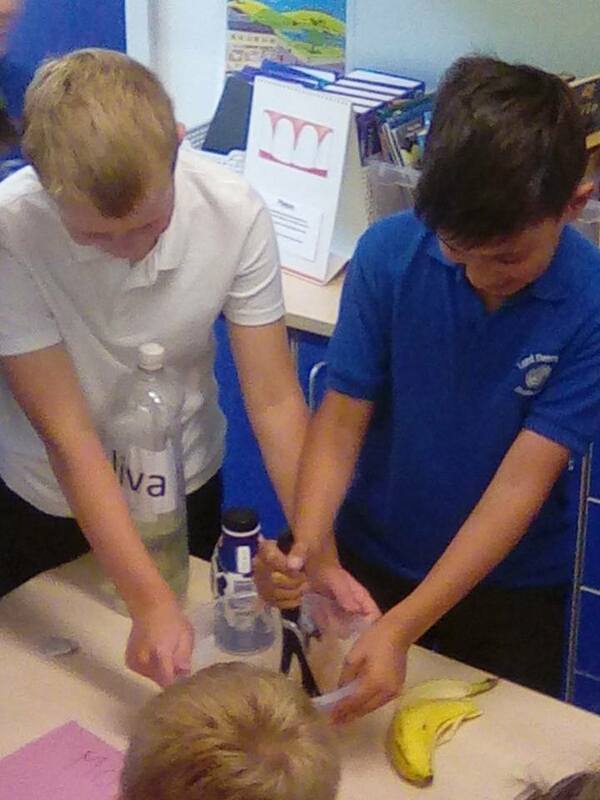 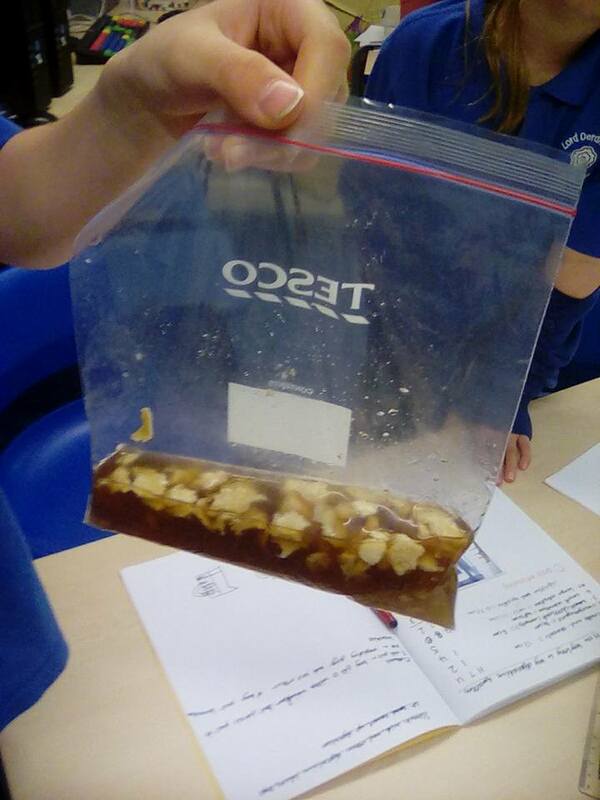 Year 4 investigated the effect of different liquids and the size of food on digestion. 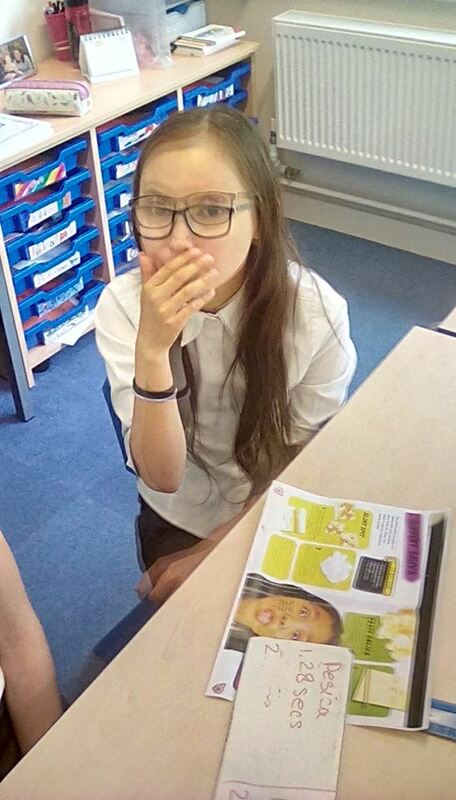 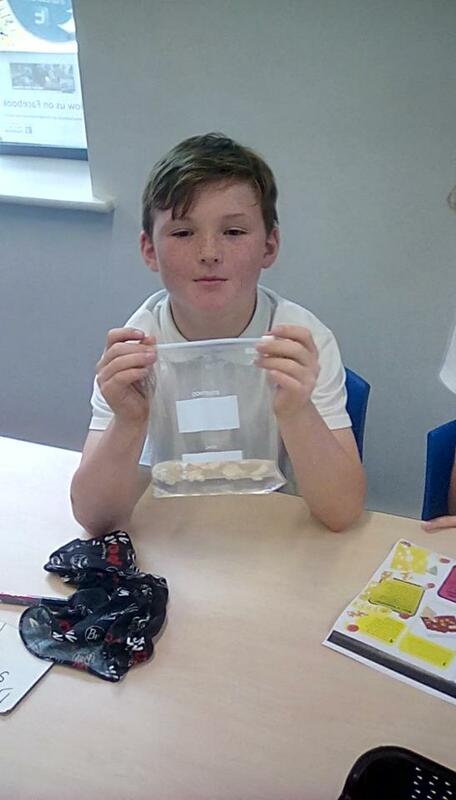 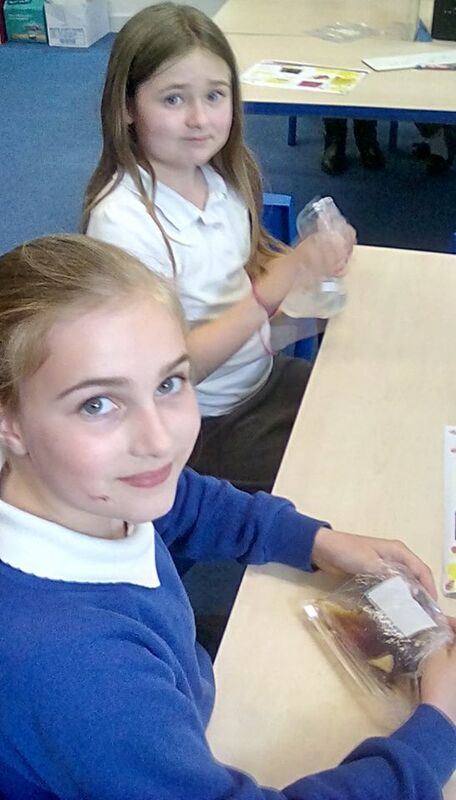 Year 6 have tried to eat with a dry mouth and made their own stomachs! 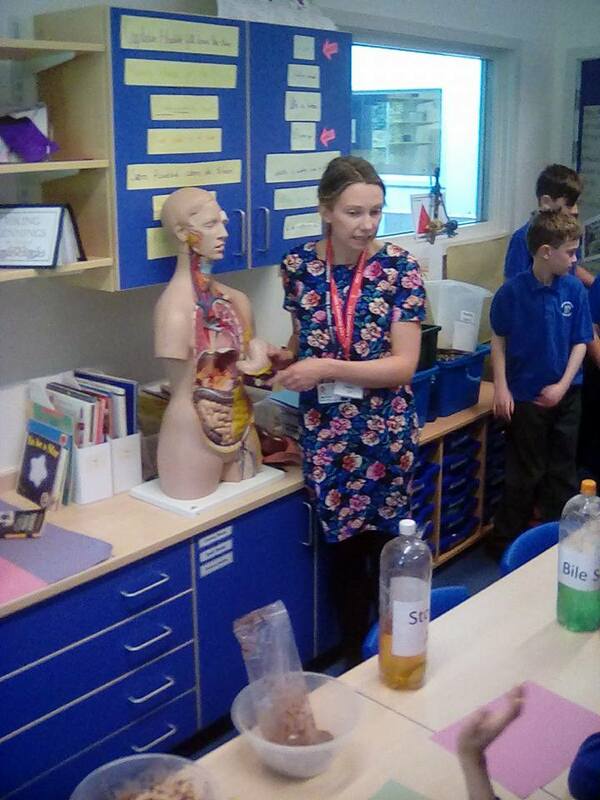 Thank you to Ms Bunn, from Archbishop Holgate’s School, who came and showed Year 5 a whole digestive system with knitted intestines!